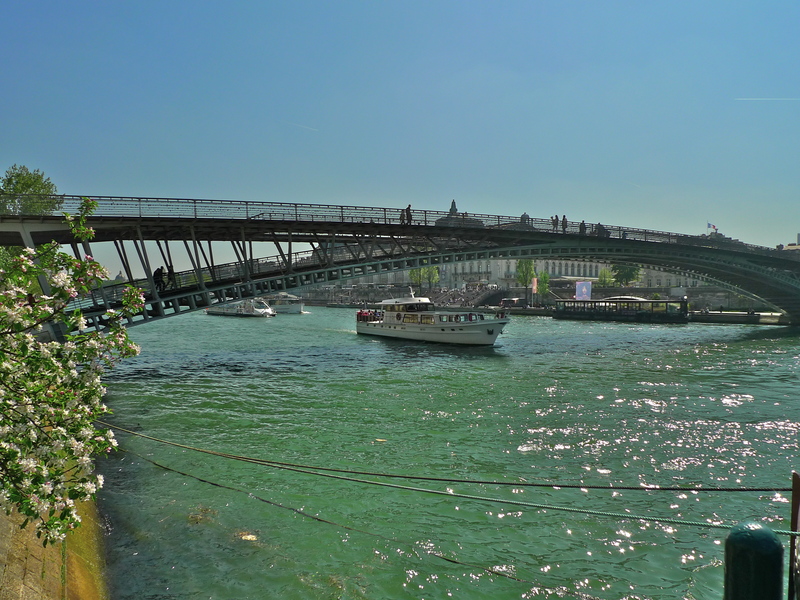 OF THE THIRTY-SEVEN bridges that cross la Seine within the Paris city limits four of them are pedestrian footbridges or “passerelles piétonnières”. 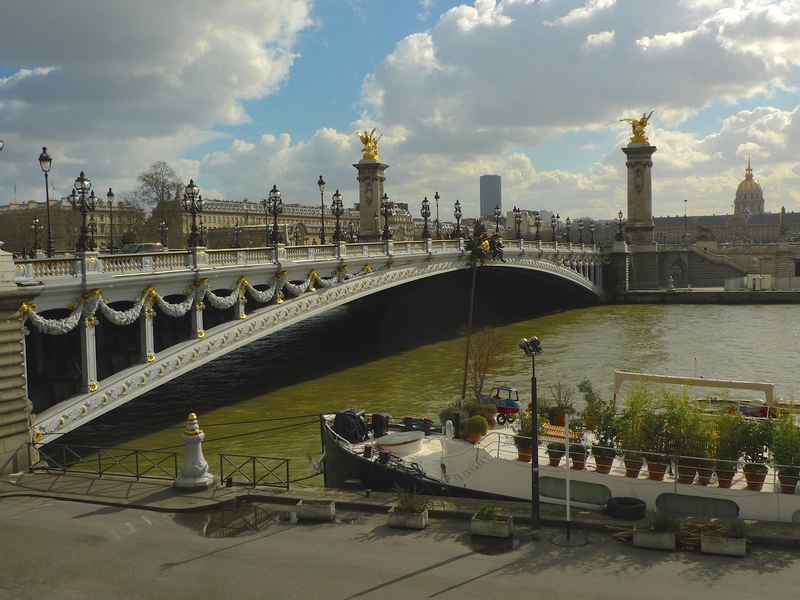 As part of my ‘Paris Bridges’ project I’ve been to explore one of them, the Passerelle Senghor or to give it its full name, the Passerelle Léopold Sédar Senghor. 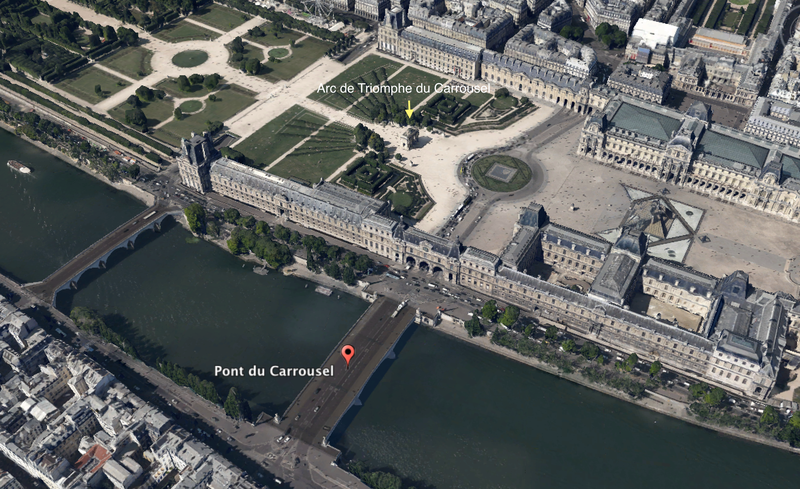 and the Jardin des Tuileries on the Right Bank. 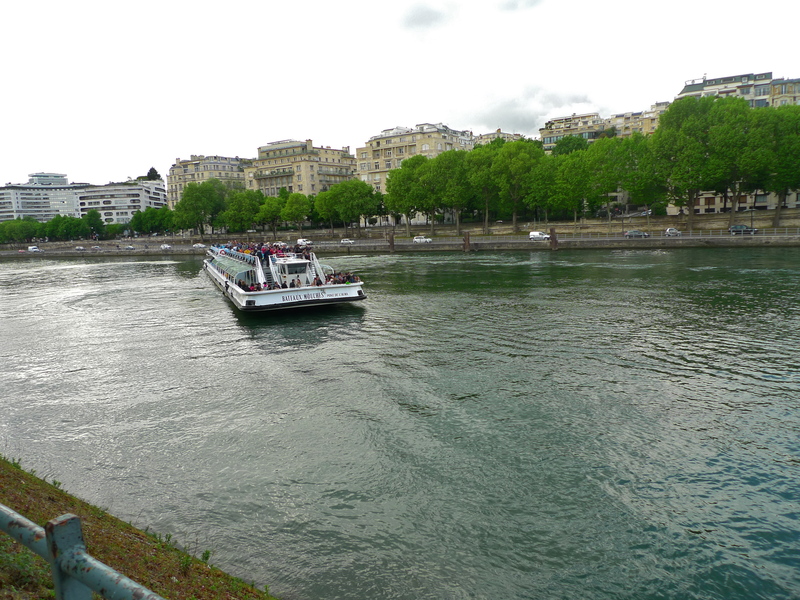 It was in 1861 when the first bridge to cross la Seine at this point was opened. 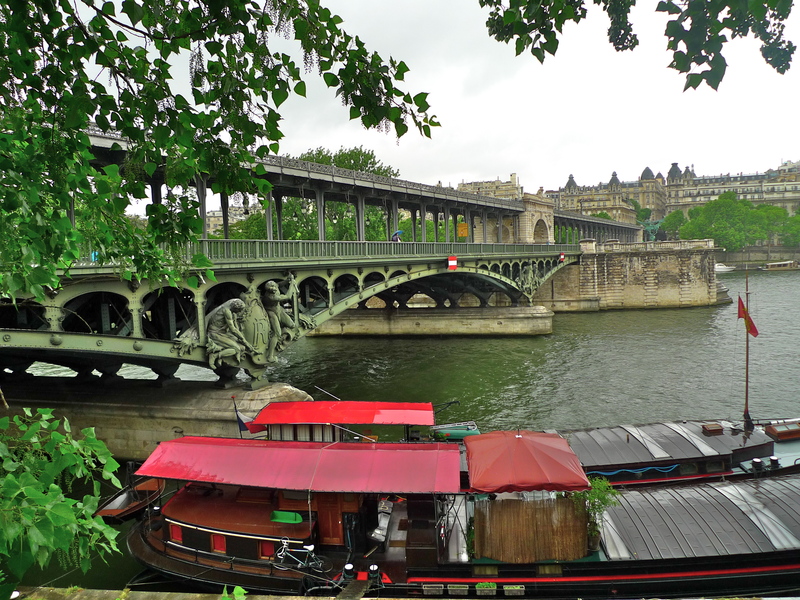 It was a three-arch cast iron bridge built for vehicular traffic. 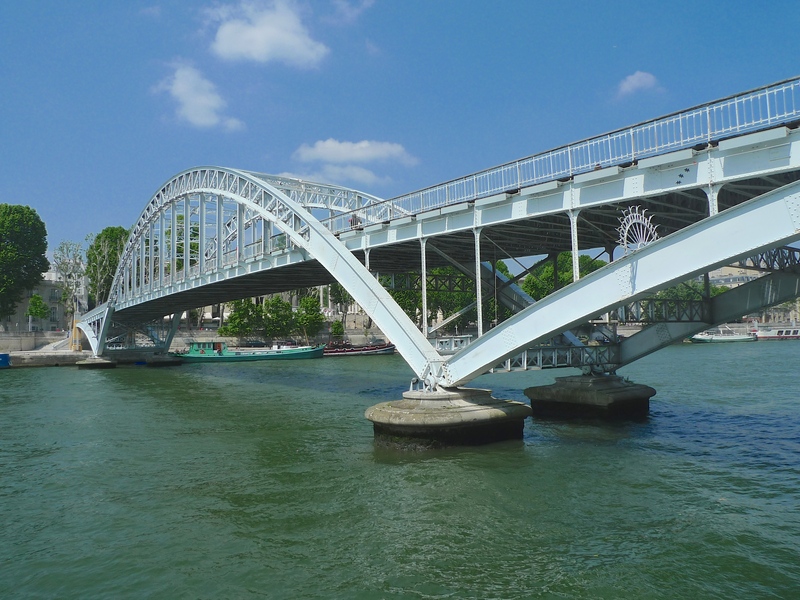 Built by the French engineers, Paul-Martin Gallocher de Lagalisserie and Jules Savarin, the bridge was named Pont de Solférino after the 1859 French victory of the Battle of Solférino. 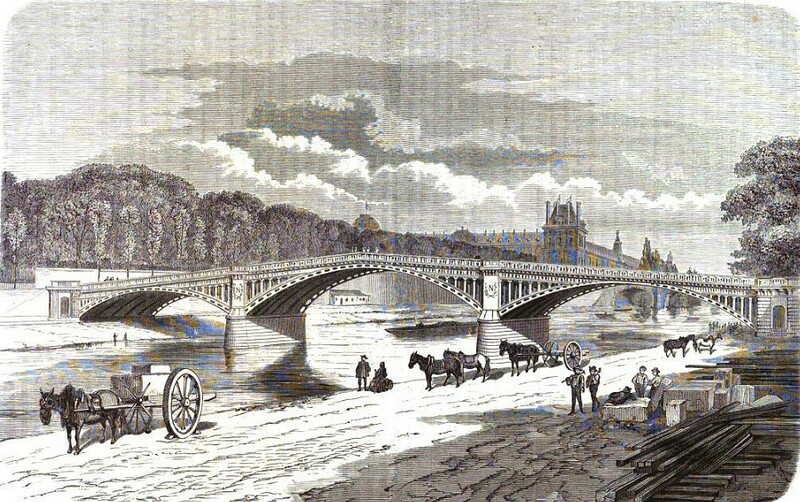 Image – Annales des Ponts et Chaussées – 4ème série – Mémoires et Documents, Tome 8 – 1864 – p207-209. 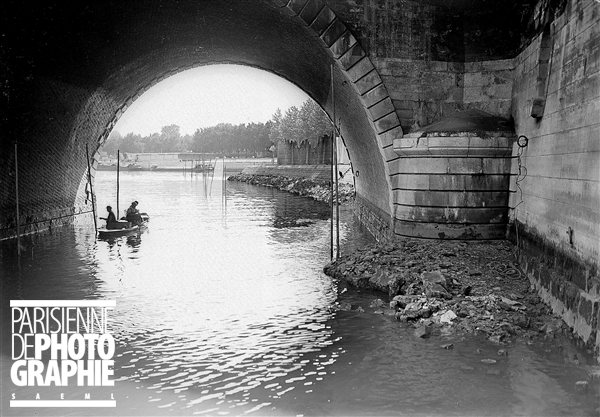 This bridge survived for a century before wear and tear took its toll and it was demolished and replaced in 1961 with a steel footbridge, which survived until 1992. 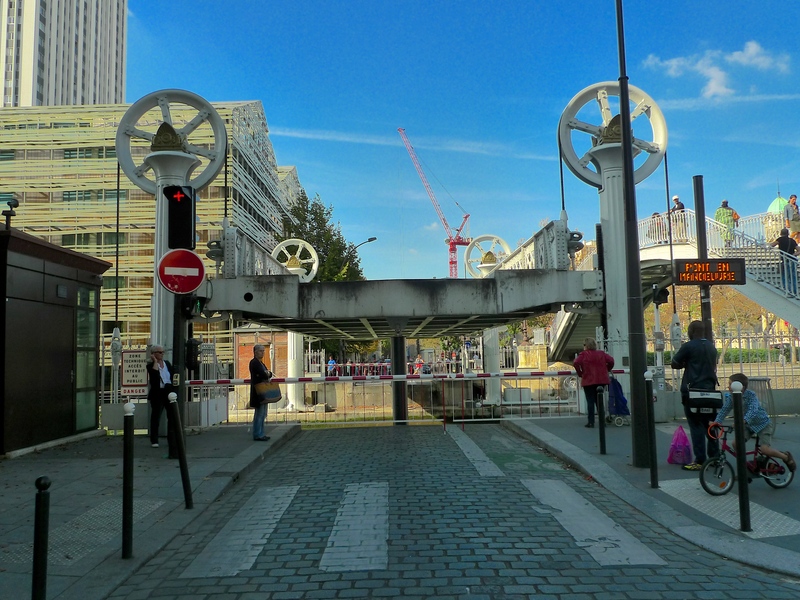 Work began on a new footbridge in 1997. 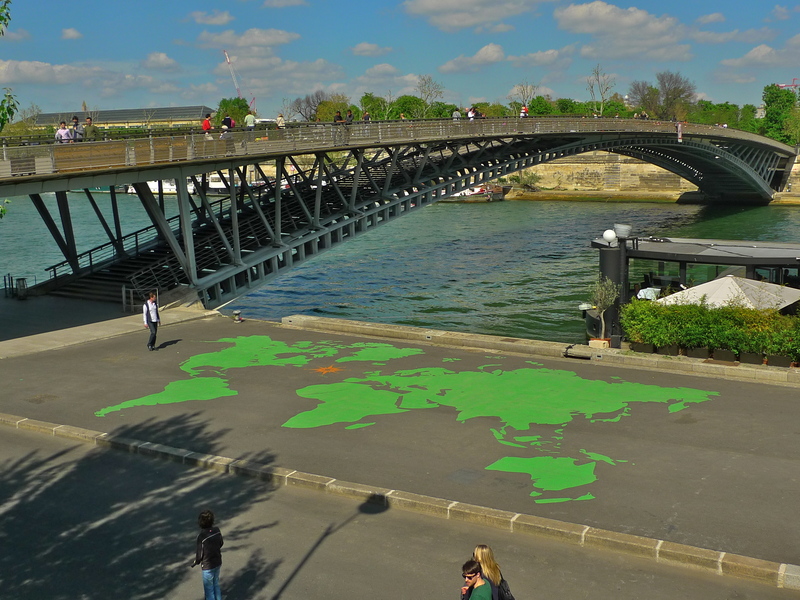 Designed by the French architect, Marc Mimram, the bridge crosses the river in a single span with no intermediate support. 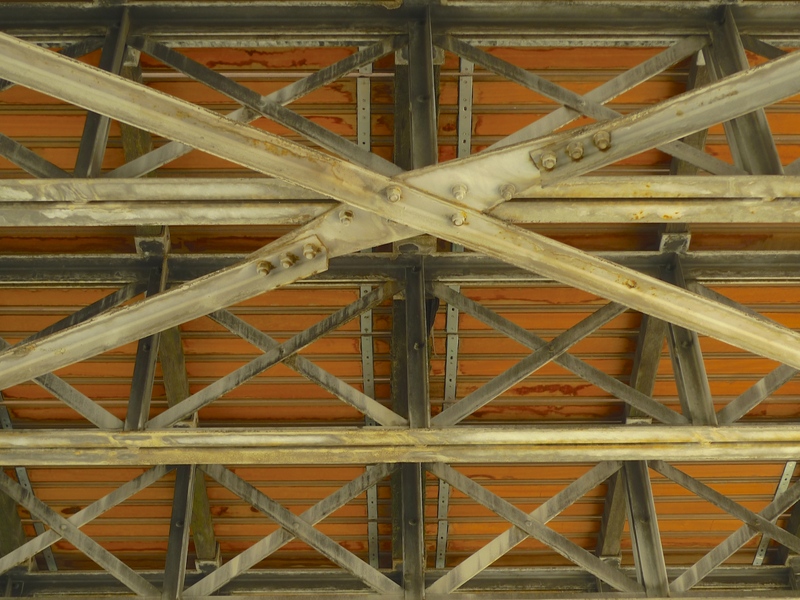 The sweeping steel span is anchored by means of two abutments, one at each end, which sink fifteen metres below ground. 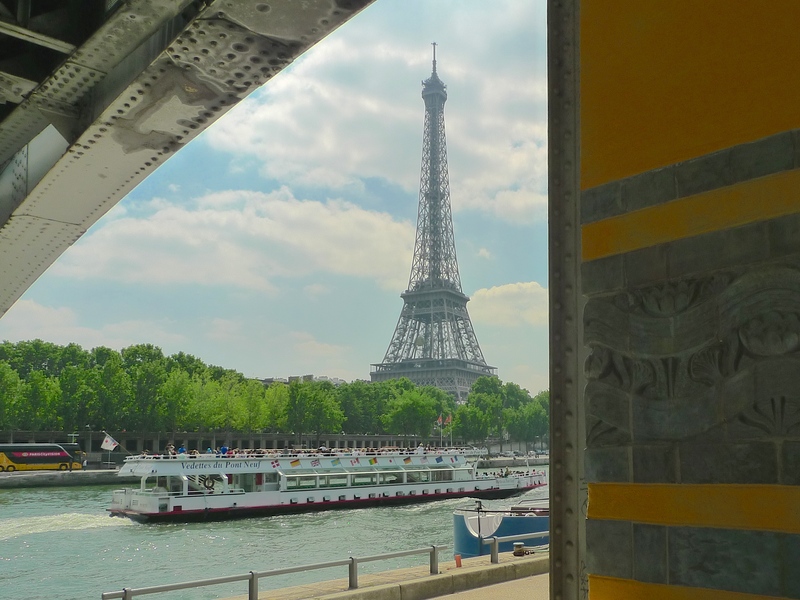 The French engineering company, Eiffel Constructions Métalliques, part of the Eiffage Group, were responsible for the metal components of the bridge and of course, Eiffel Constructions Métalliques is descended from the same company that made the Tour Eiffel, the Statue of Liberty and in more recent times the spectacular Millau Viaduct. 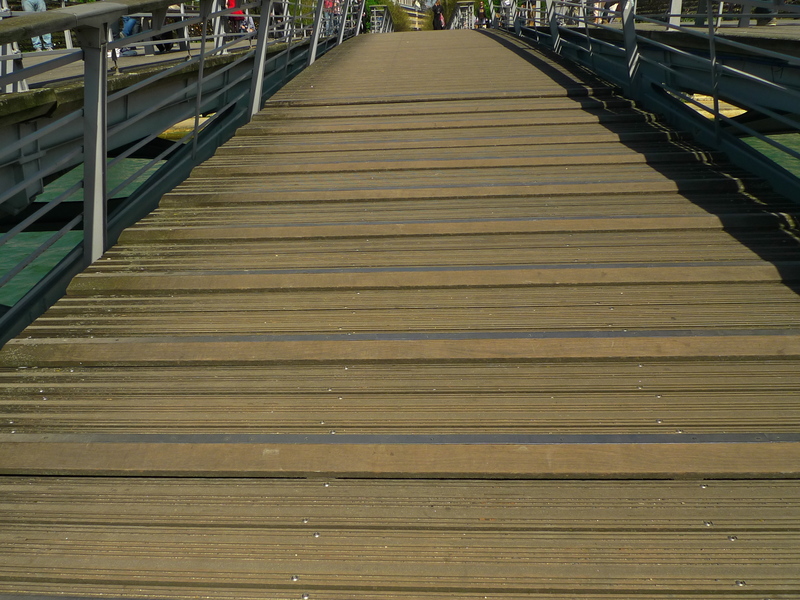 The walkways on the bridge are made from the exotic hardwood, Lophira alata, commonly known as azobé, or red ironwood. 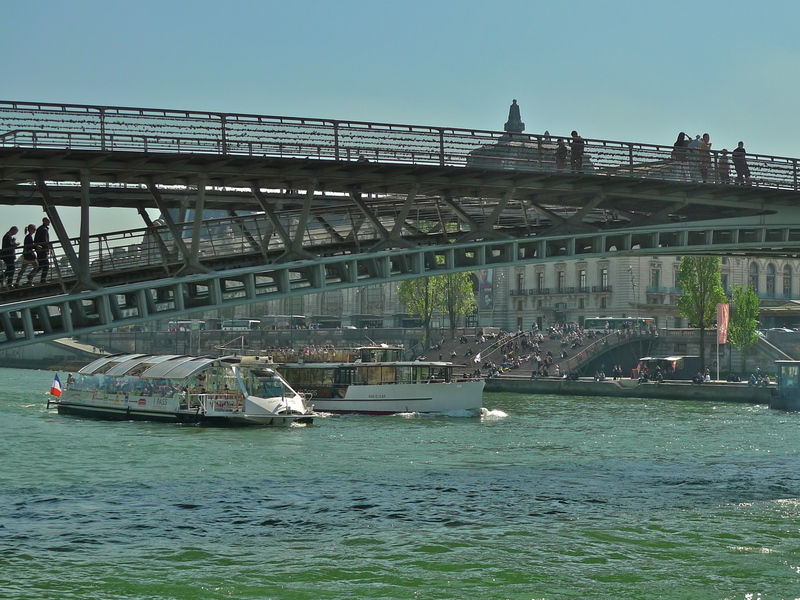 This new bridge, the Passerelle Solférino, was opened on 14th December 1999 but not without controversy. 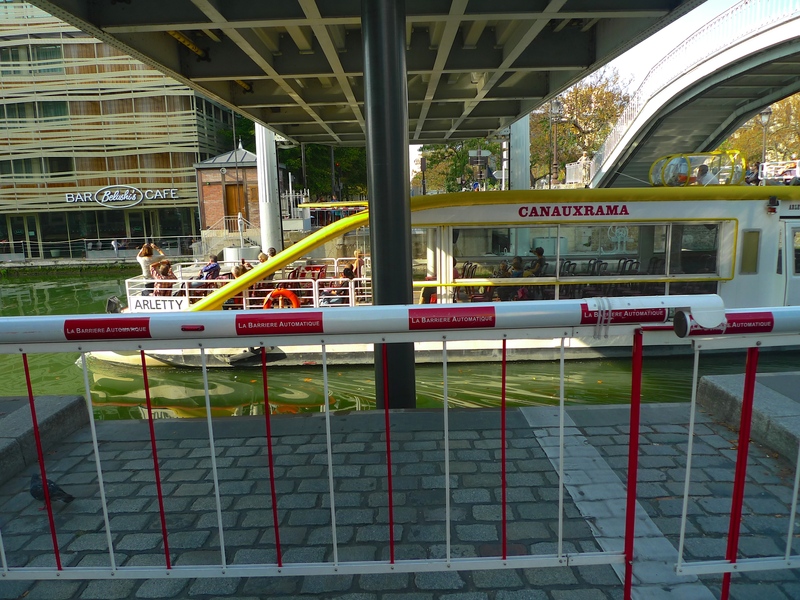 There were complaints about the lack of accessibility for people with reduced mobility, environmentalists complained about the choice of wood for the walkways and others complained that when wet the walkways would be dangerous. 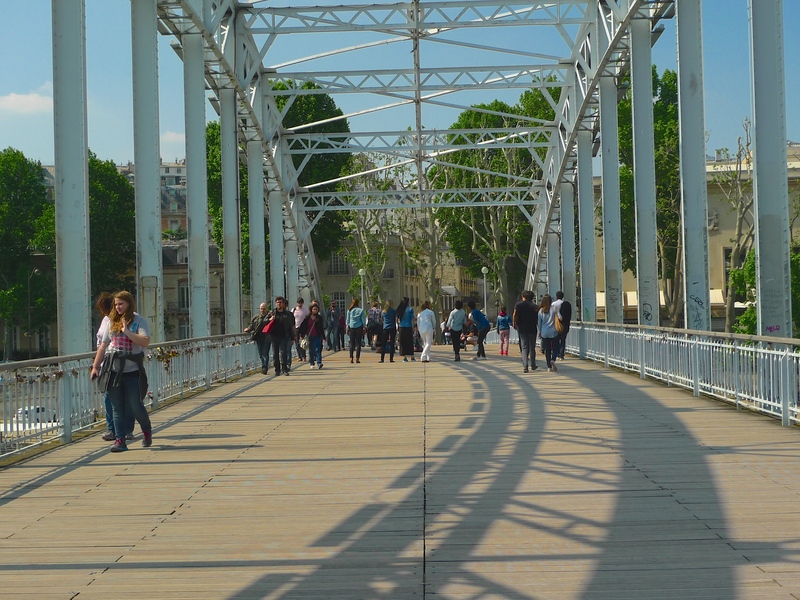 Most serious of all was that on the opening day several of the guests said that they could feel the bridge swaying as they stood on it. 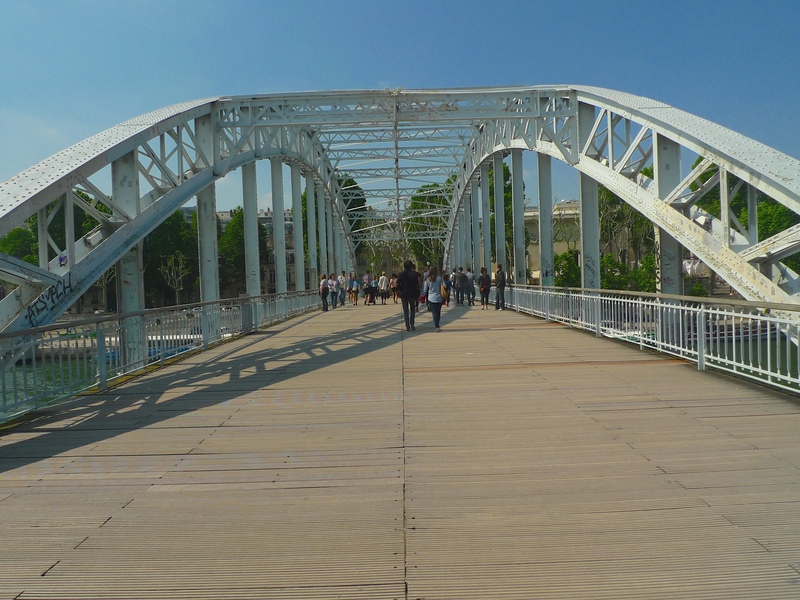 As a consequence, less than a week after it was opened the bridge was closed. 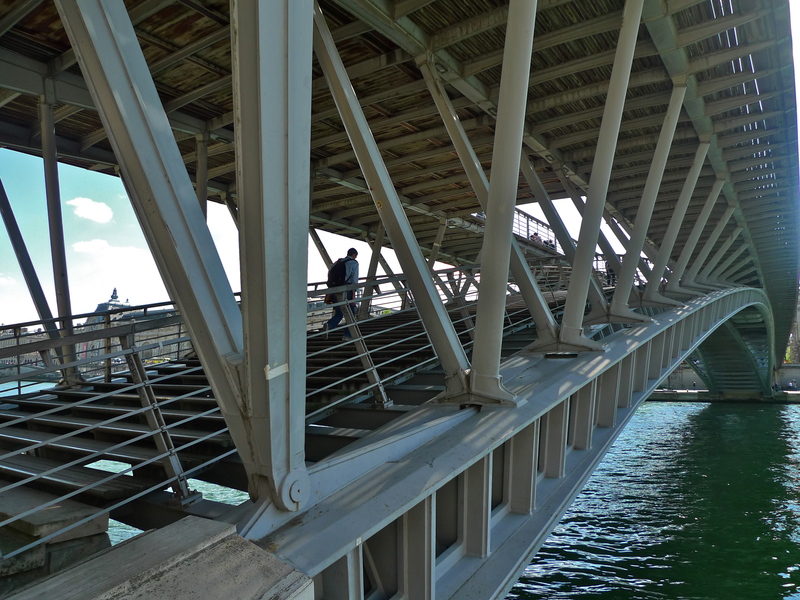 It wasn’t until 12th November 2000, almost one year later, and after an anti-skid system had been applied to the walkways and dampers installed to temper the swaying, that the bridge finally opened to the public. 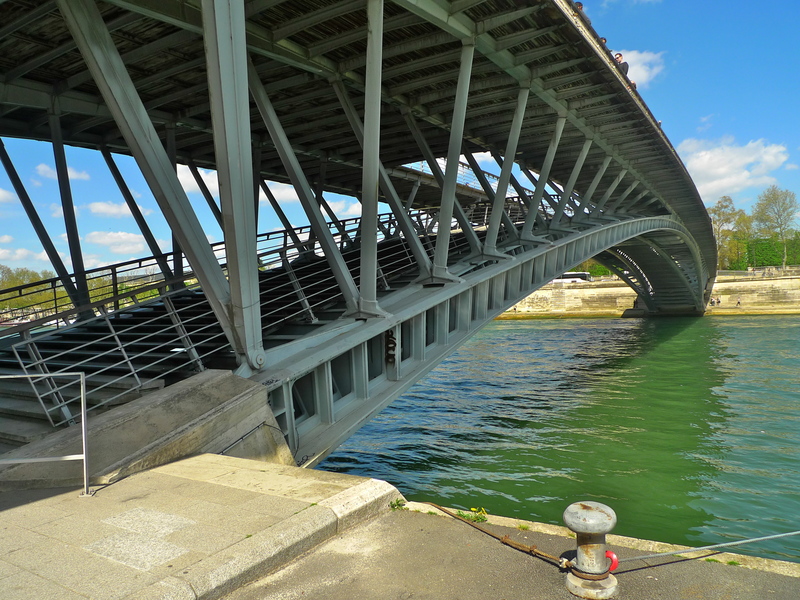 The original cost of the bridge was 91.6 million Francs and the additional work added another 6 million Francs all of which was financed by the State through l’Etablissement public de maîtrise d’ouvrage des travaux culturels, part of the Ministry of Culture. 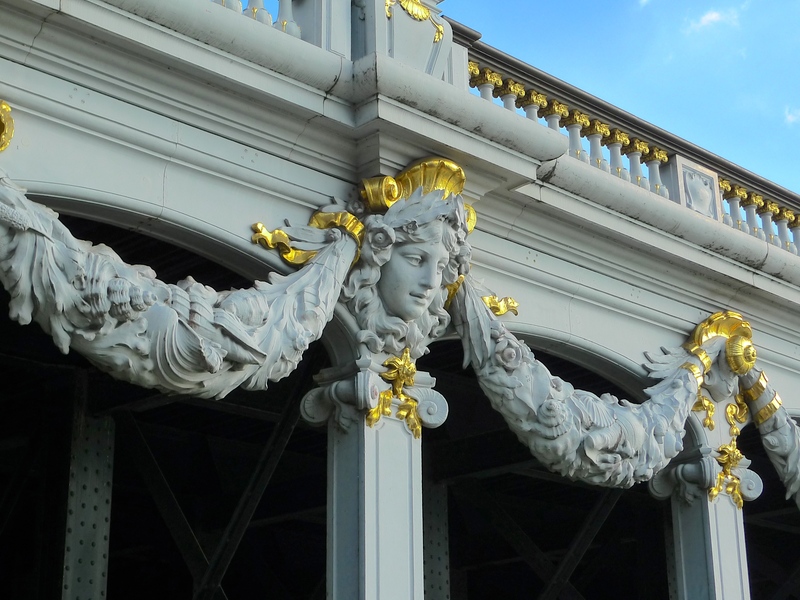 Upon its reopening the bridge proved to be a great success. 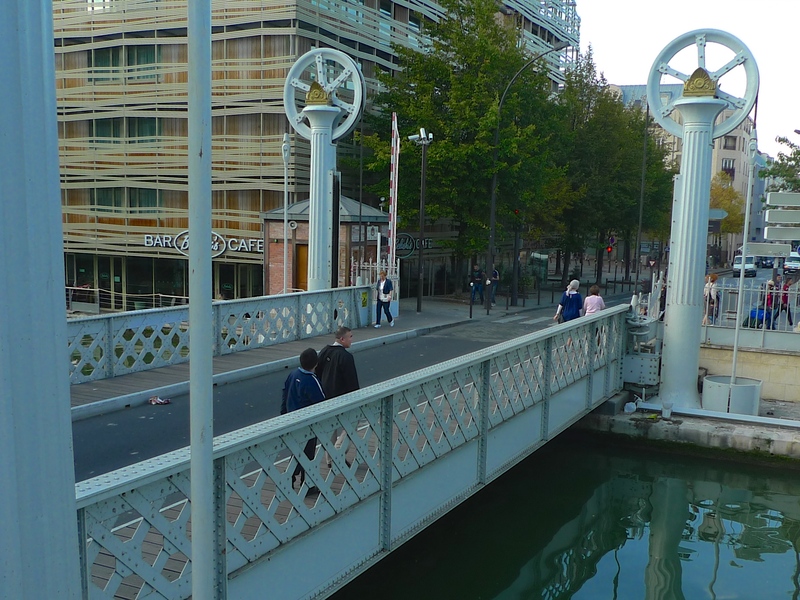 And the final chapter in the story of this footbridge is that in October 2006 the bridge’s name was changed from the Passerelle Solférino to the Passerelle Senghor. 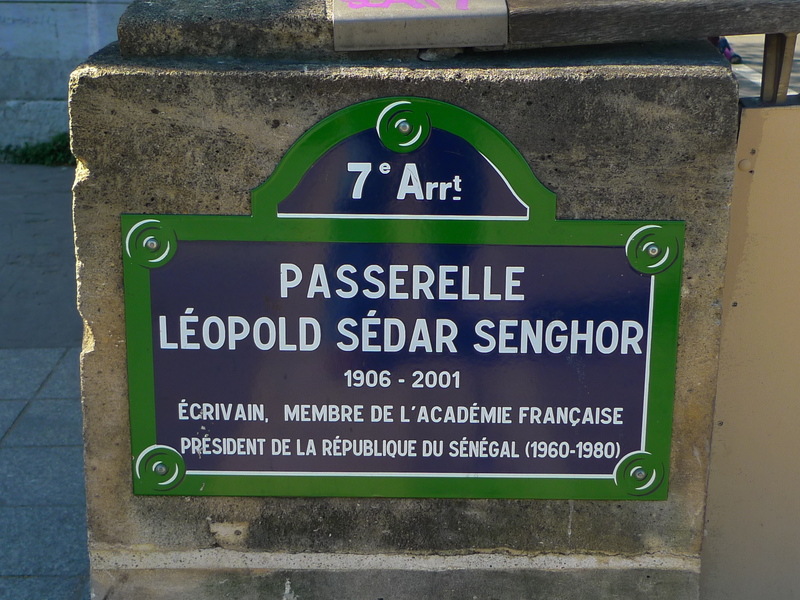 The name change marked the centenary of the birth of Léopold Sédar Senghor (1906 – 2001), a Senegalese poet, politician, and cultural theorist who from 1960 to 1980 served as the first president of Senegal. 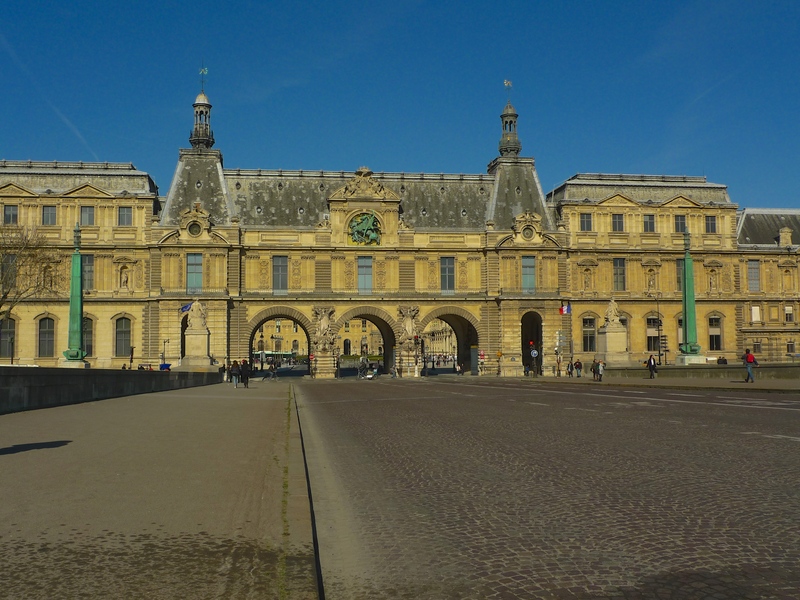 He was also the first African to be elected as a member of the Académie Française. 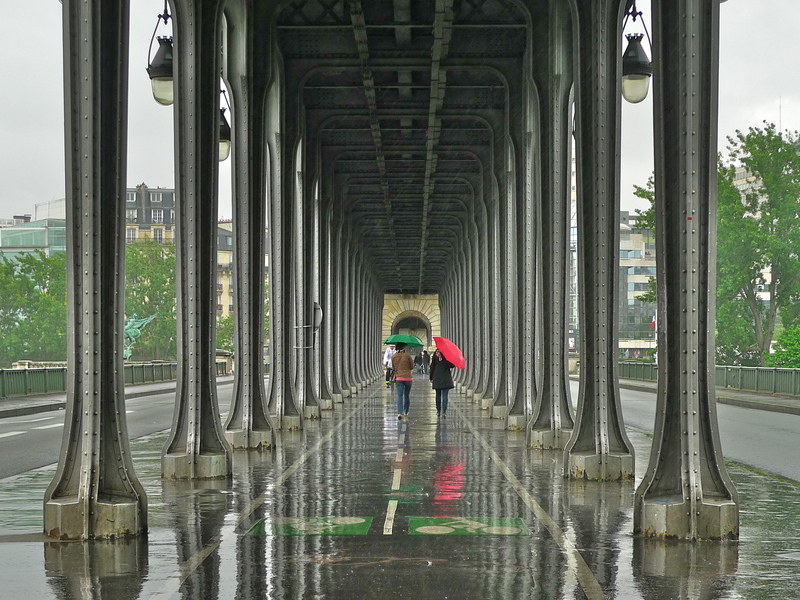 My Paris Bridges project is not only about exploring the history of each of the thirty-seven bridges that cross la Seine within the Paris city limits, it’s also about identifying and capturing the characteristic sounds of each bridge. 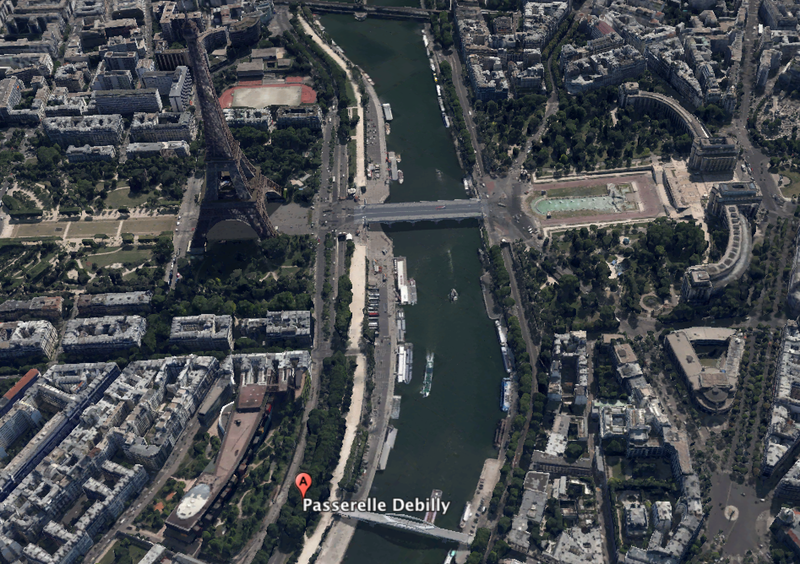 So, what are the characteristic sounds of the Passerelle Senghor? 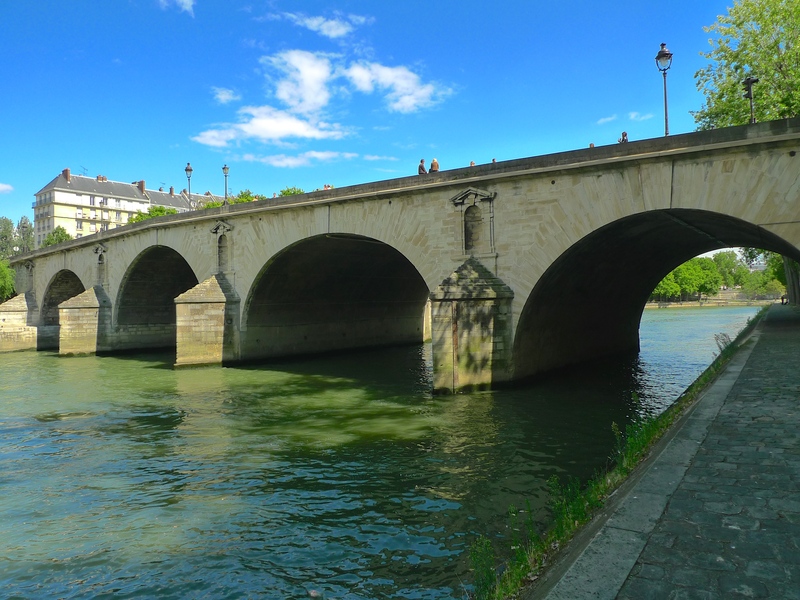 In a previous post about my Paris Bridges project I said that all the Paris bridges have two sets of sounds in common – the sounds of water and the sounds of river and vehicular traffic although these sounds might in some cases vary sufficiently to help identify each bridge. 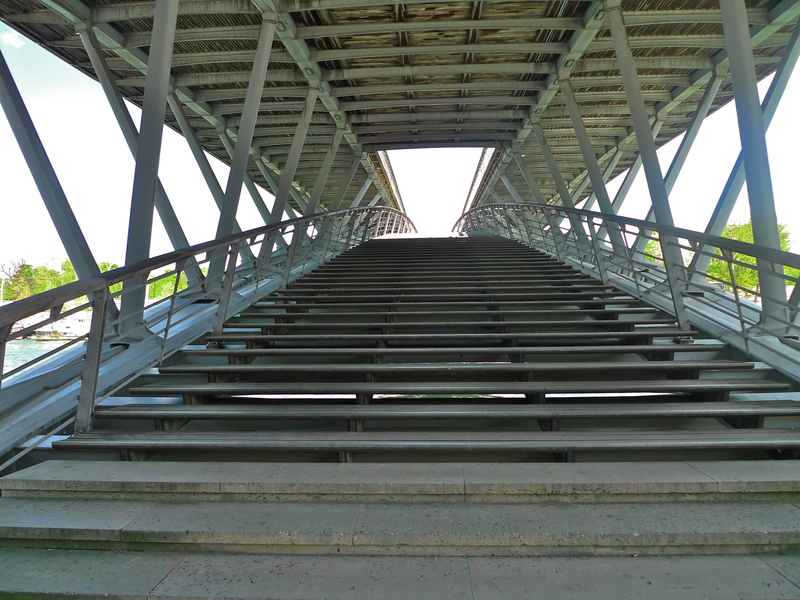 I also said that my challenge is to find other sounds that are unique to each bridge. 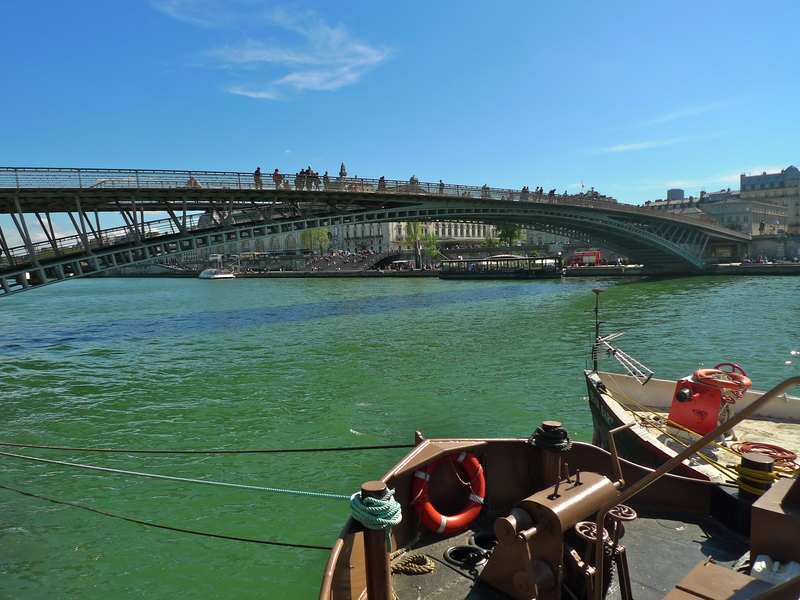 The Passerelle Senghor certainly has its fair share of passing river traffic. 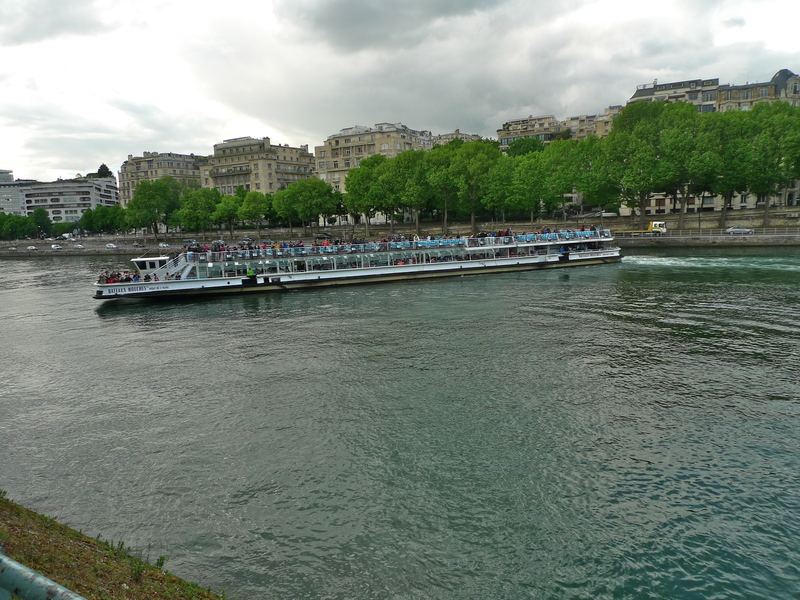 The boats seem to arrive in clusters from both upstream and downstream. 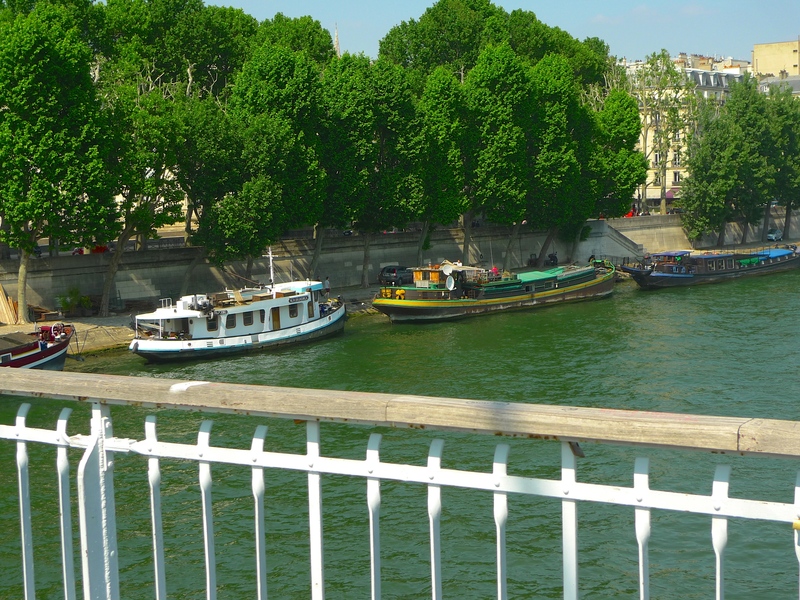 Standing on the Quai des Tuileries there were quite long periods with just the sounds of water and then a clutch of boats would arrive sometimes two or three abreast. 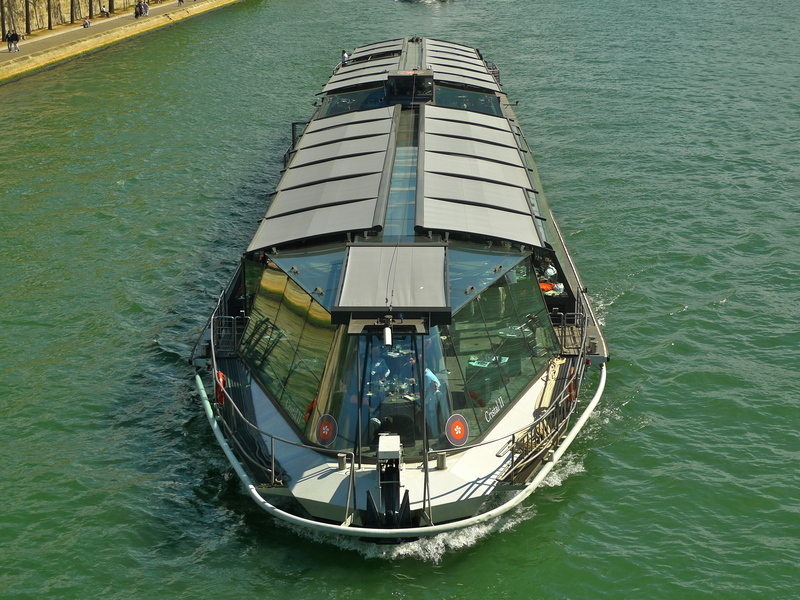 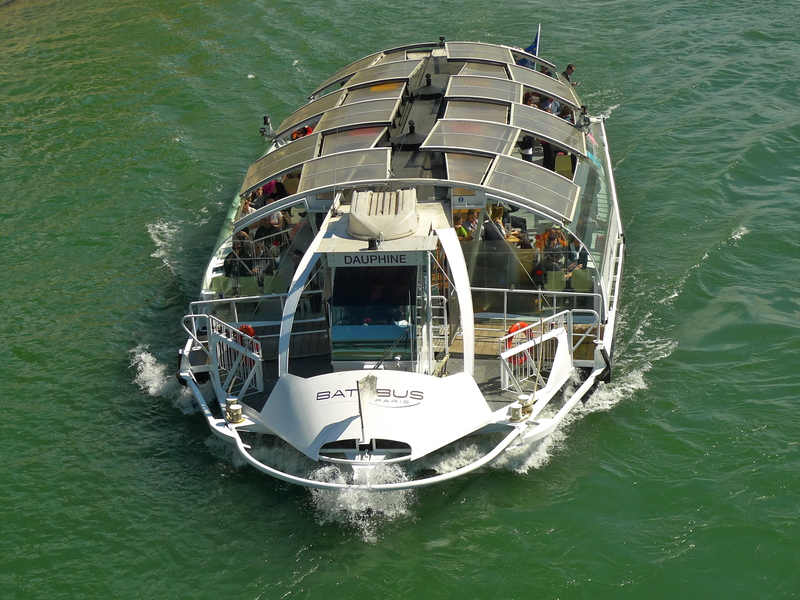 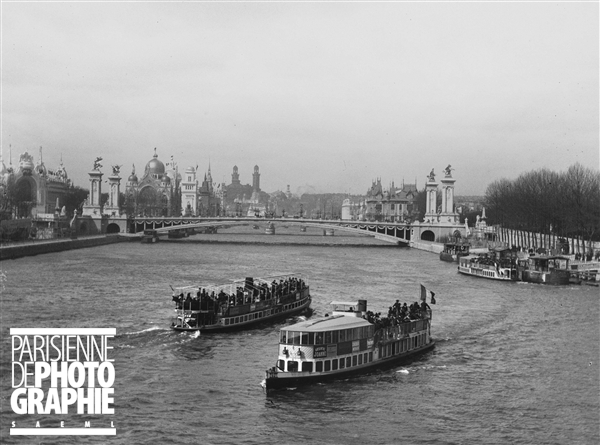 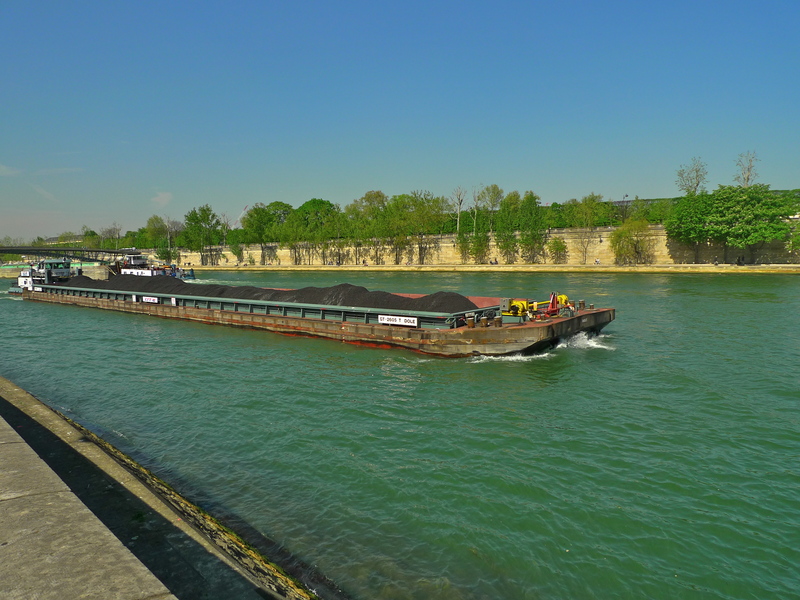 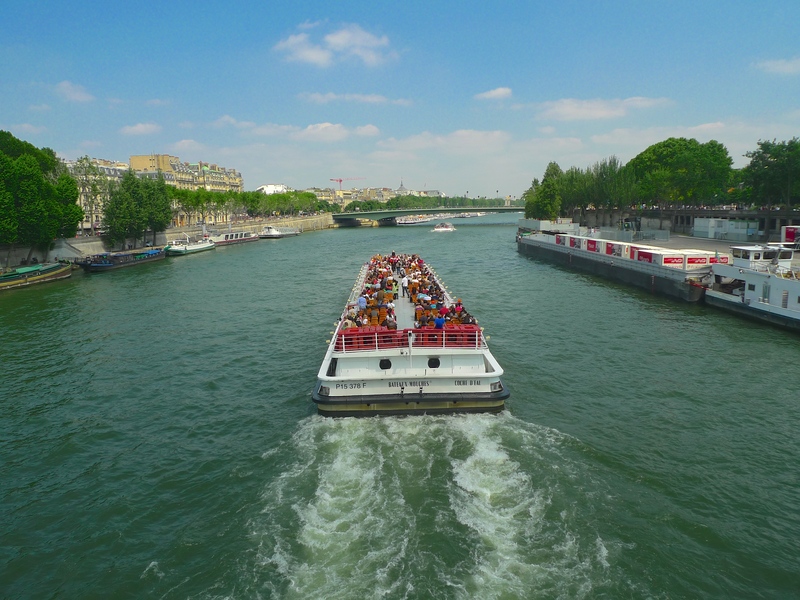 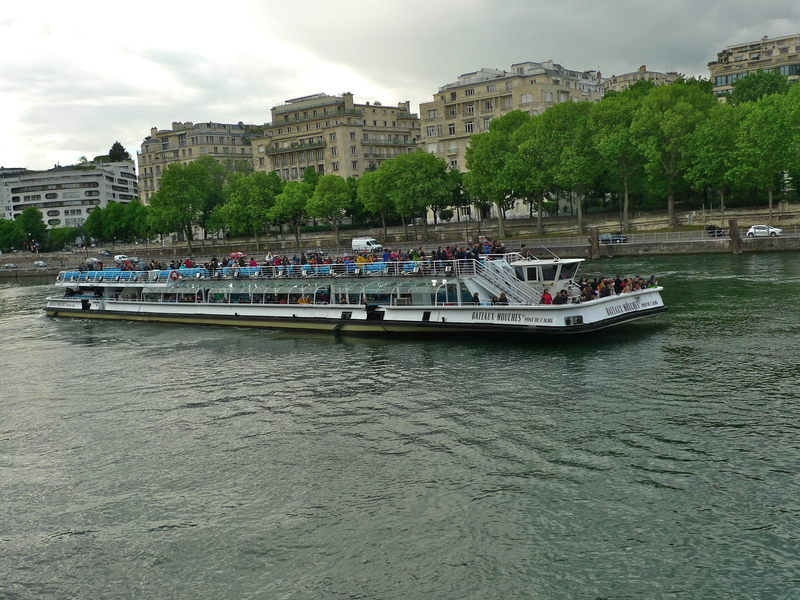 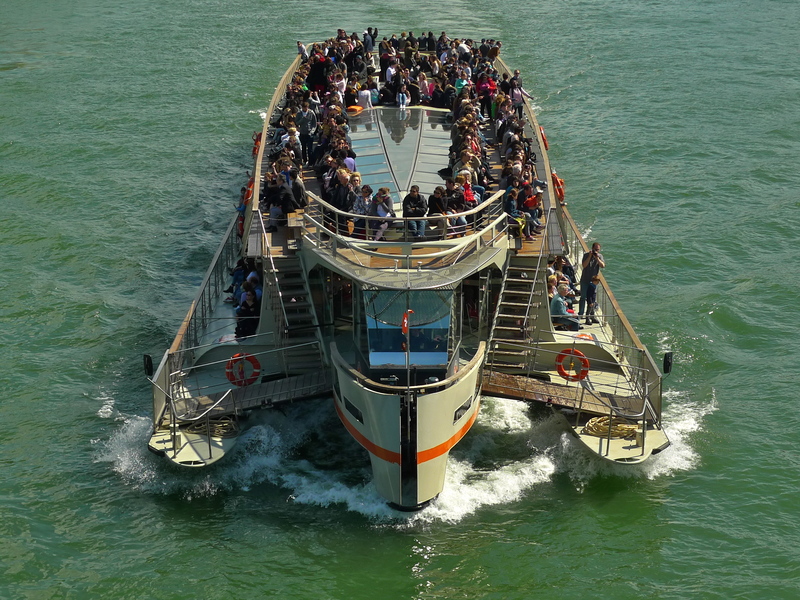 The tourist boats of course provide most of the traffic with the Bateaux Mouches, the Vedettes de Paris and the Batobus passing regularly but sometimes very long, very workmanlike, industrial barges also pass by. 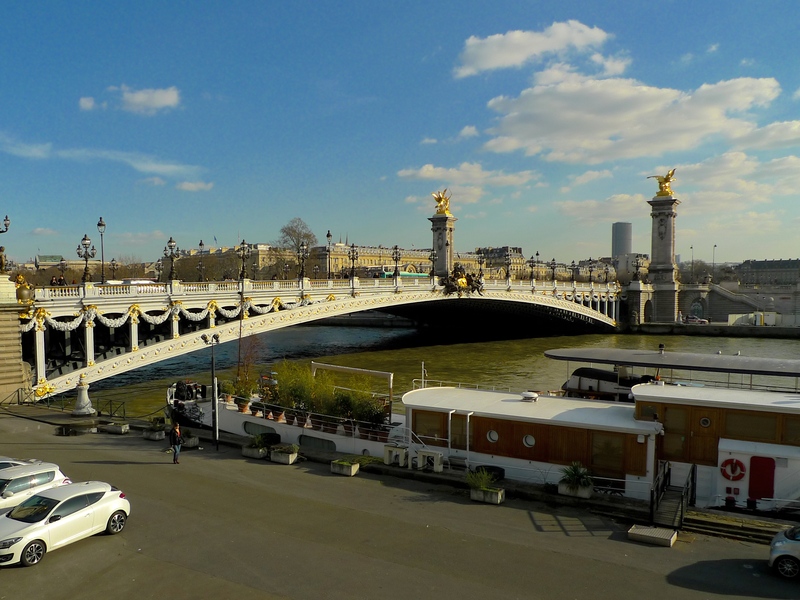 The Passerelle Senghor is one of the few bridges in Paris where the sound of river traffic dominates the sound of vehicular traffic for most of the time. 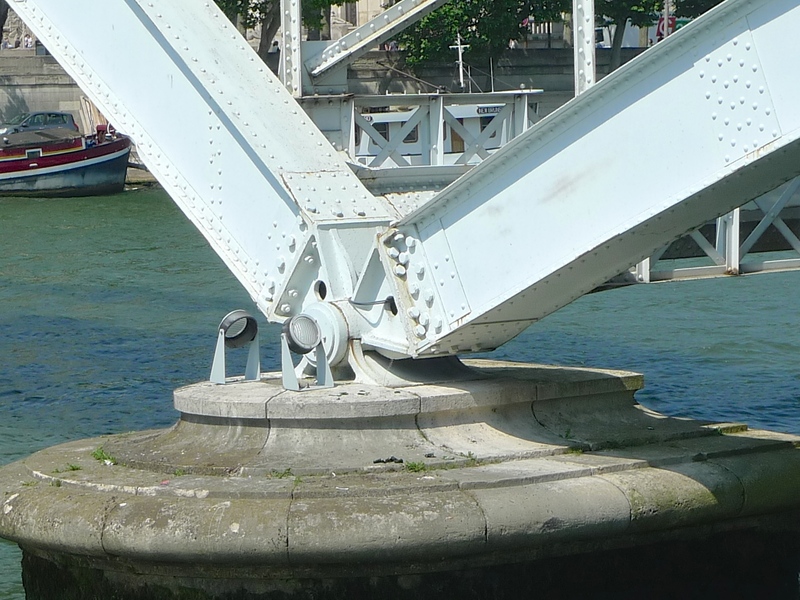 But are there any other characteristic sounds that we might say are unique to this bridge? 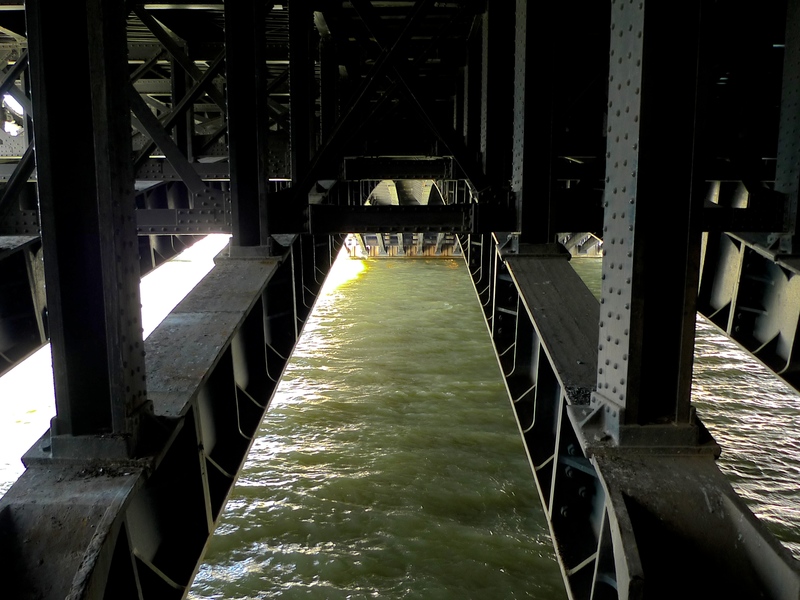 I took my microphones onto the bridge to see what I could find. 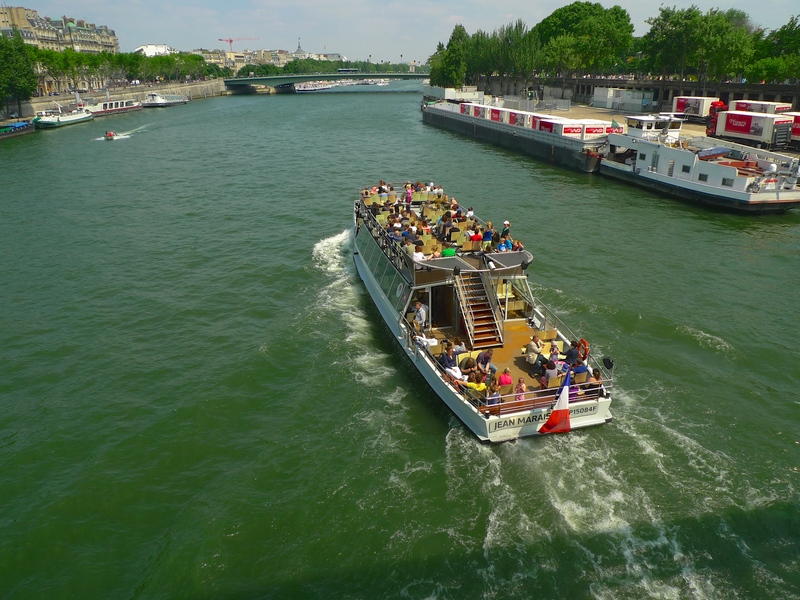 I sat in the centre of the bridge on the top deck facing upstream and began to record. 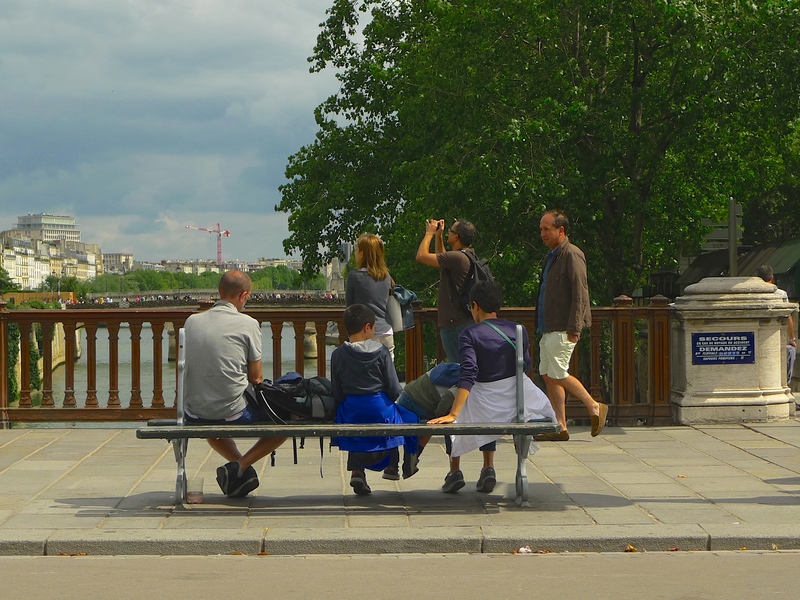 The voices of people passing by me with snatches of half-heard conversations, which I always find fascinating, punctuated with the sounds of boats passing to and fro directly underneath me and the distant sounds of traffic on the Quai des Tuileries on one side and the Quai Anatole France on the other provided the canvas upon which was painted the unique sounds of the bridge – the sounds of footsteps passing over the exotic wood of the walkway. 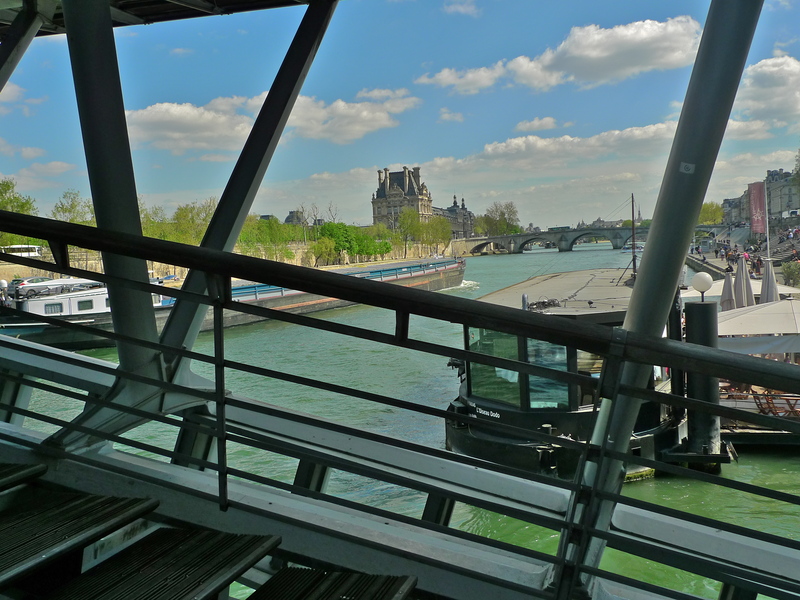 Although the sounds of footsteps over the exotic wooden walkways of the Passerelle Senghor certainly are characteristic sounds of this bridge I have to be cautious about saying that they are unique to this bridge. 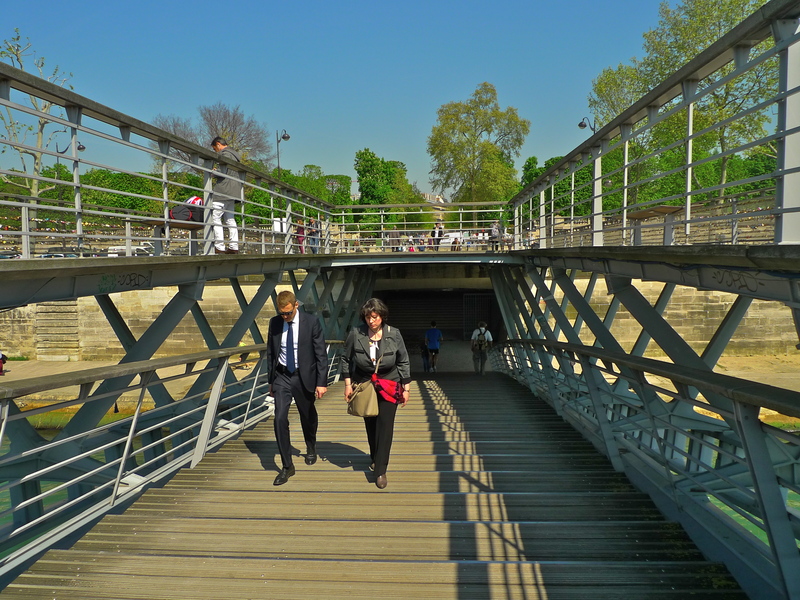 There is another elegant, modern footbridge crossing la Seine further upstream that also has exotic wooden walkways, the Passerelle Simone de Beauvoir. 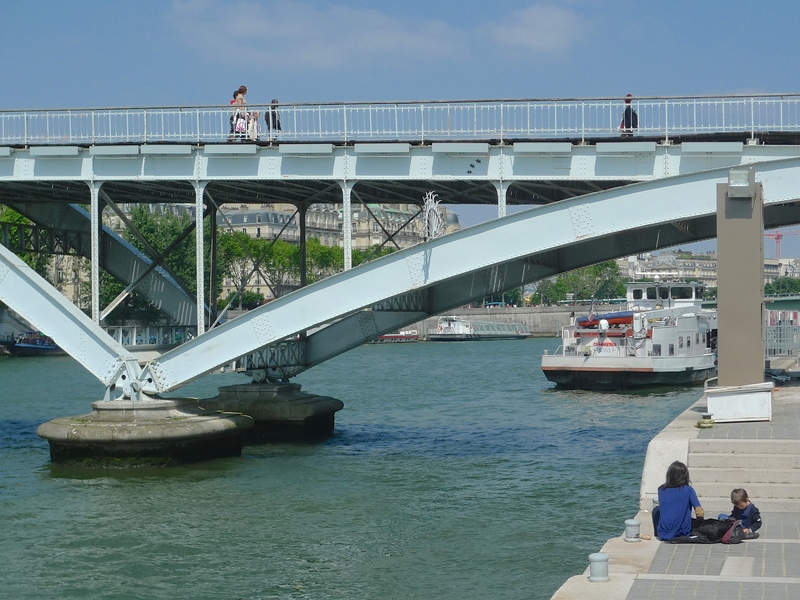 I have yet to explore this bridge in detail and it could be that the sounds of the footsteps over this bridge are the same, or similar to the sounds of footsteps over the Passerelle Senghor. 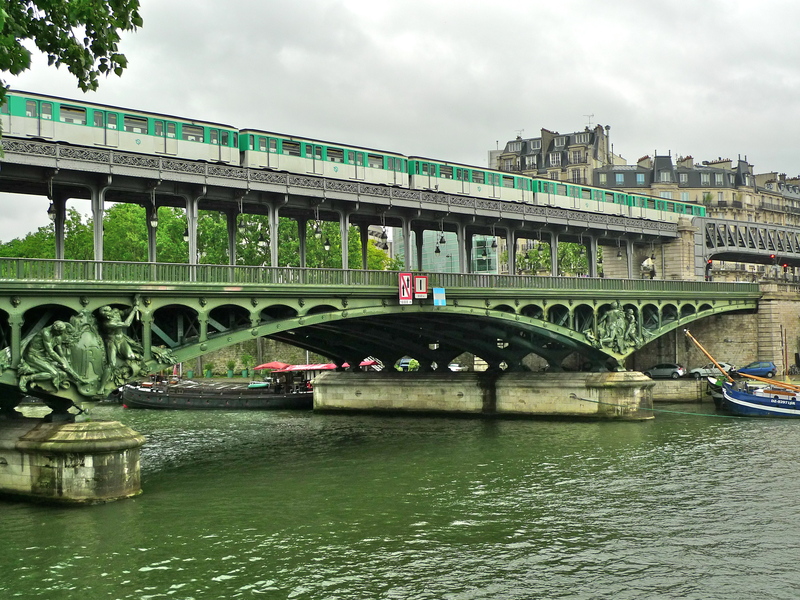 Still, distinguishing the subtleties and nuances of the sounds of each of the Paris bridges is one of the things that makes this project so fascinating. 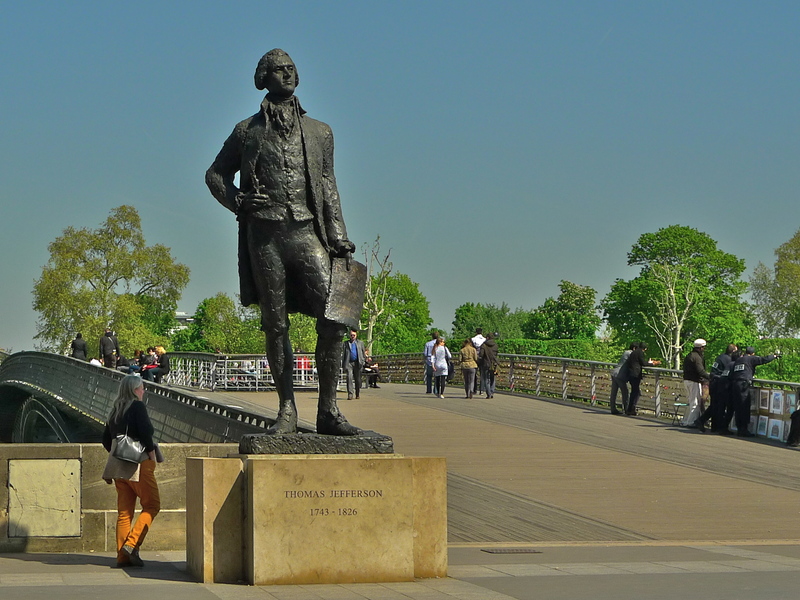 As well has searching for unique sounds on the Passerelle Senghor there is one unique visual feature that I found – this statue of Thomas Jefferson, US ambassador to France from 1785 to 1789 and then President of the United Sates. 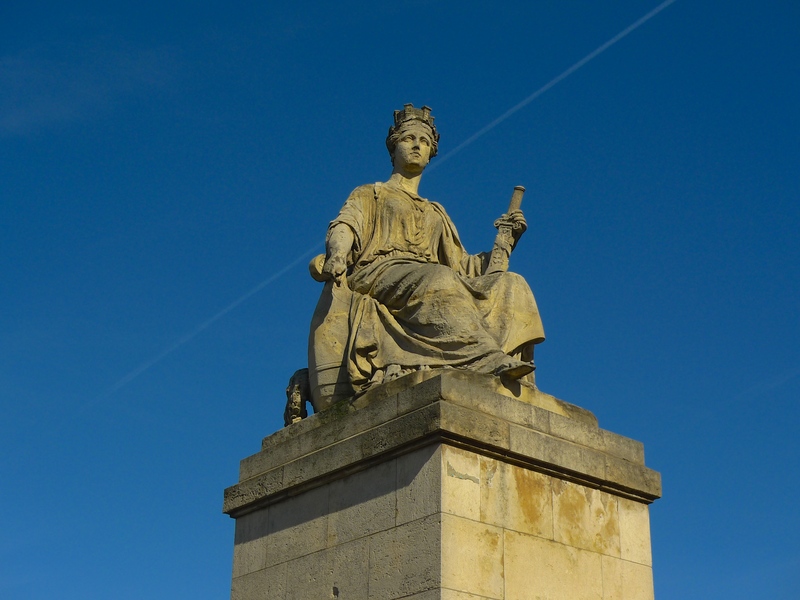 The statue by the French sculptor, Jean Cardot, was erected on 4th July 2004, American Independence Day. 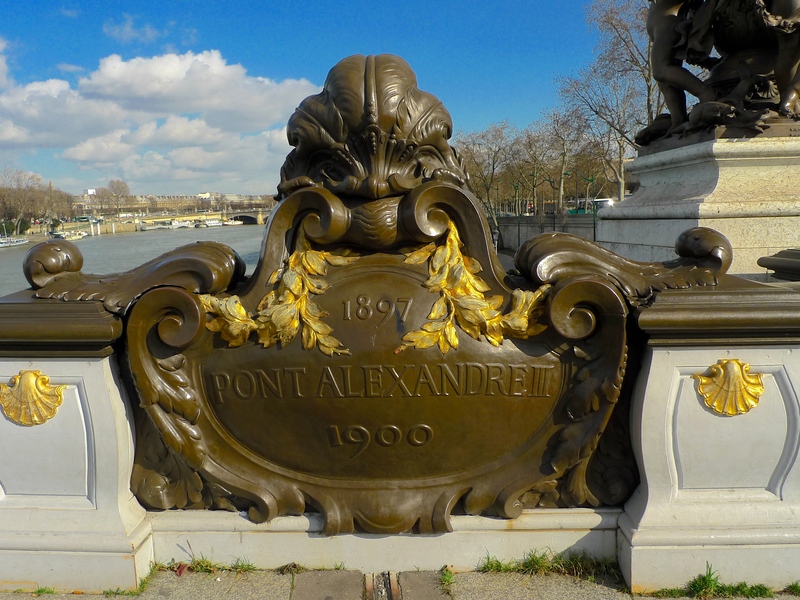 MORE RESEARCH FOR my Paris Bridges project took me to a bridge right in the heart of Paris the other day, the Pont au Change. 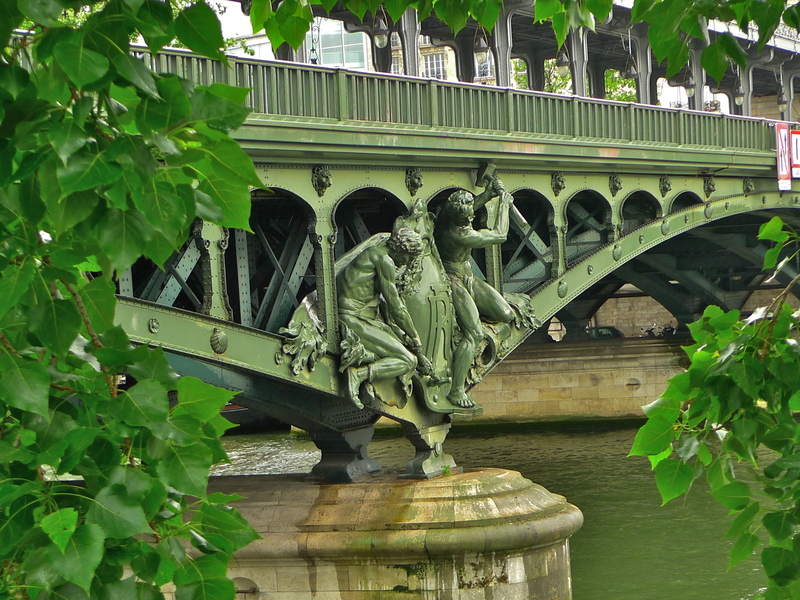 The Pont au Change connects the Île de la Cité, one of the two natural islands in the Seine (the other being the Île Saint-Louis), to the Right Bank. 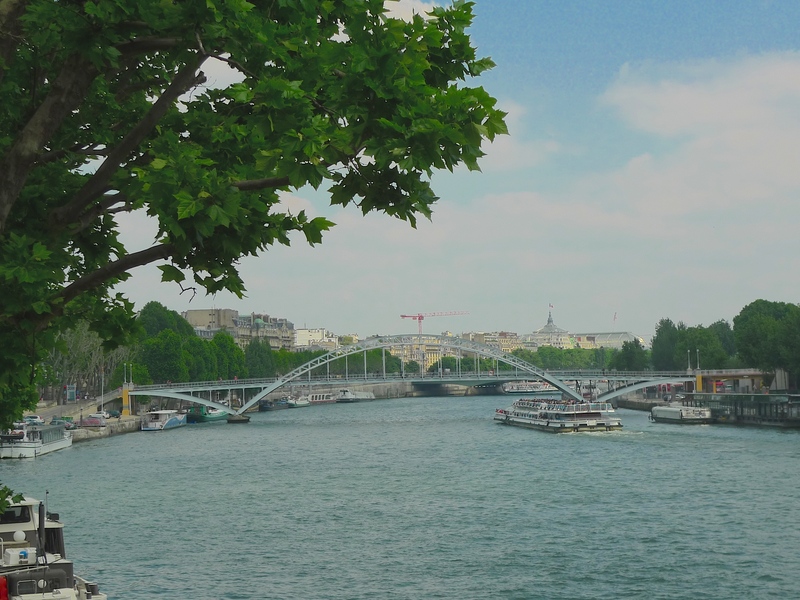 When Julius Caesar arrived in 52 BC, the island we now know as the Île de la Cité was a Gallic settlement, home to the Parisii tribe. 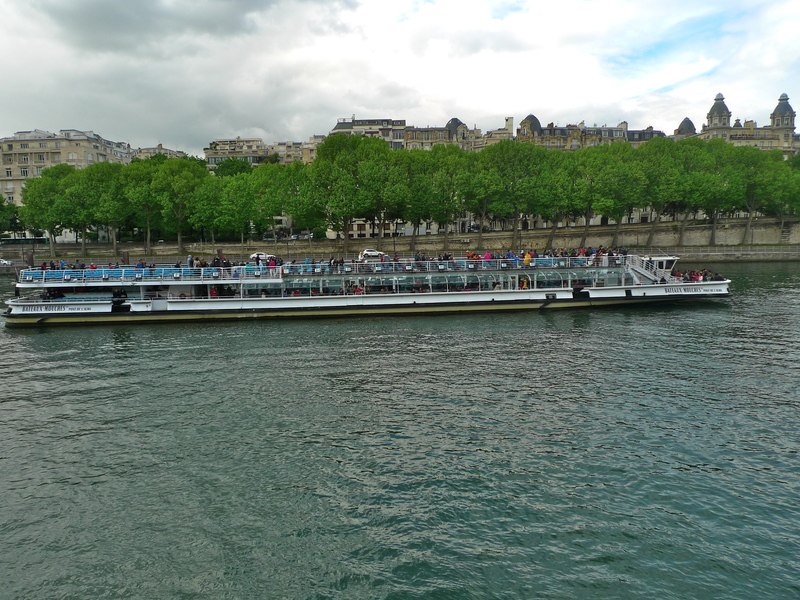 A low-lying area subject to flooding, the island was quite an inhospitable place but it did offer a convenient place to cross the Seine and a refuge in times of invasion. 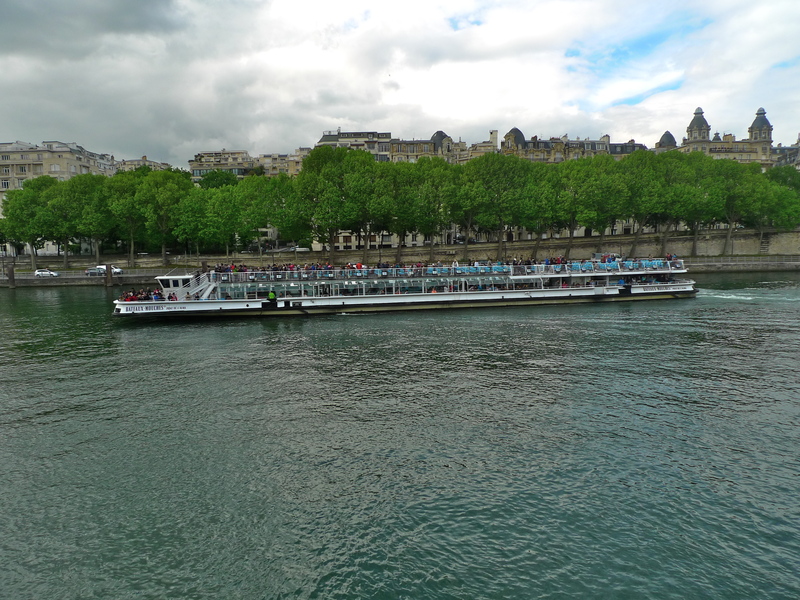 Although they set up camp there, the Romans didn’t like the island much and they began to develop their more permanent settlement, Lutetia, in the healthier air on the slopes above the Left Bank of the river. 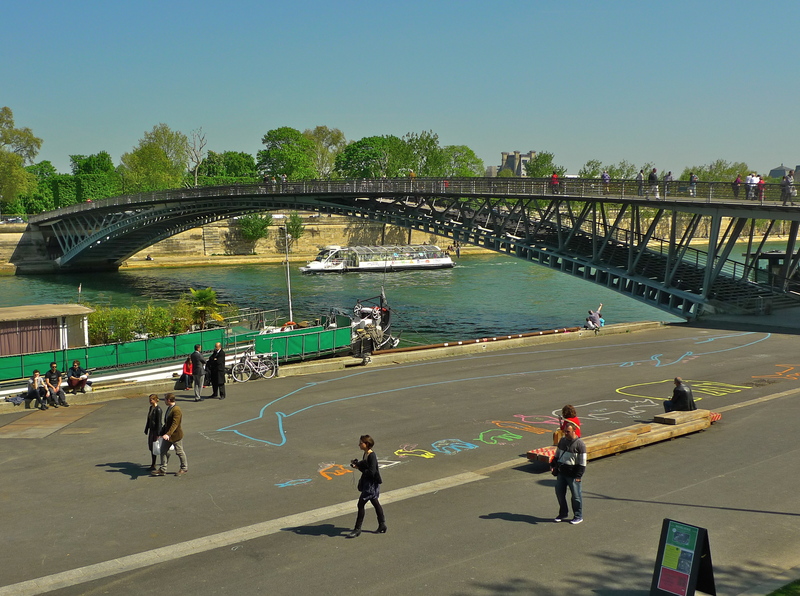 It is thought that a wooden bridge crossing La Seine at or somewhere near today’s Pont au Change existed before the Romans arrived. 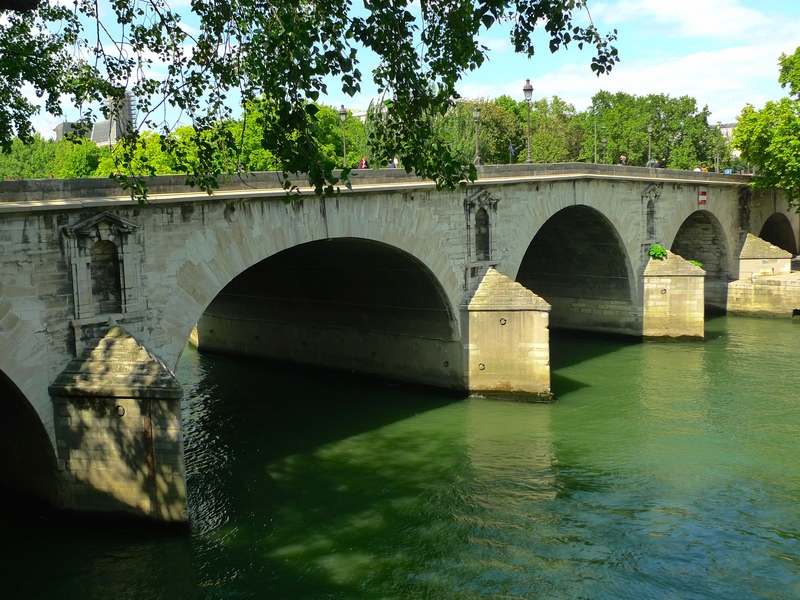 A stone bridge was built in the 9th century at around the time of the Viking invasion and there have been several others since. 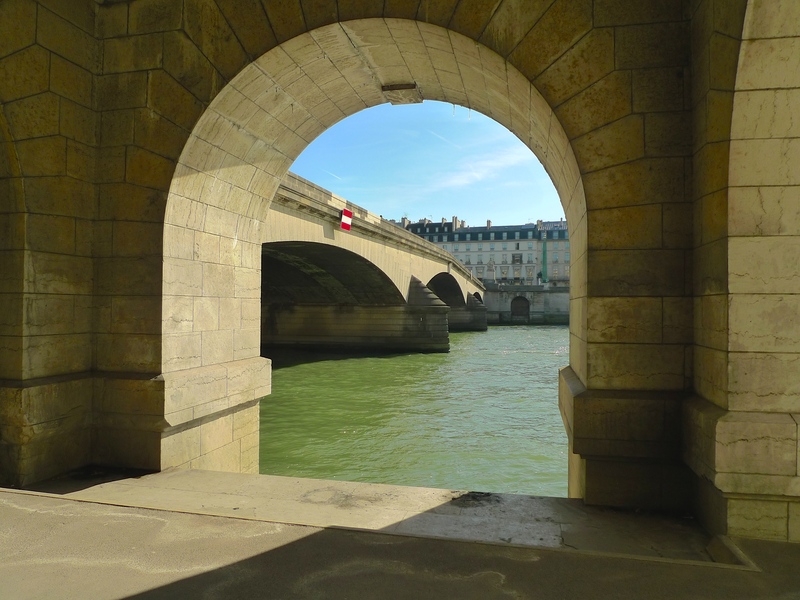 Known until the late 13th century as the Grand Pont, this bridge was a major medieval artery connecting the Île de la Cité to the developing Right bank of the Seine. 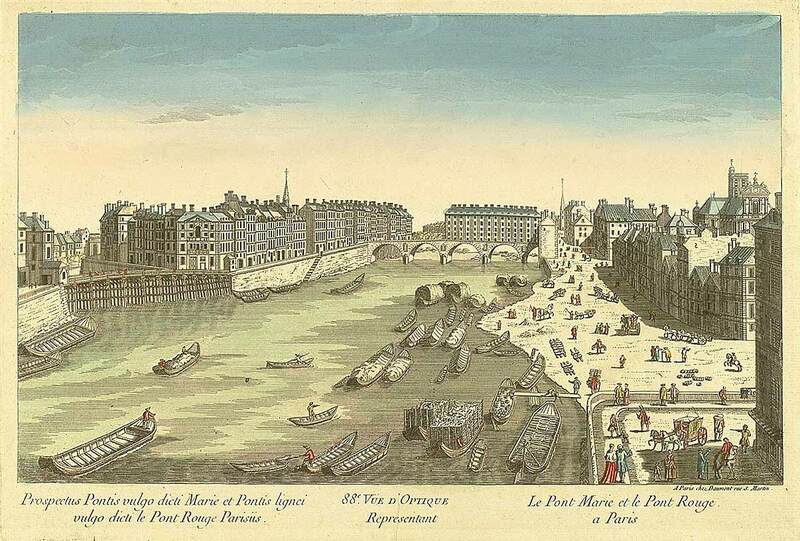 The Grand Pont may have been important but it was very inefficient. 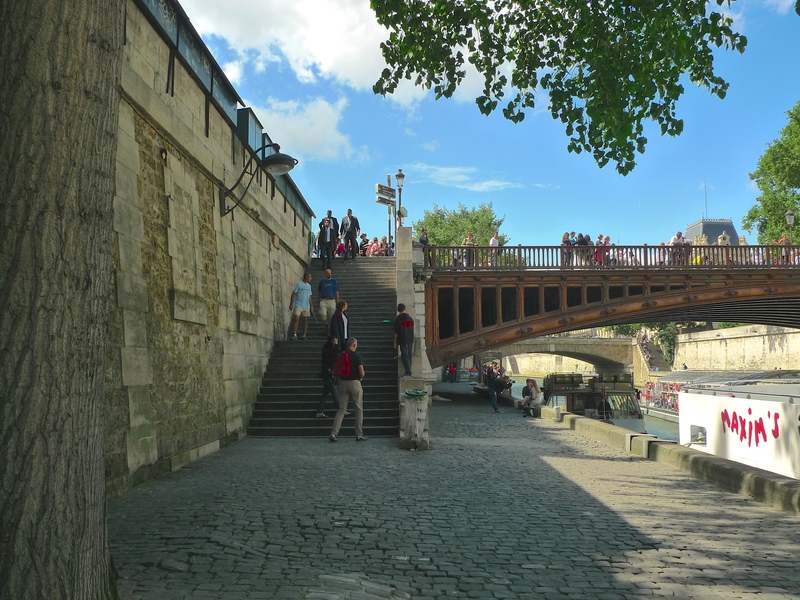 Like the narrow, winding streets surrounding it the bridge was perennially over-crowded making it difficult to transport goods through the city – not to mention the high risk of accidents from the traffic. 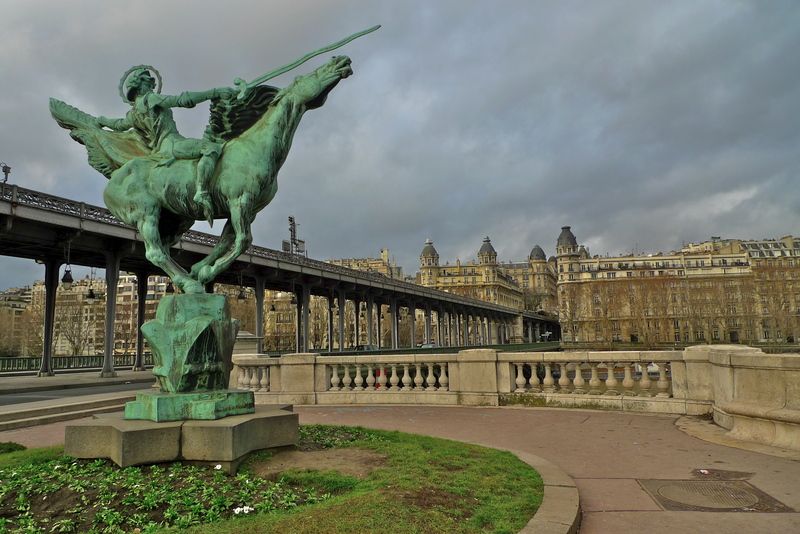 In 1131 Louis VI’s son and heir was killed when a runaway pig caused him to be thrown from his horse. 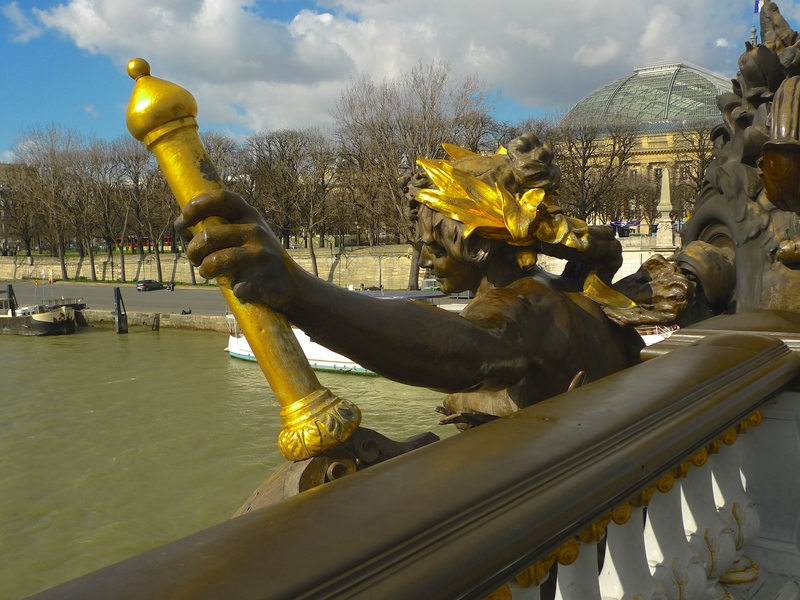 By the end of the 13th century a large number of Italian money-changers, mainly natives of Lombardy, had established themselves in Paris. 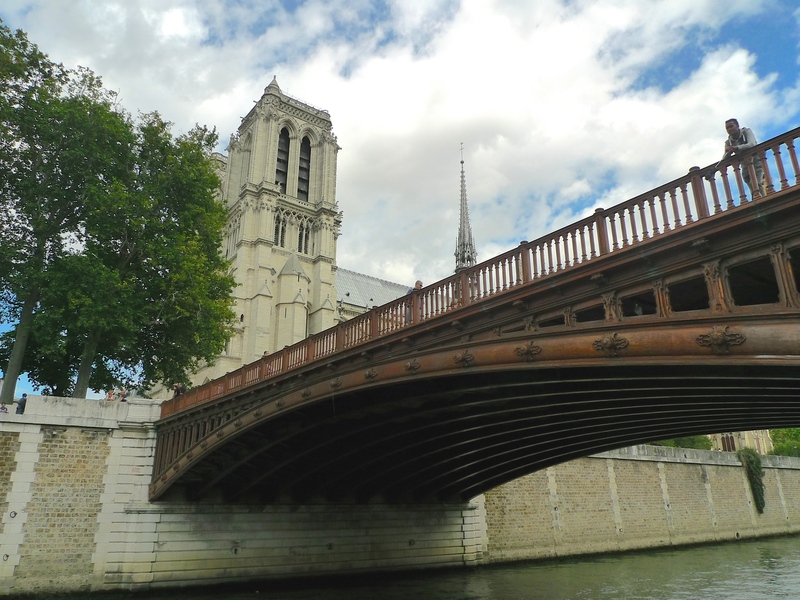 At the time when the King and the lords of his court sold prebendaries, bishoprics and benefices by auction the Lombards lent money at a high rate of interest and made immense fortunes. 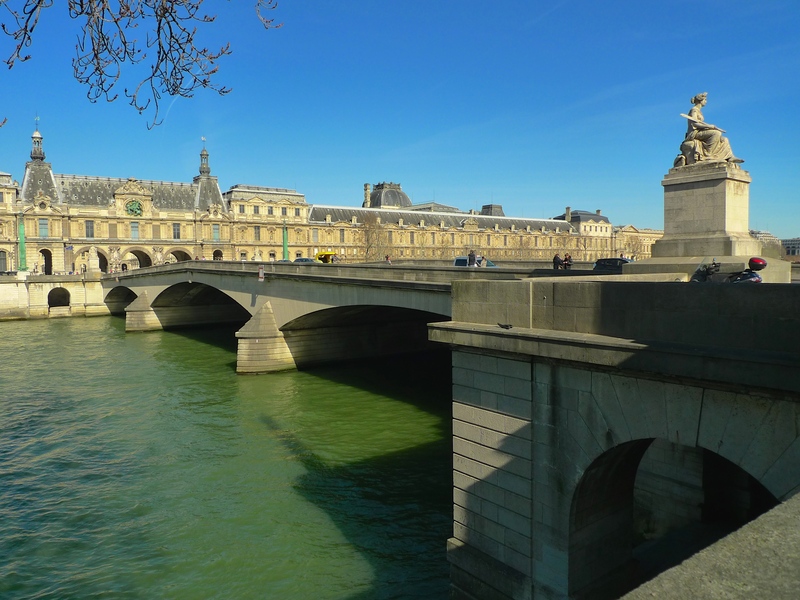 In 1296 a new Grand Pont was built and by Royal decree these money-changers were obliged to conduct their business out in the open on this new bridge and so it became known as the Pont aux Changeurs or Pont au Change (Exchange Bridge). 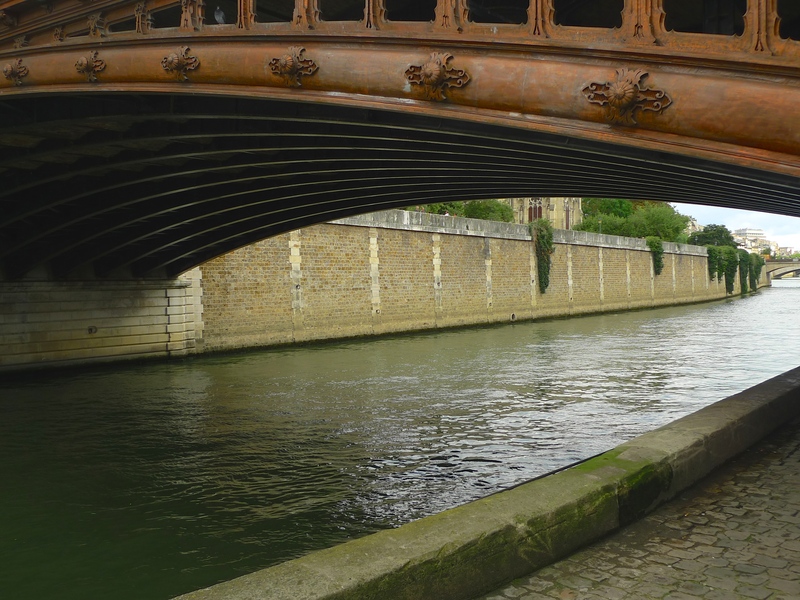 In 1621 this bridge was completely destroyed by fire. 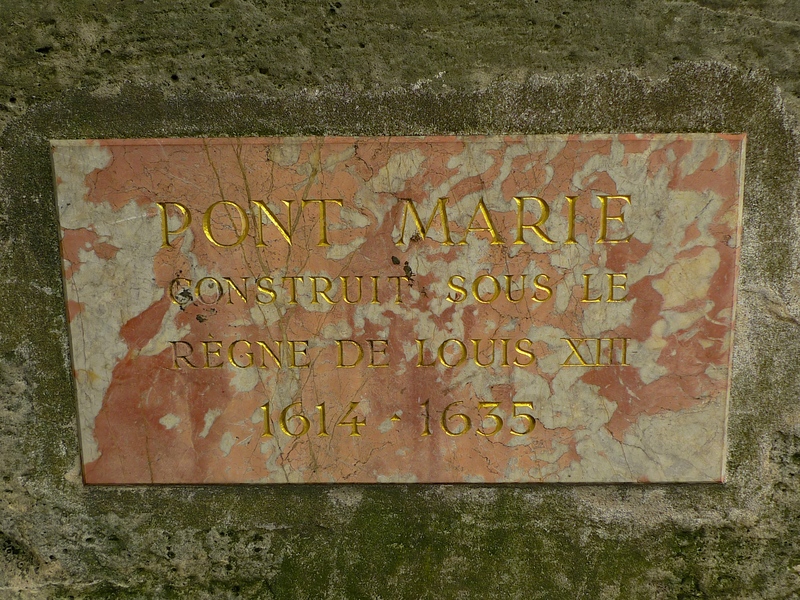 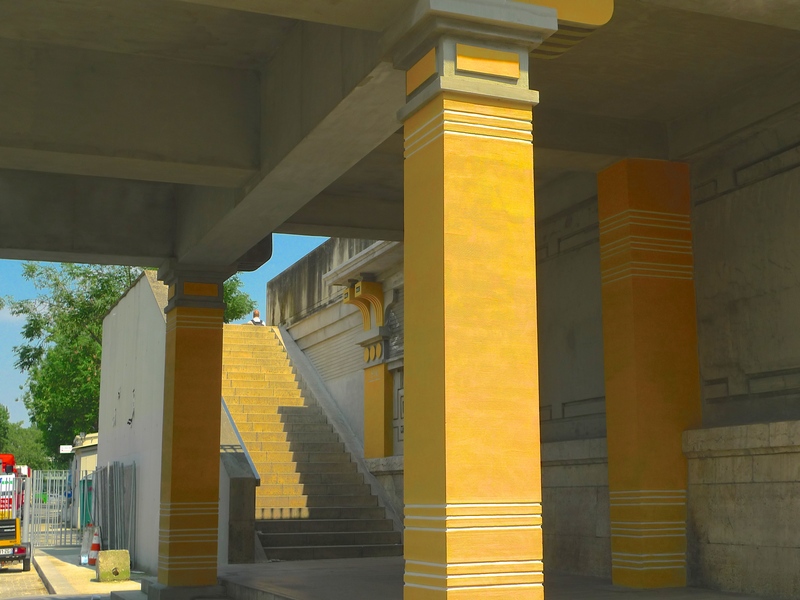 The money-changers asked the King for permission to rebuild the bridge at their own expense, provided that they could erect houses on it and this was approved by Royal edict in May 1639. 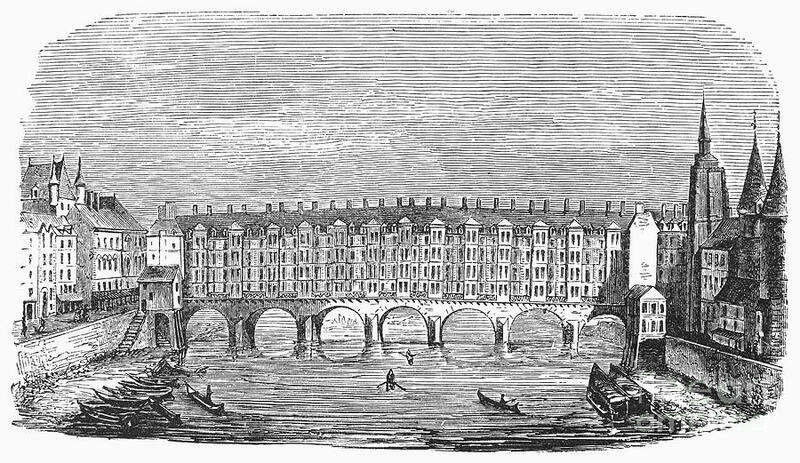 The new bridge, built between 1639 and 1647, comprised seven stone arches and at 32 metres wide it became the widest bridge in the city at the time. 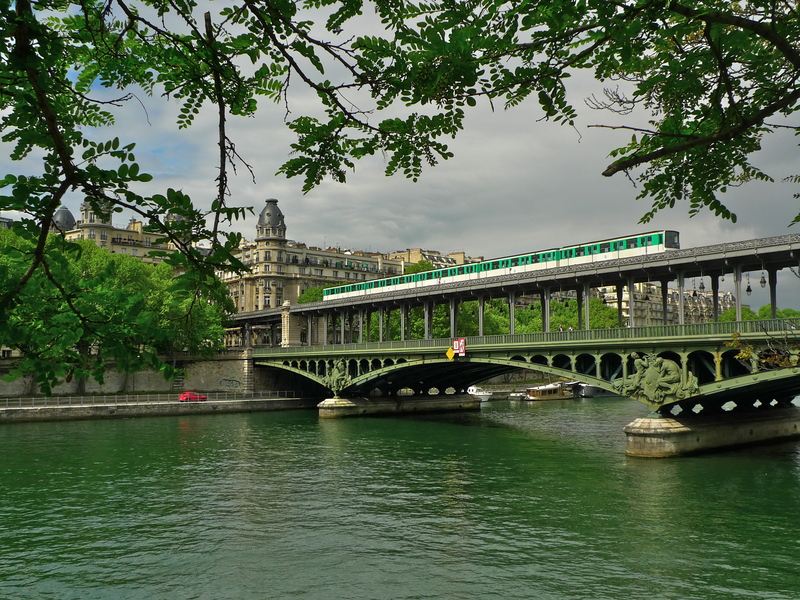 In the mid-19th century the Pont au Change came under the scrutiny of Baron Haussmann and his urban redevelopment of Paris. 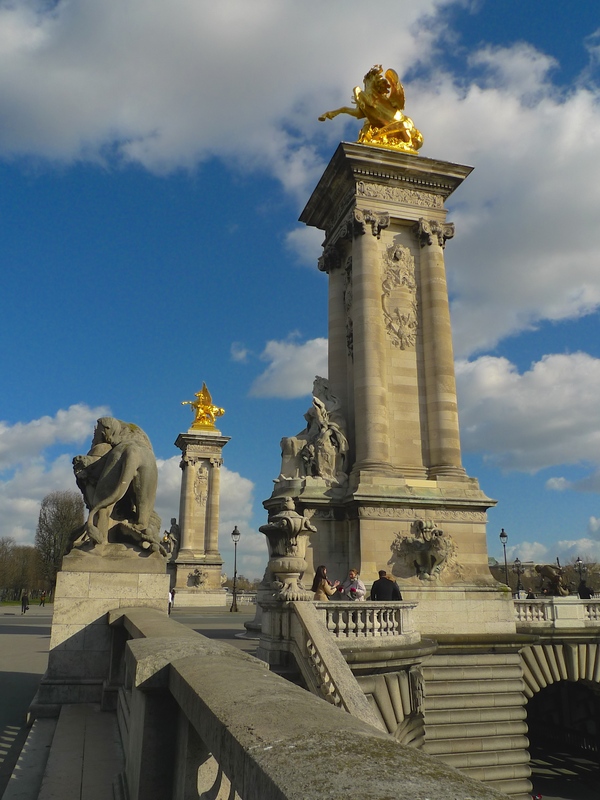 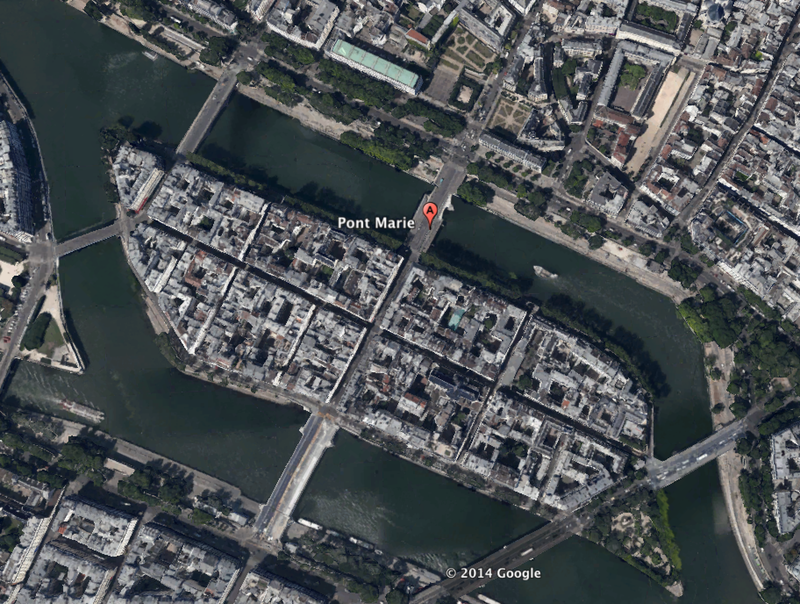 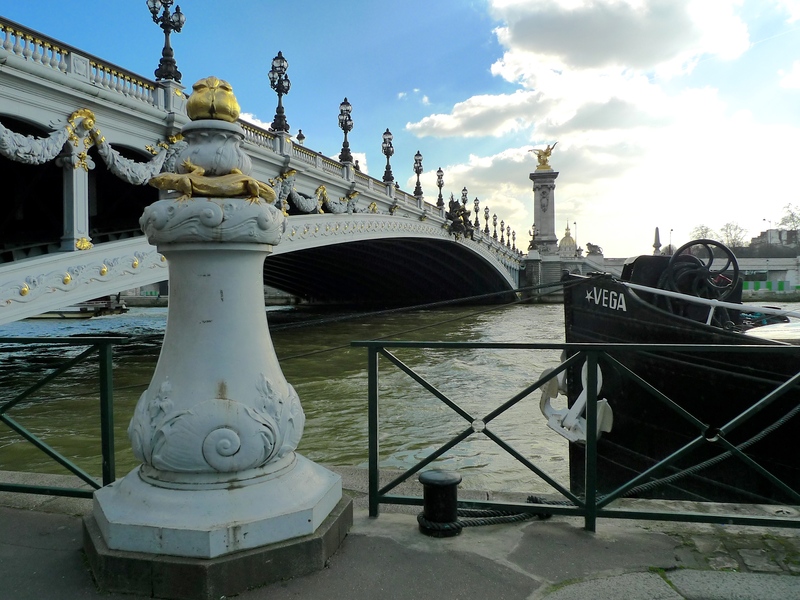 To fit with Haussmann’s plans, the bridge needed to be realigned and so in 1858 work began on a new bridge. 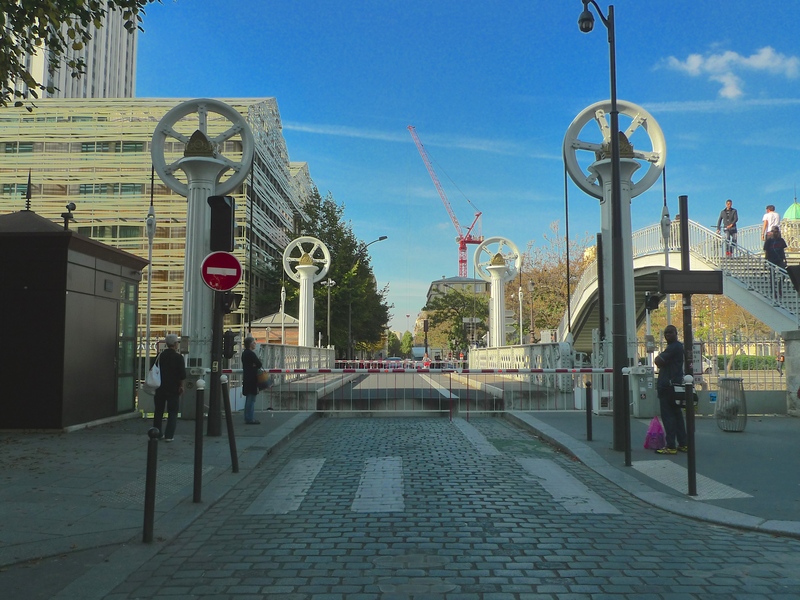 Designed by the French engineers, Paul-Martin Gallocher de Lagalisserie and Paul Vaudrey, the new Pont au Change was opened on 15th August 1860 and it’s the bridge we see today. 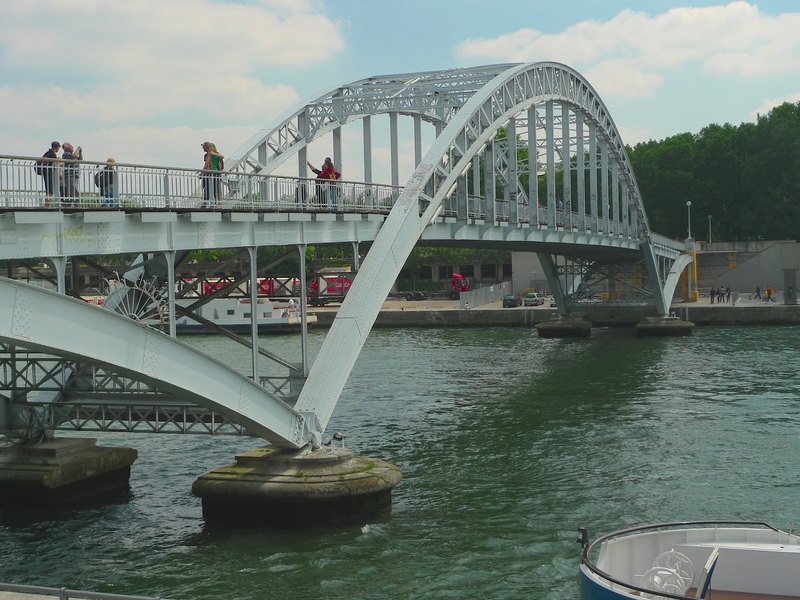 The bridge comprises three elliptical arches, each with a 31 metres span, it’s 103 metres long and 30 metres wide with an 18 metre roadway and two pavements each 6 metres wide. 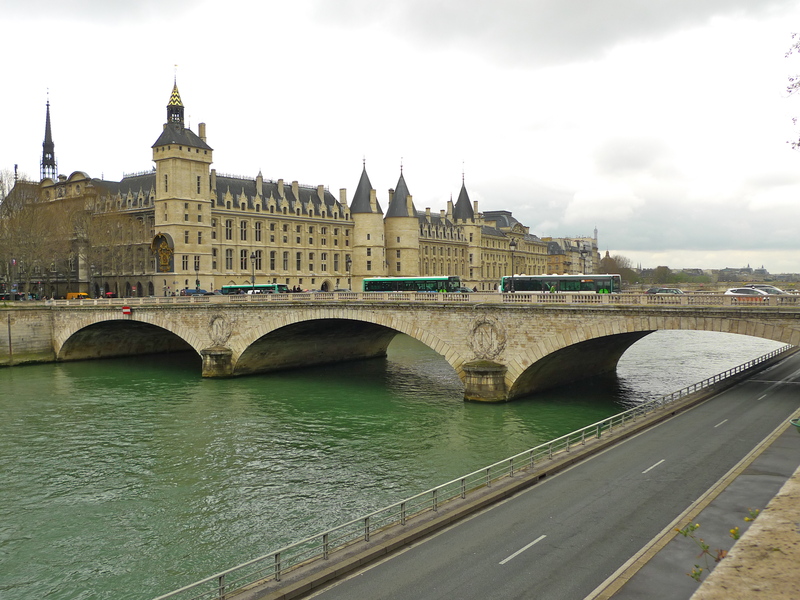 The Pont au Change connects the Île de la Cité from the Palais de Justice and the Conciergerie on the Left Bank to the Place du Châtelet on the Right Bank. 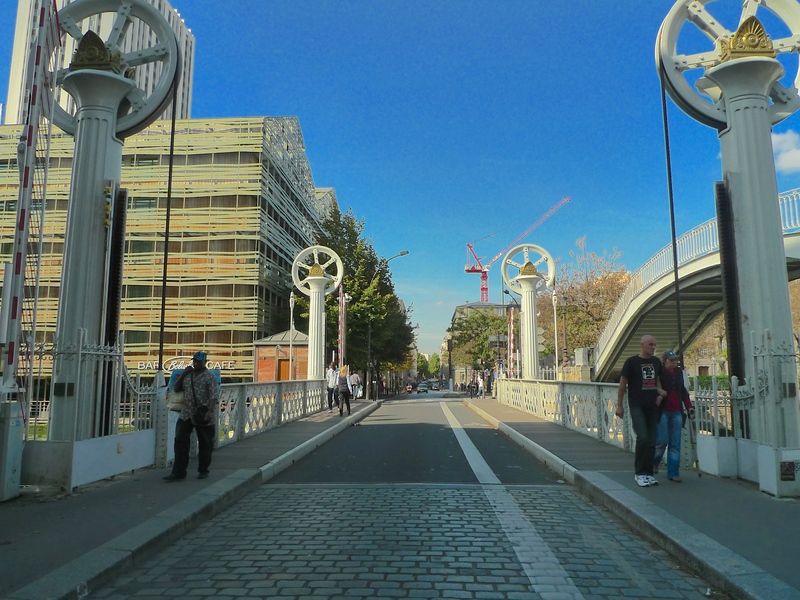 The Voie Georges Pompidou, a two-lane road, runs under the arch closest to the Right Bank. 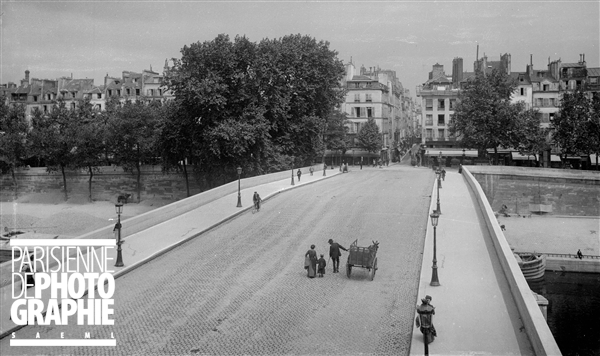 For most of the year this road carries a seemingly endless stream of traffic but for part of July and August each year traffic is forbidden, tons of sand are brought in and this road becomes part of the popular Paris-Plages, the seaside in Paris. 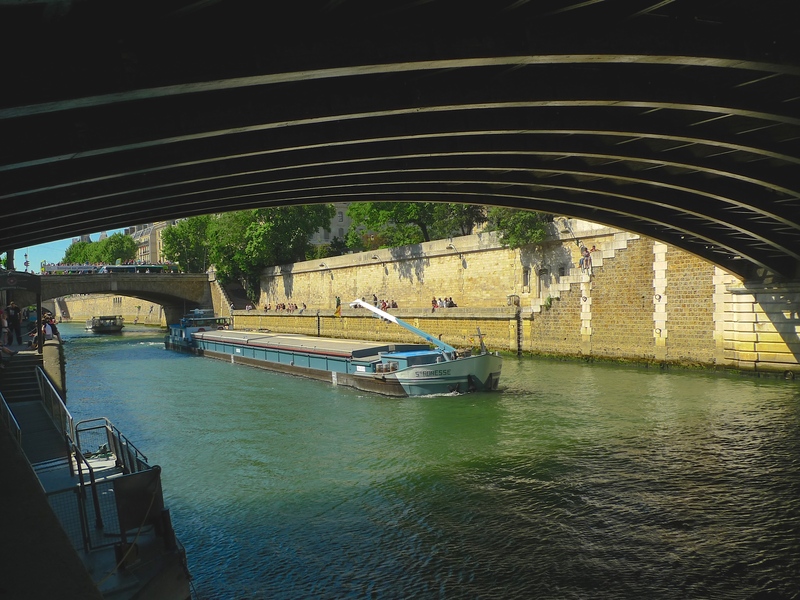 My Paris Bridges project is not only about tracing the history of all the thirty-seven bridges that cross La Seine within the Paris city limits, it’s also about trying to identify and to capture the characteristic sounds of each bridge. 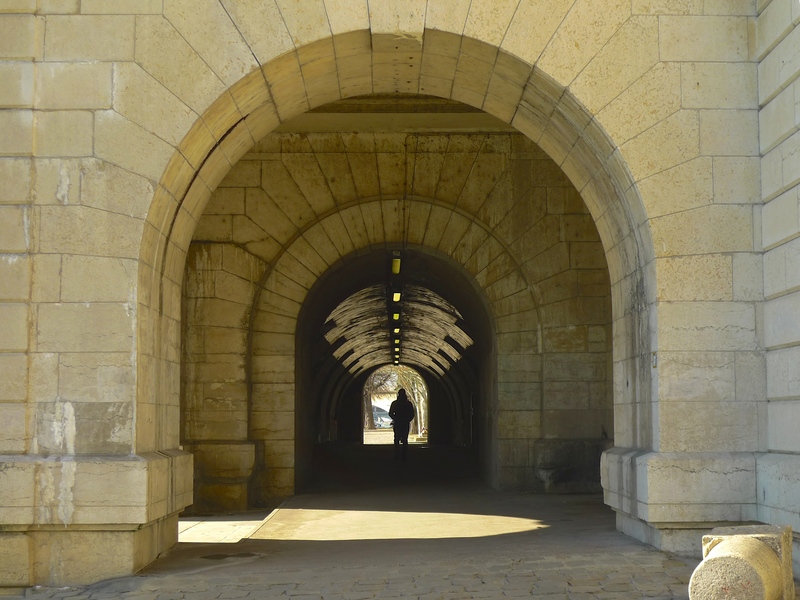 And identifying and then capturing these characteristic sounds is not as easy as it might seem, it involves a lot of time, legwork and endless patience. 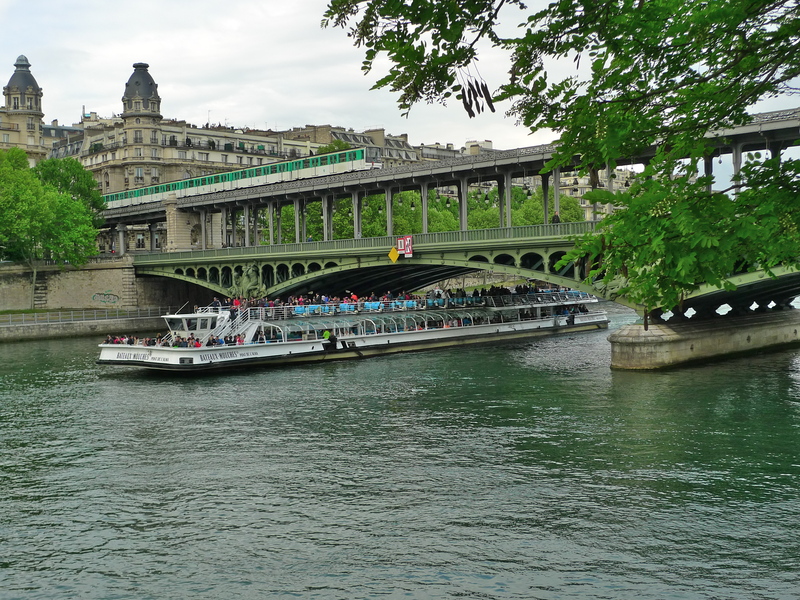 All the bridges included in my Paris Bridges project have two things in common, they all cross La Seine and they are all within the Paris city limits. 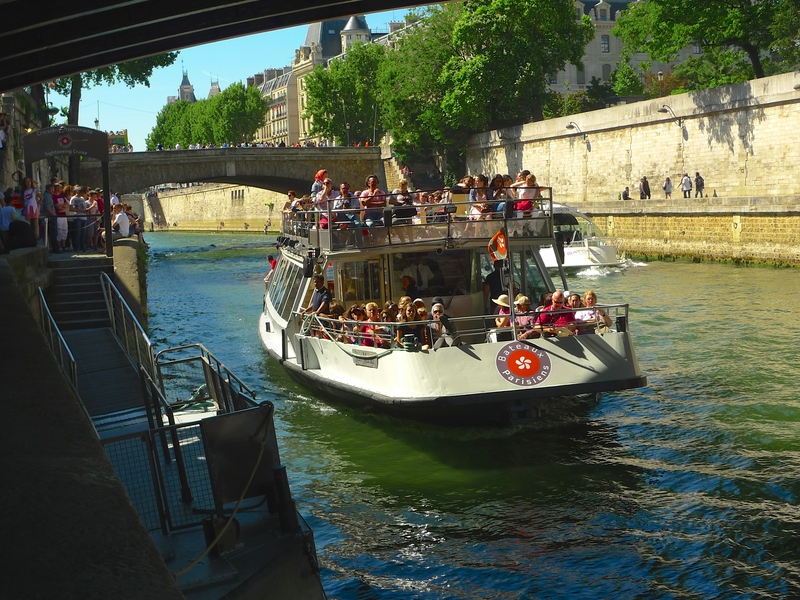 You might therefore conclude that their characteristic sounds are also likely to have things in common – the sound of water, the sound of river traffic and the sound of endless vehicular traffic. 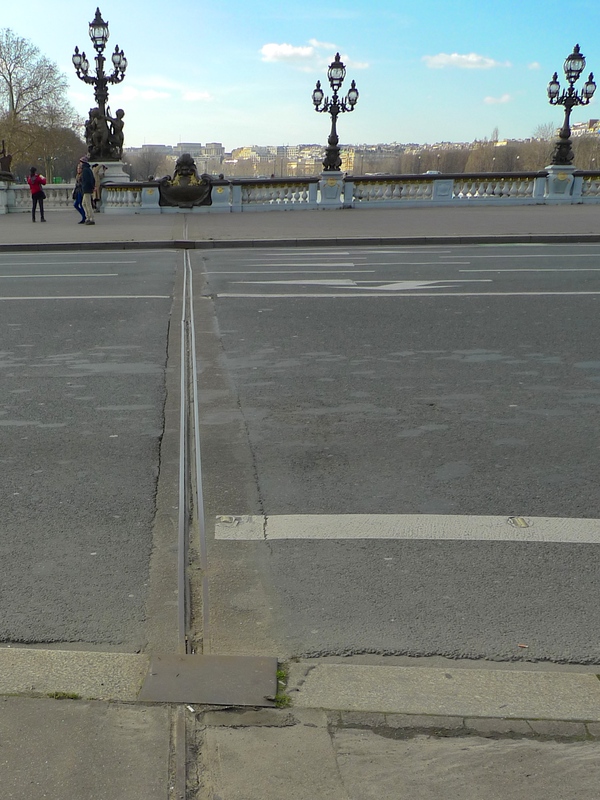 And of course, this is true – at least up to a point. 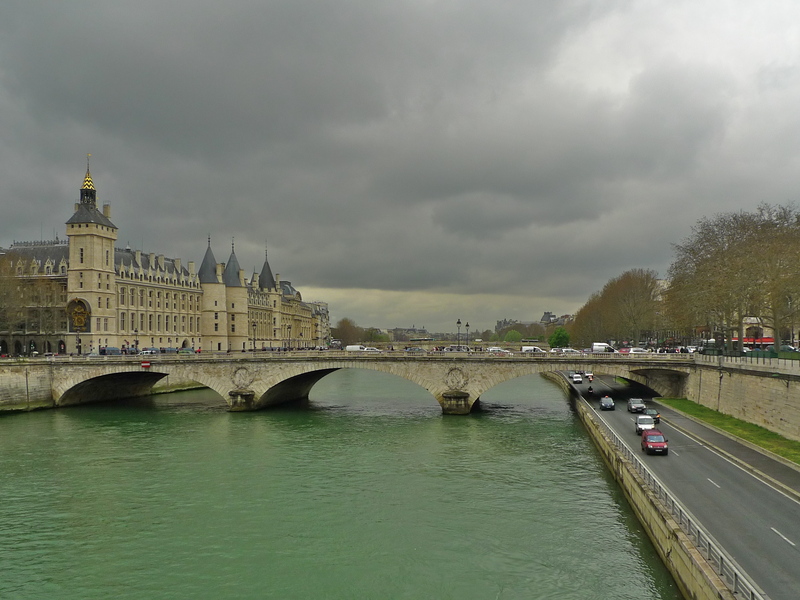 But it doesn’t necessarily follow that the sounds of the water and the river and vehicular traffic will be the same at each bridge – at least not if you’re an acute listener. 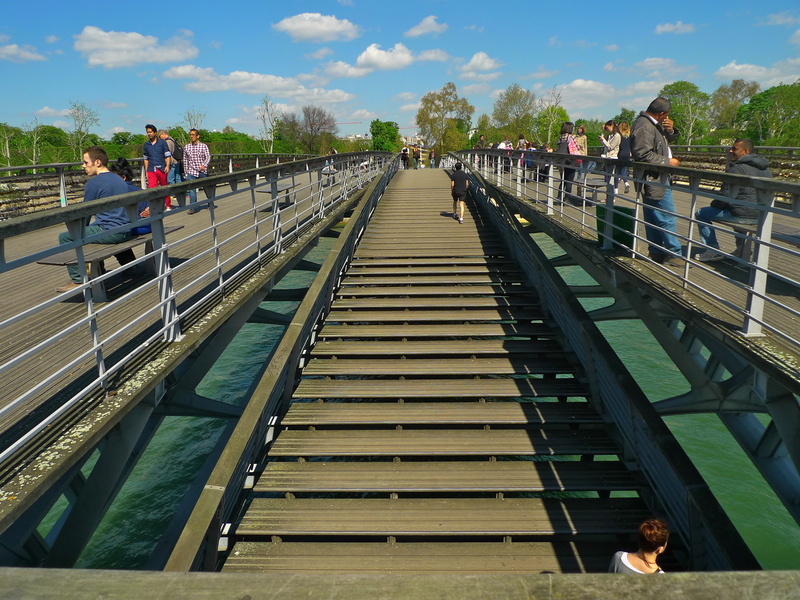 And what about the other sounds, are there any sounds that are unique to any particular bridge? 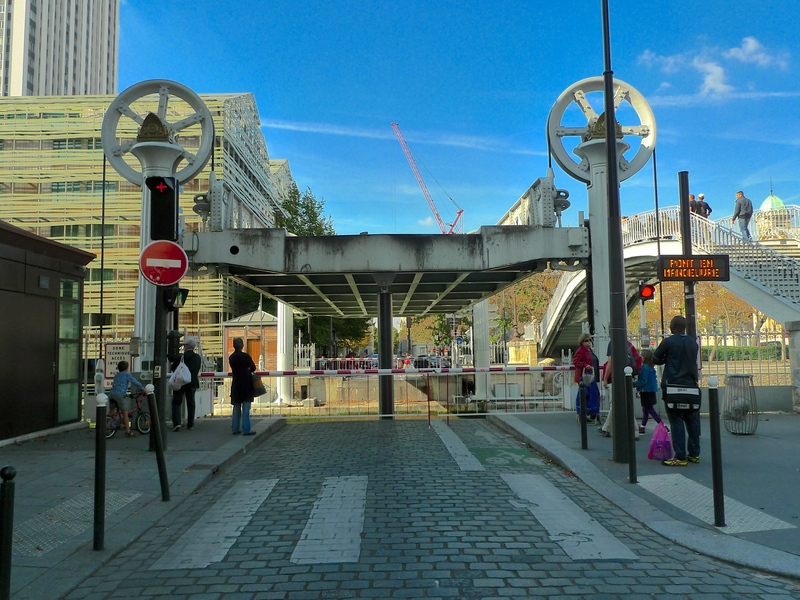 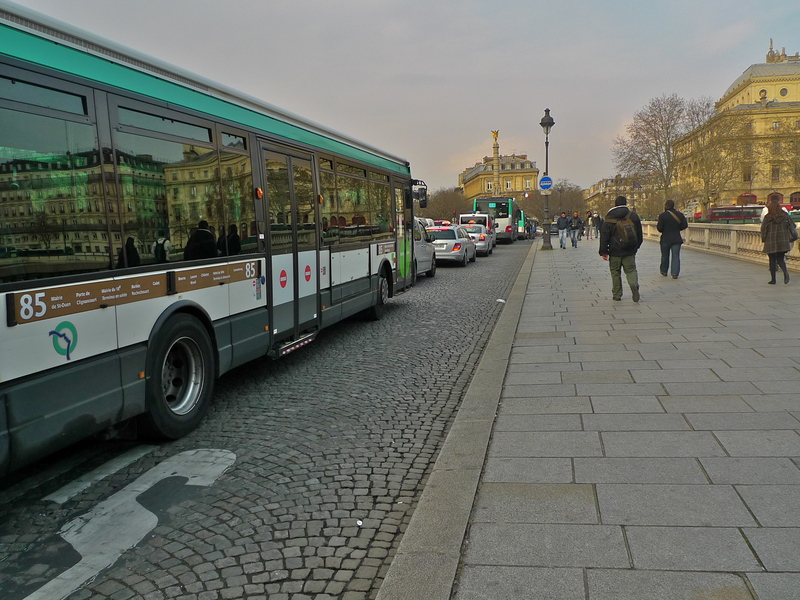 Previously, I’ve published posts about the Pont National and the Pont de Bercy both of which have unique sounds, trams running over the former and the Métro running over the viaduct on the latter – and the Pont au Change too has its own unique sound. 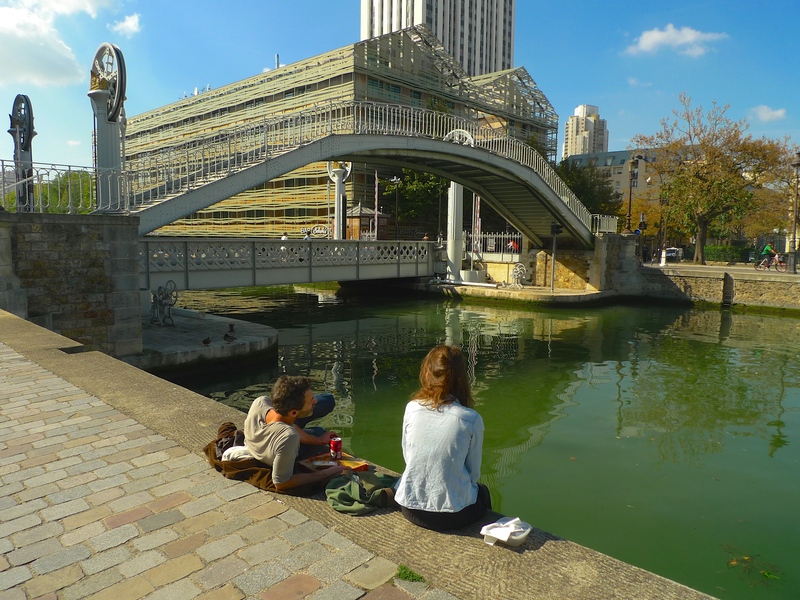 But before we come to that unique sound, it can’t be denied that both the water and the traffic are integral parts of the sound tapestry of the Pont au Change. 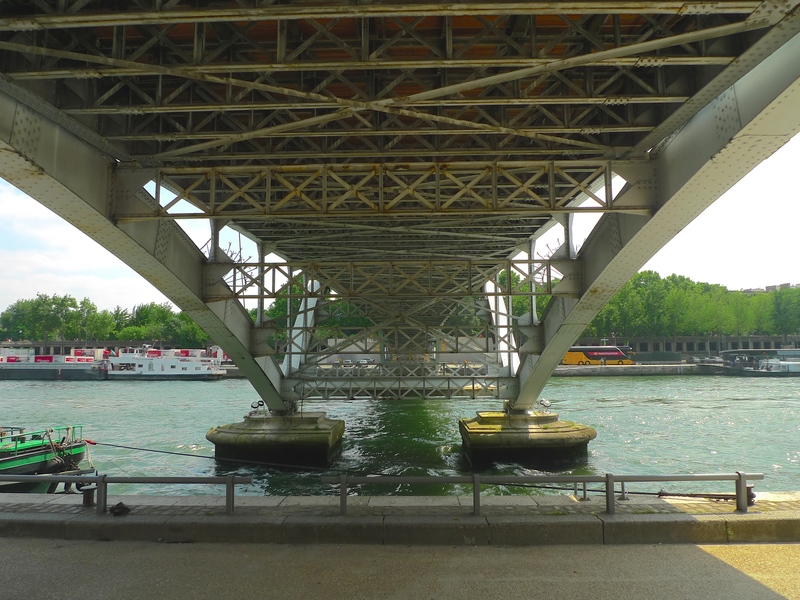 I went down to the Voie Georges Pompidou to explore the sounds under the bridge. 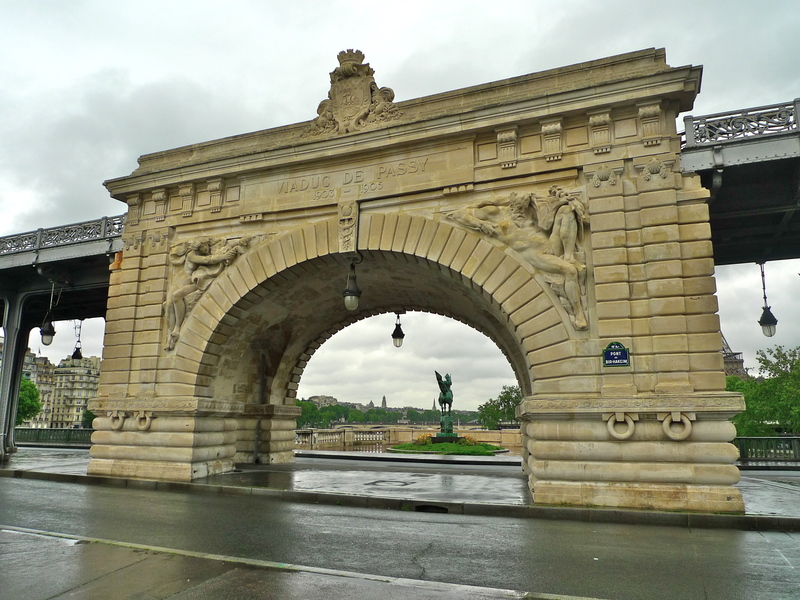 I stood under the arch close to the road facing into the bridge with the traffic passing me from right to left. 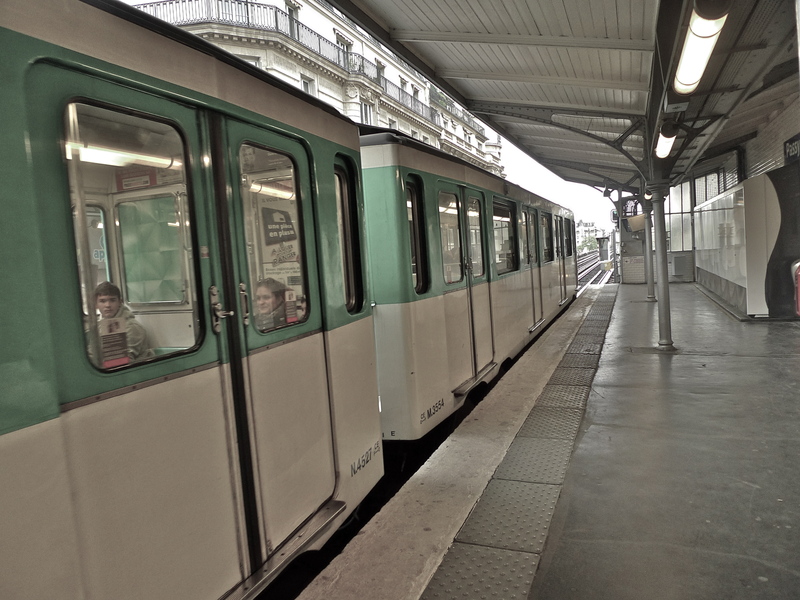 Listening to sound is a very subjective thing. 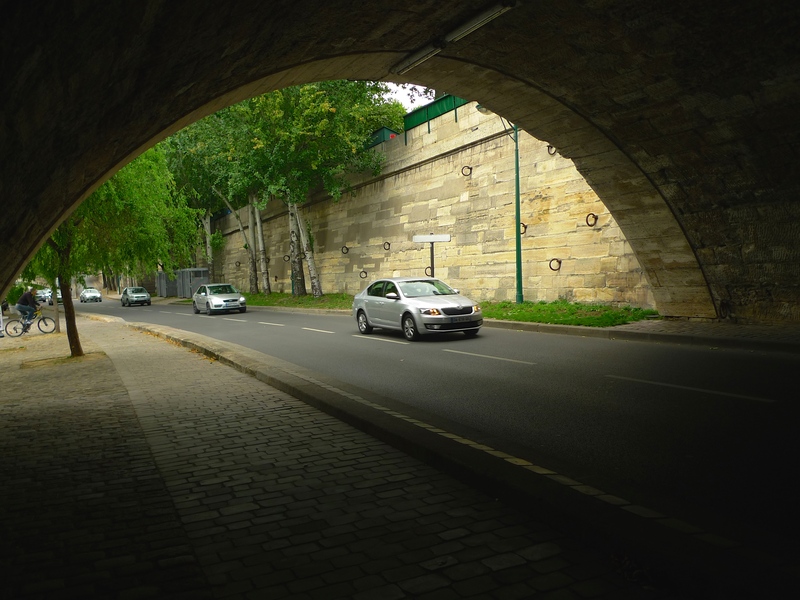 Whether or not you find these sounds of the traffic passing under the bridge interesting or maybe even enjoyable is a matter of personal taste, but in my opinion at least, these sounds have a value. 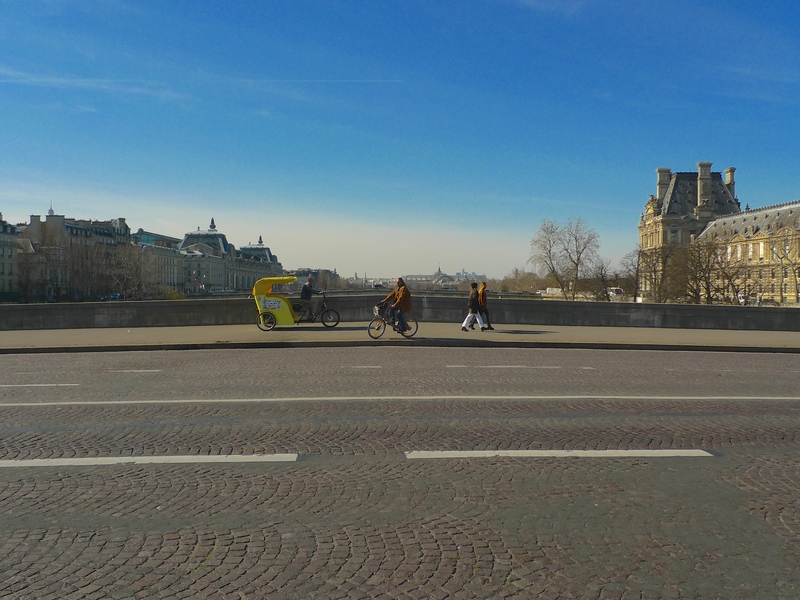 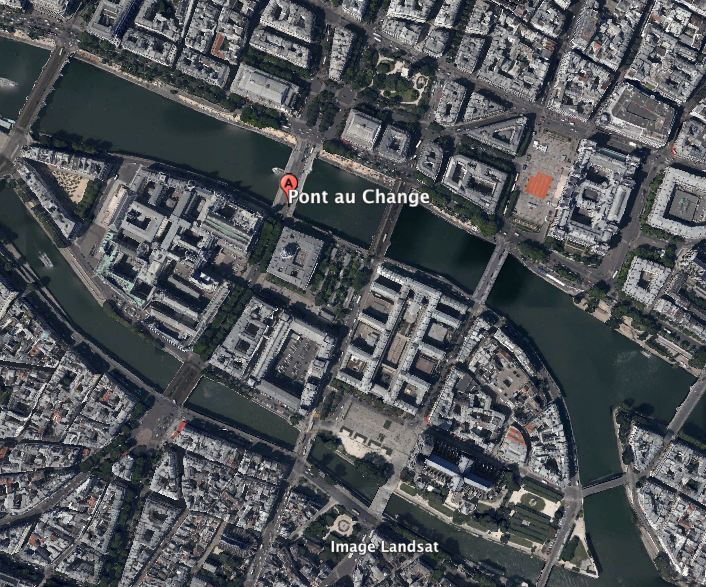 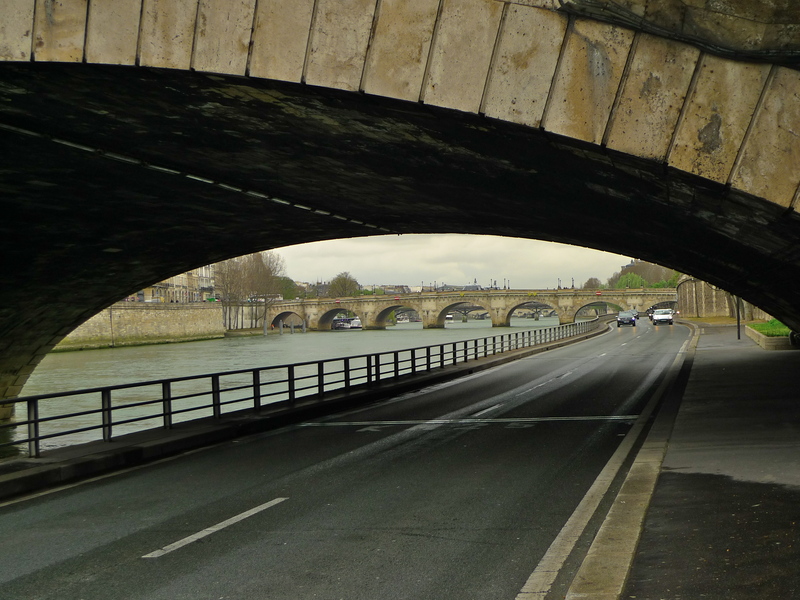 They may be just the sounds of passing traffic but they are a documentary record of the sounds in this place on a particular day in 2014 and they are some of the characteristic sounds associated with the Pont au Change. 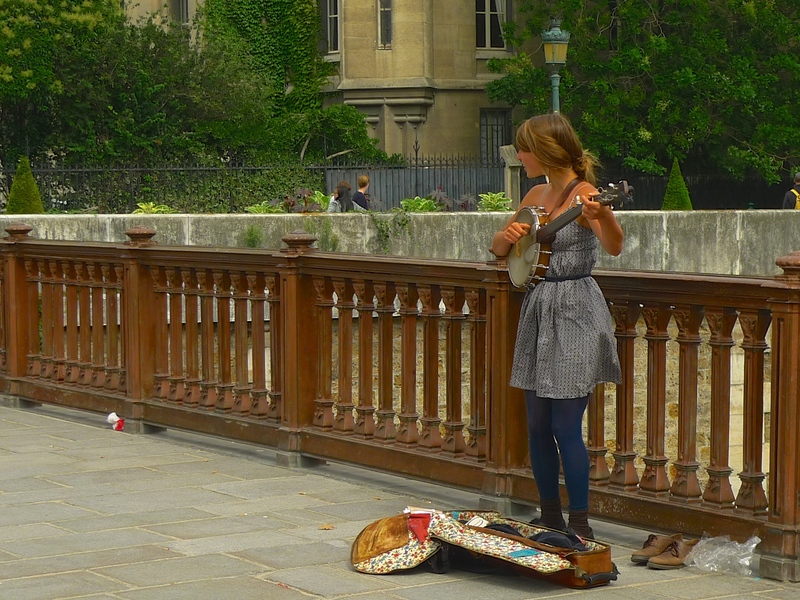 Personally, I find that these sounds have a rhythm to them that becomes absorbing with repeated listening. 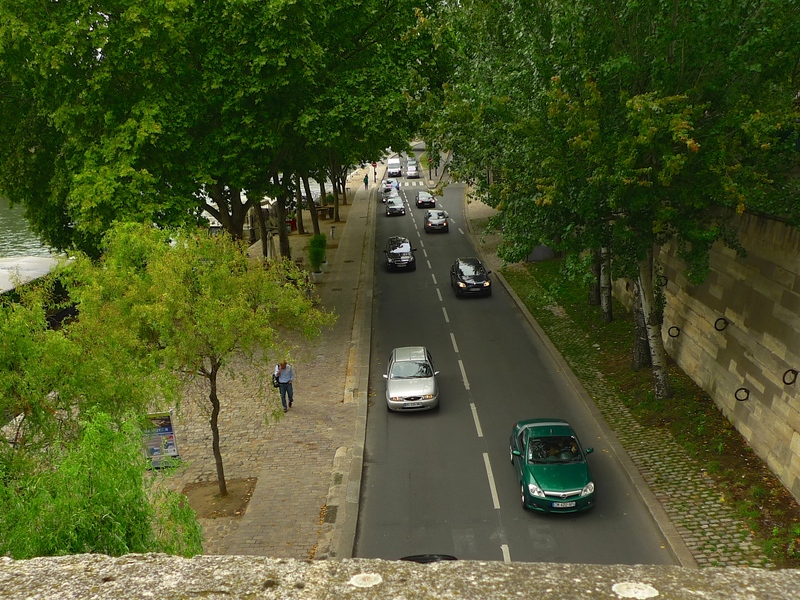 Interestingly, the traffic passing along this road sounds completely different when listened to from the Quai de Gesvres above. 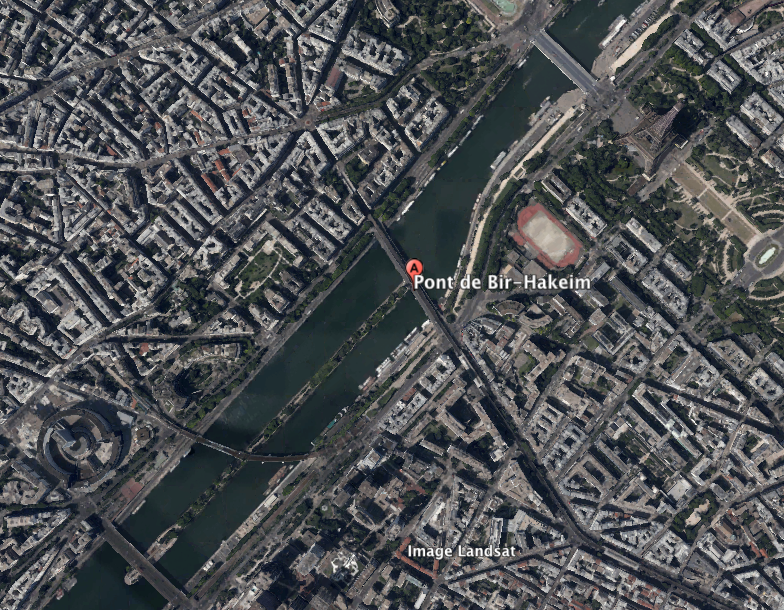 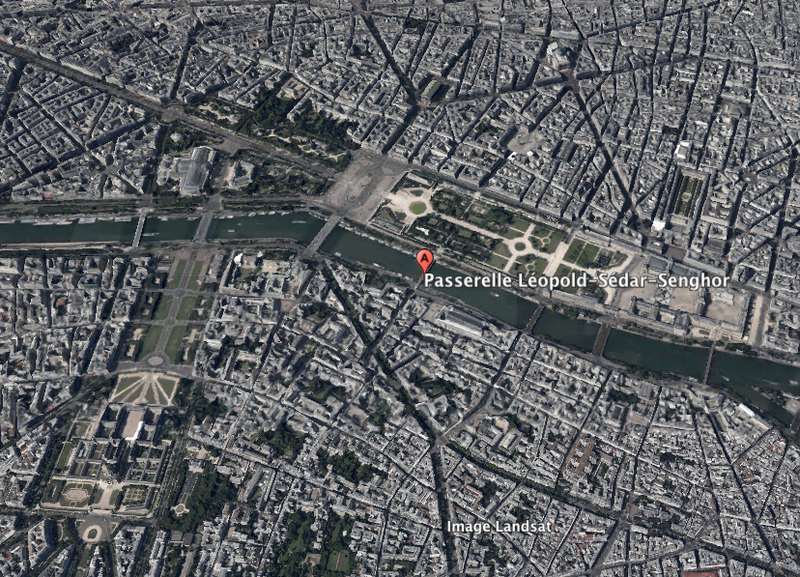 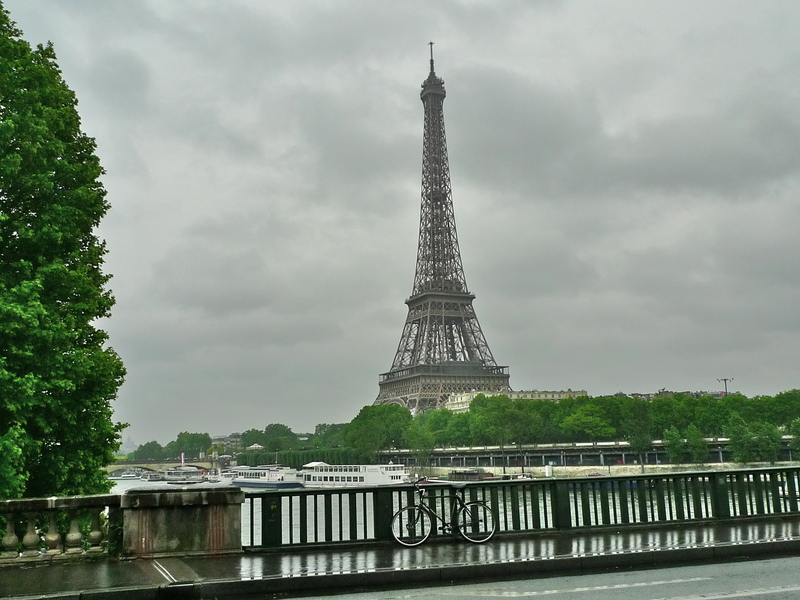 And what about the other characteristic sounds we might expect to find at a Paris bridge – the sounds of water perhaps? 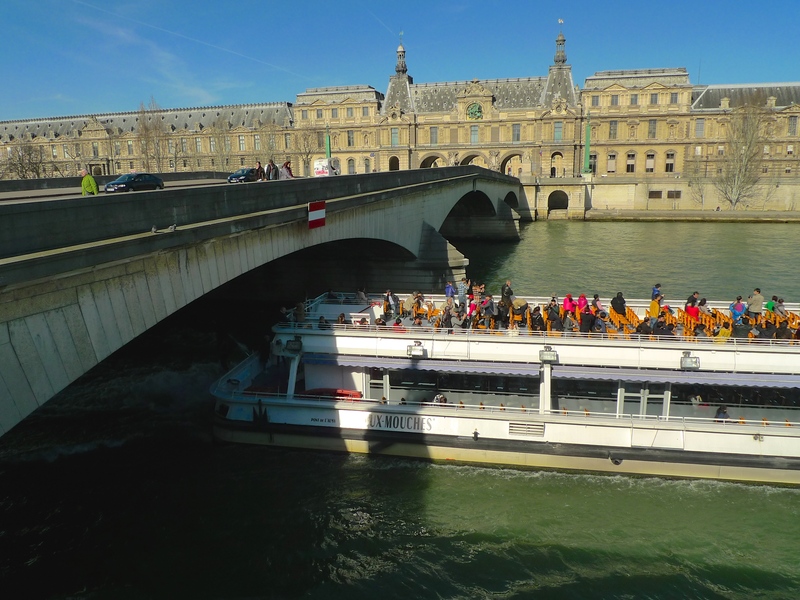 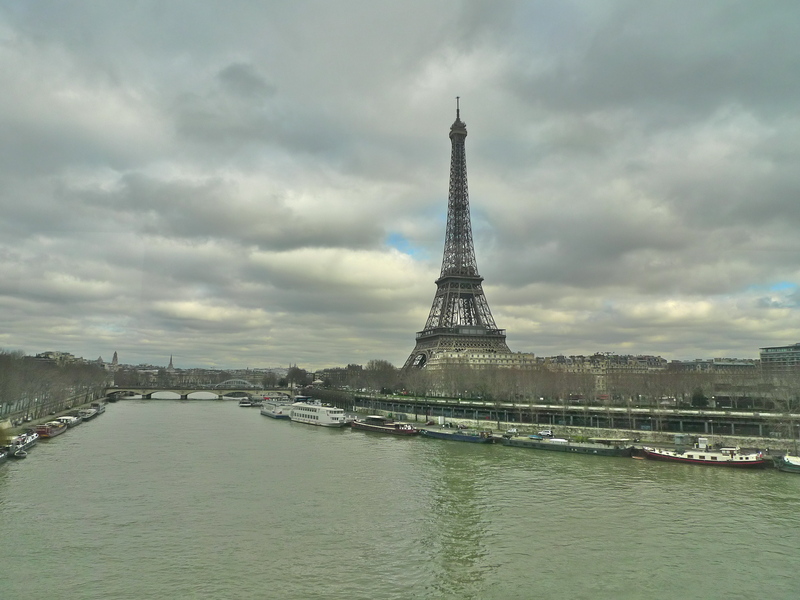 Recording the sounds of the water from the Voie Georges Pompidou would have been a thankless task not only because it would be perilous in the extreme but also because the sound of the passing traffic is all consuming. 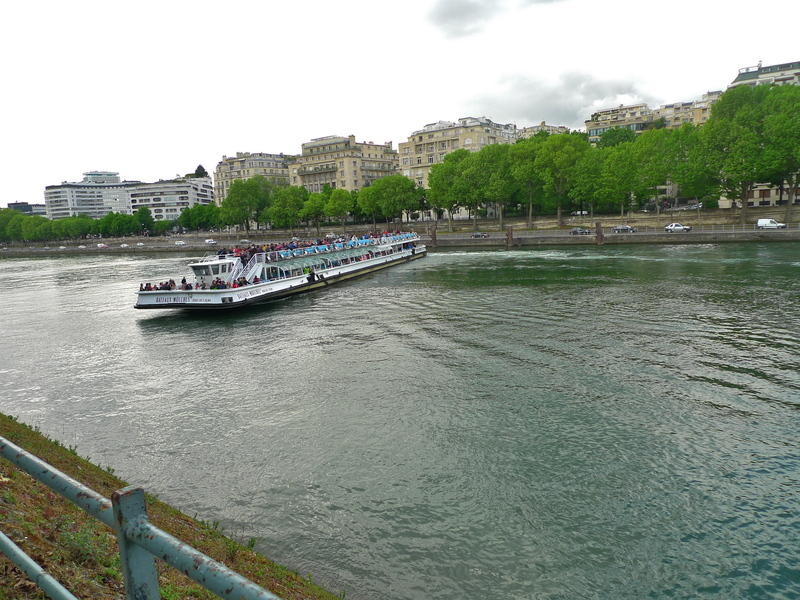 There seemed to be better prospects though on the opposite side of the river. 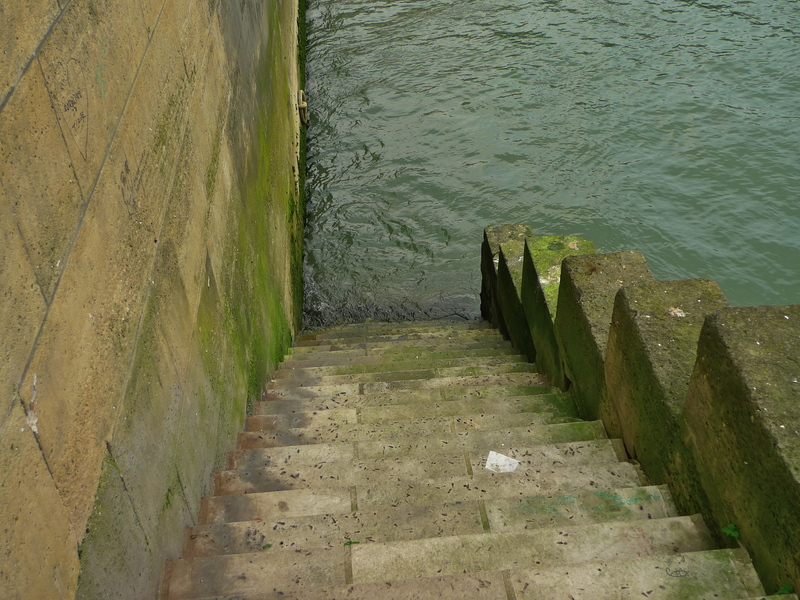 From the Quai de la Course a set of stone steps leads down to and then below the water. 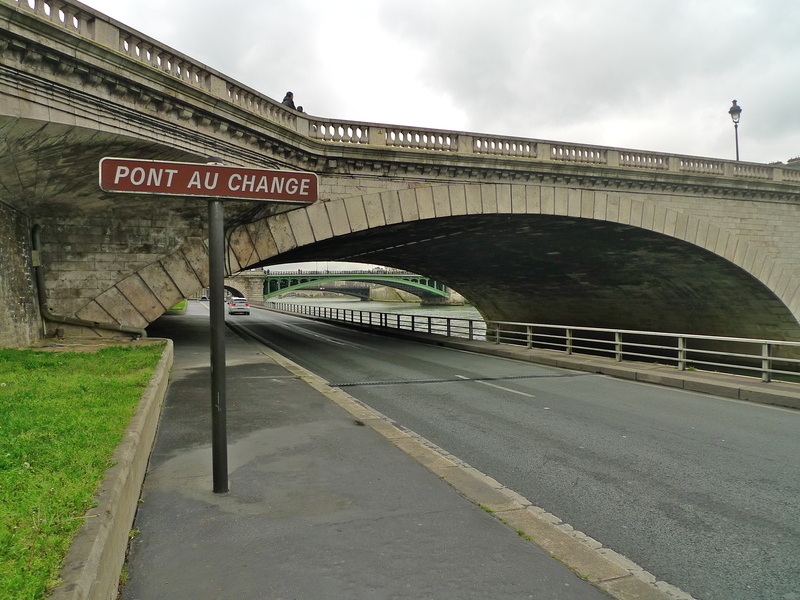 Looking at the Pont au Change from here on this very dull and overcast day reminded me that in Victor Hugo’s novel, Les Miserables, police Inspector Javert finds himself unable to reconcile his duty to surrender Jean Valjean to the authorities with the fact that Valjean saved his life. 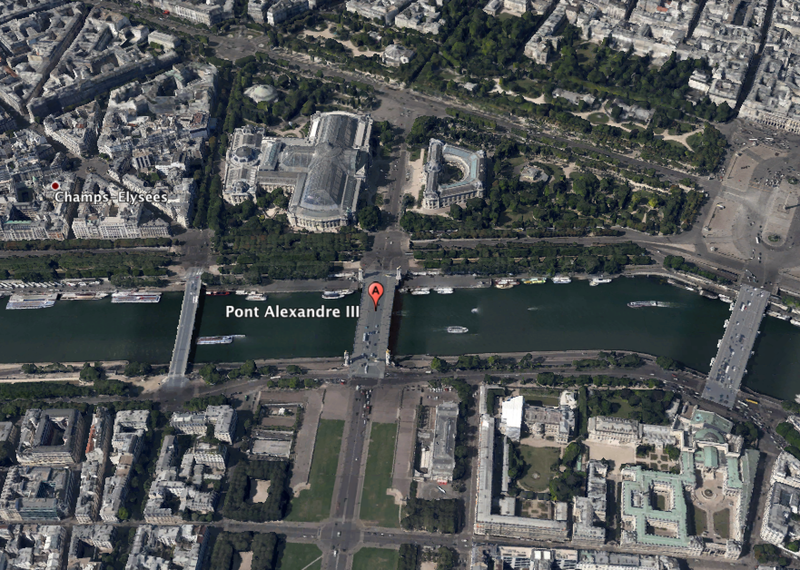 Javert comes to the Pont au Change and throws himself into the Seine. 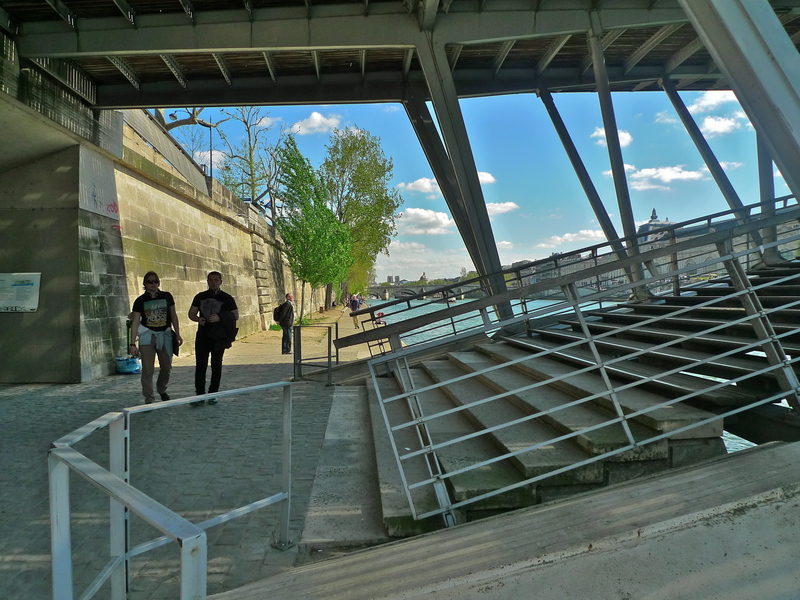 With no wish to throw myself into the Seine I ventured down the steps and began to record. 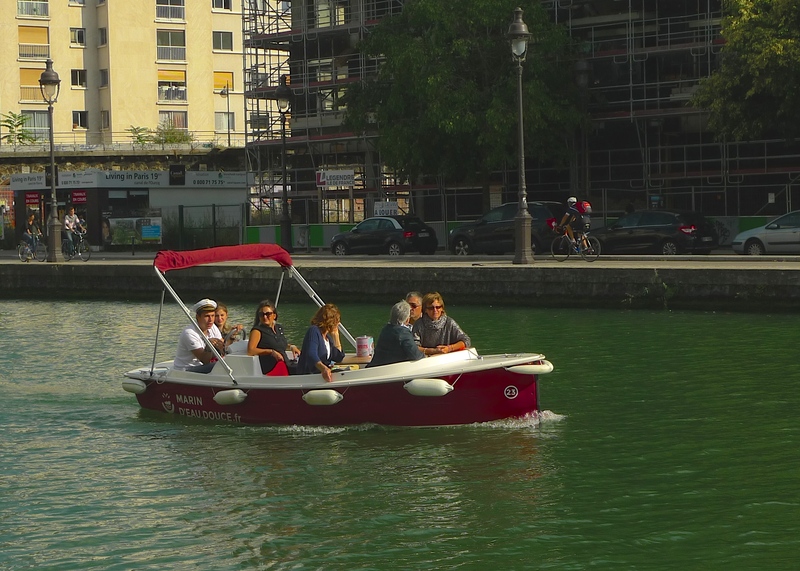 Echoes of Inspector Javert though were present in the shape of the police sirens in the distance and then the sound of a rubber dinghy containing three police frogmen armed to the teeth zooming by. 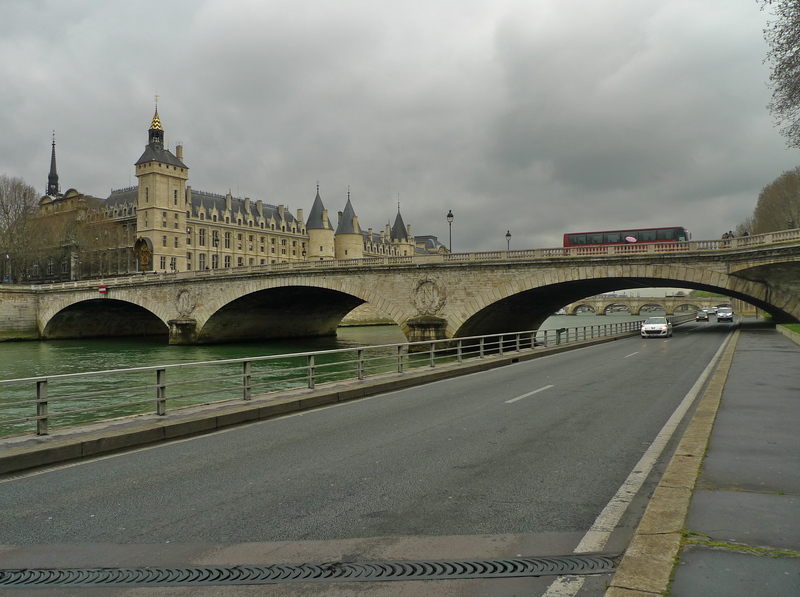 It seems that I had chosen to visit the Pont au Change on the same day that the President of China had chosen to visit Paris so presumably the frogmen were part of the elaborate security apparatus. 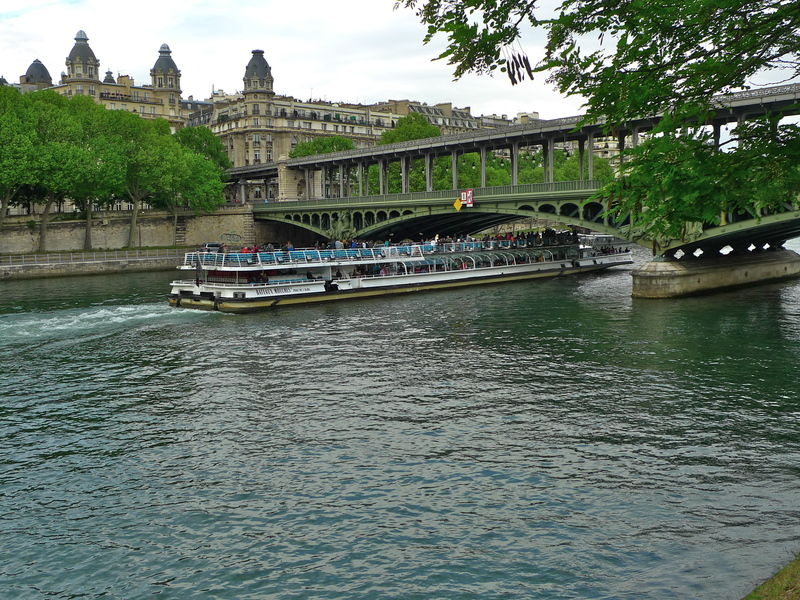 While the sound of the passing dinghy is not a characteristic sound of the Pont au Change, it just happened to be there at this time on this day, the sound of the water certainly is. 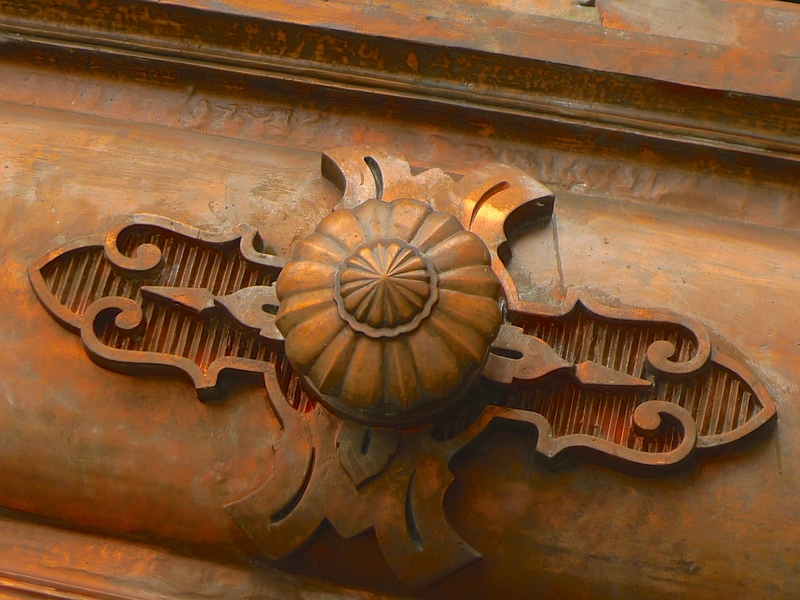 Perhaps it’s worth pausing to consider what I mean by ‘characteristic’ sounds. 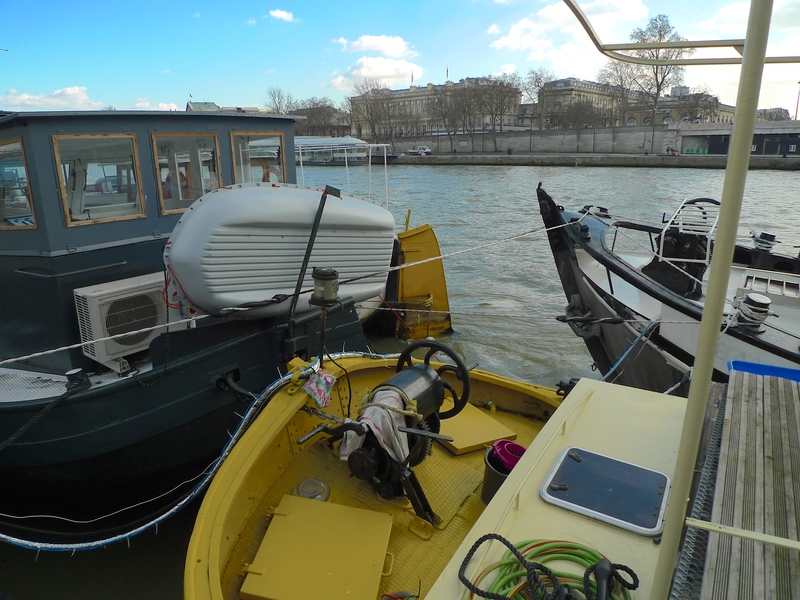 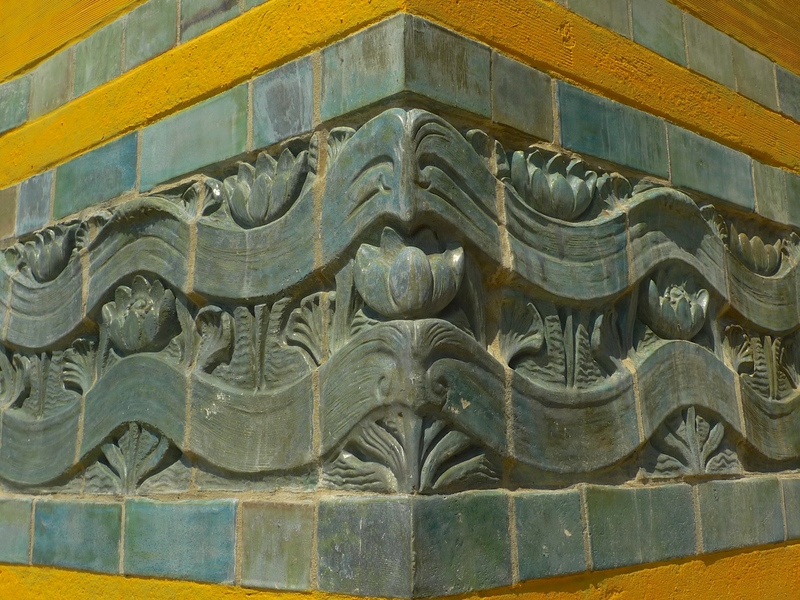 Most of the sound work I do in Paris is concerned with the concept of ‘sound’ and ‘place’ – the relationship between the two and particularly how sound can help to define a place. 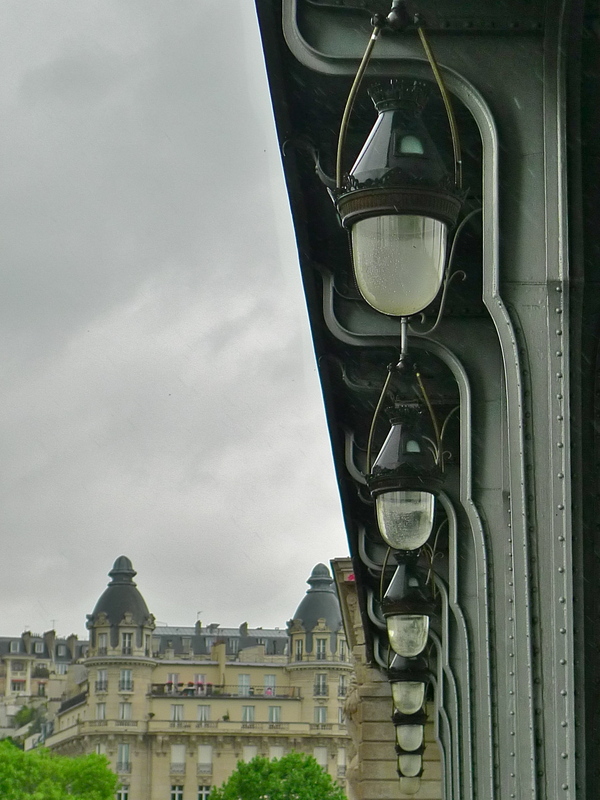 In the context of my ‘Paris Bridges’ project, I’m seeking to find the characteristic sounds that define each bridge. 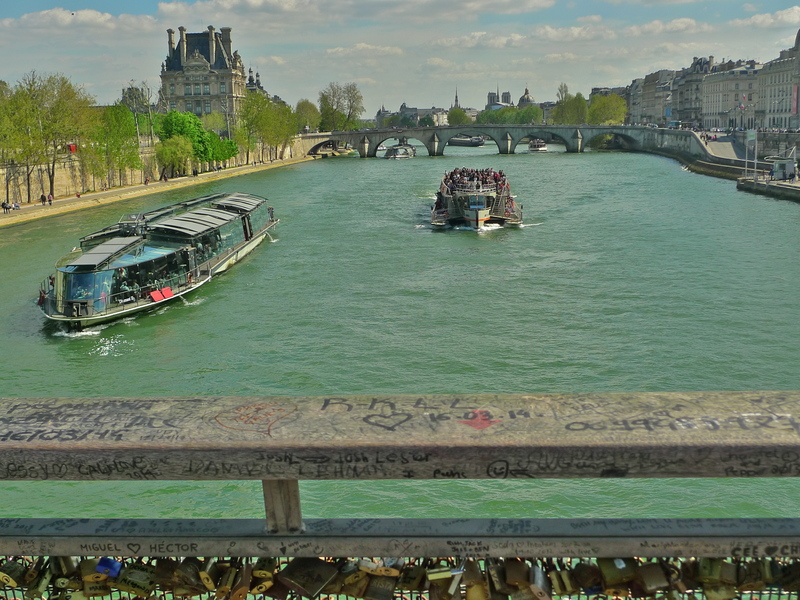 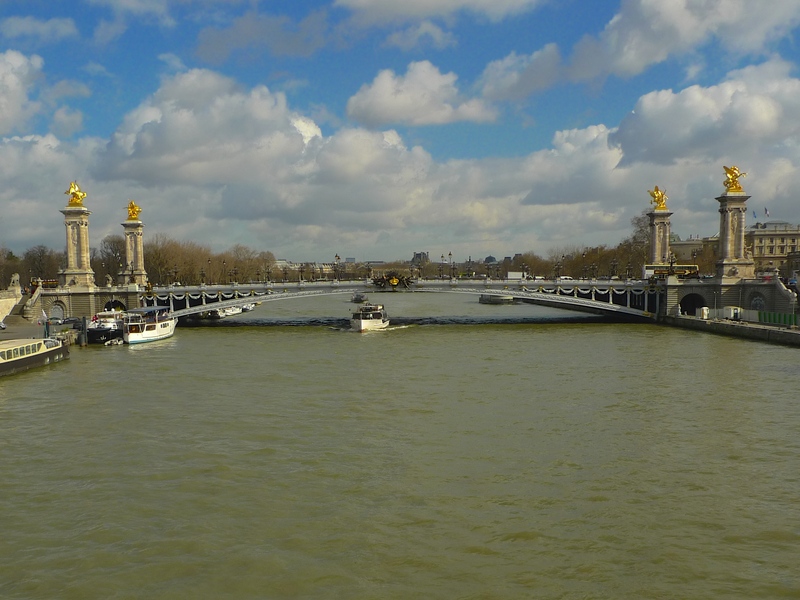 I’ve already said that the sound of water and of river and vehicular traffic are pretty much common to all the bridges within the Paris city limits but that doesn’t mean that these sounds are all the same. 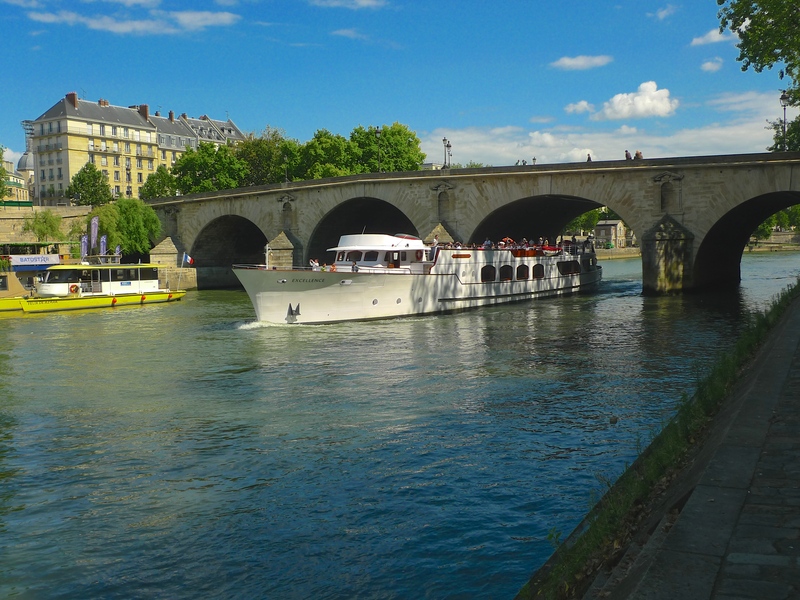 The sounds of the Bateaux Mouches passing under the Pont Saint-Michel are very different to the sounds of the same boat passing under the Pont des Arts for example. 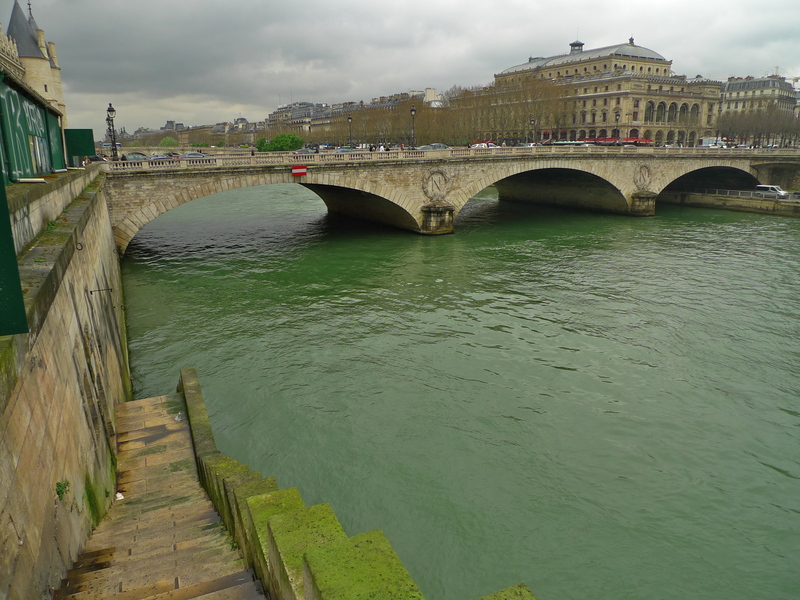 The sounds of the water at the foot of the steps at the Pont au Change are different from the sounds of the water at the Pont Neuf, the next downstream bridge, and the sounds of vehicular traffic passing under the Pont au Change are very different to the sounds of the traffic passing over it as we shall see in a moment. 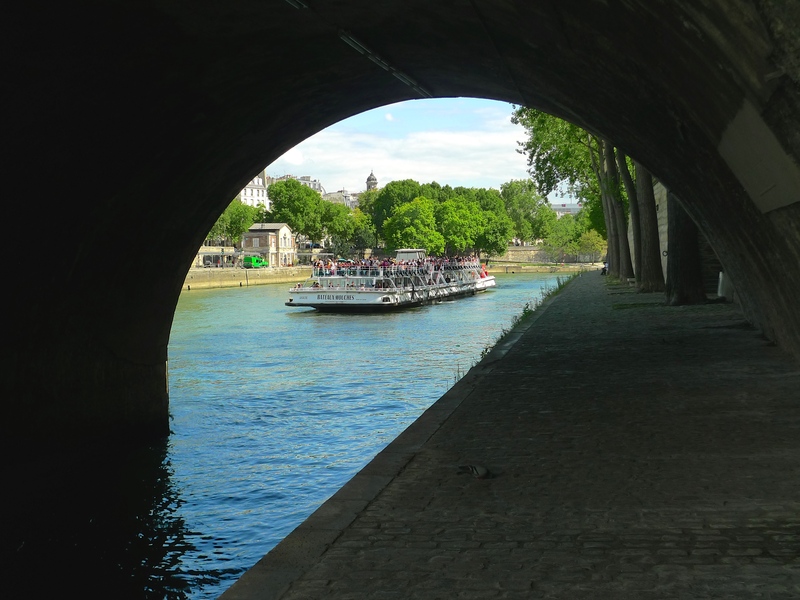 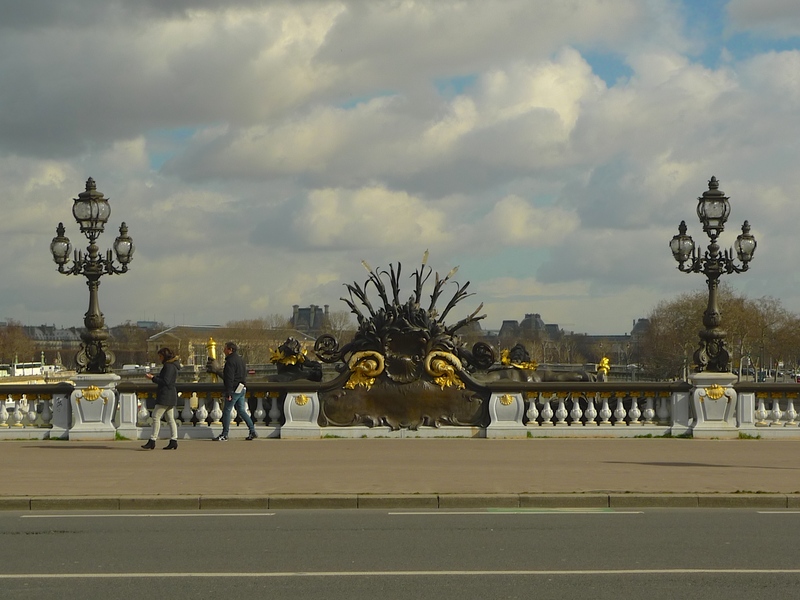 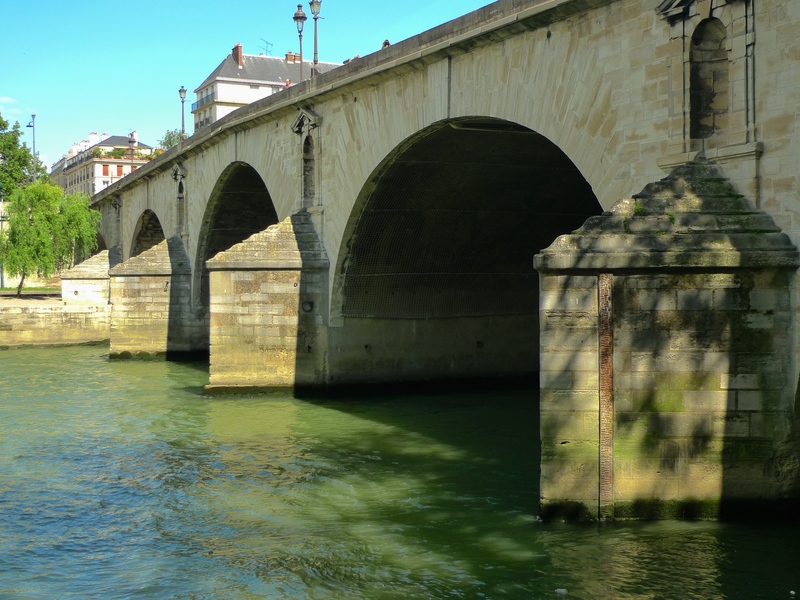 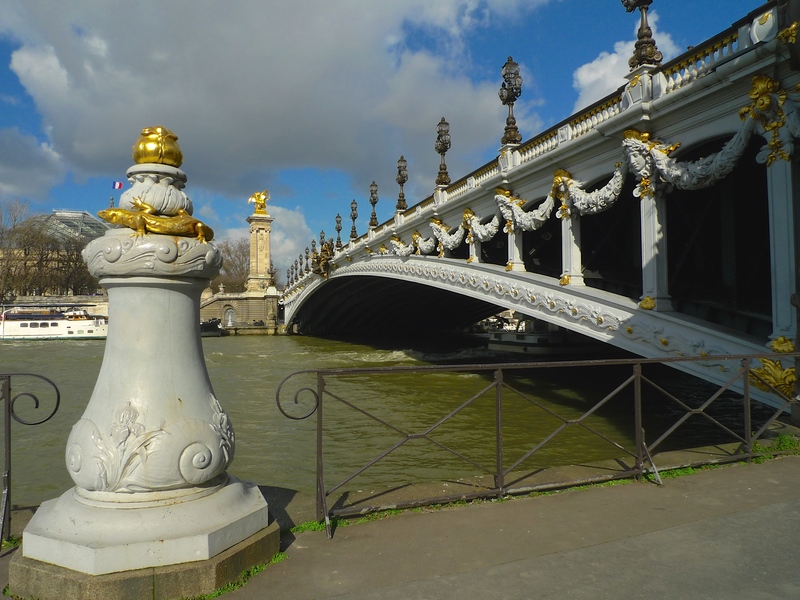 I contend that the sounds of water and of river and vehicular traffic are ‘characteristic’ sounds of the Paris bridges and, if listened to carefully enough, the very subtle differences can help to define each bridge. 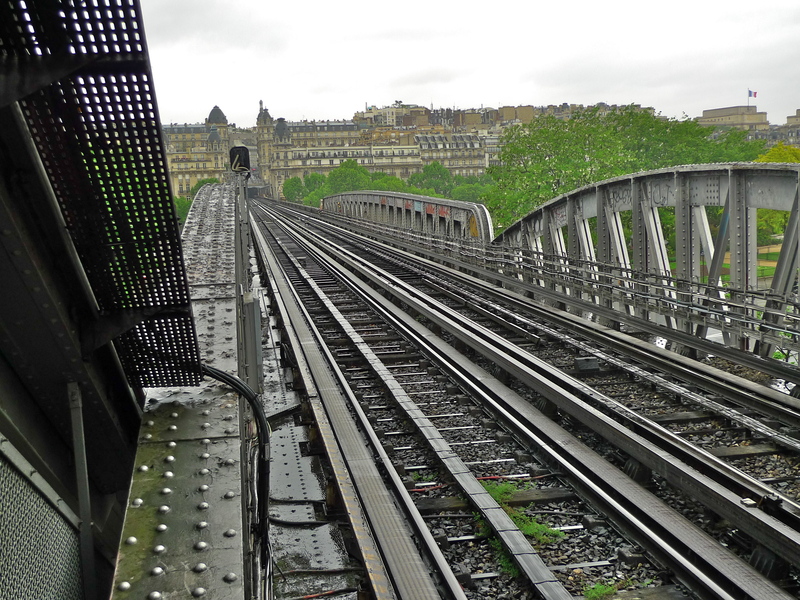 My real challenge though is to find the characteristic sounds for each bridge that don’t require an explanation or expert listening, the sounds that simply shout out, “I’m here, I’m unique, I AM the sound of this bridge!” I’ve already mentioned two examples, the trams running over the Pont National and the Métro running over the viaduct on the Pont de Bercy but for some other Paris bridges such obvious defining sounds may be harder to find. 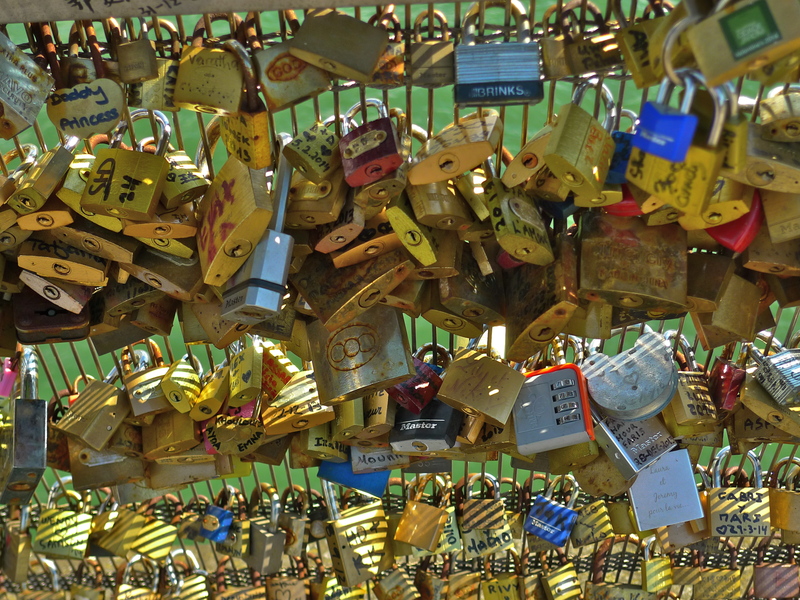 What makes these sounds ‘characteristic’ though, whether they are very subtle or very obvious, is that they are permanent. 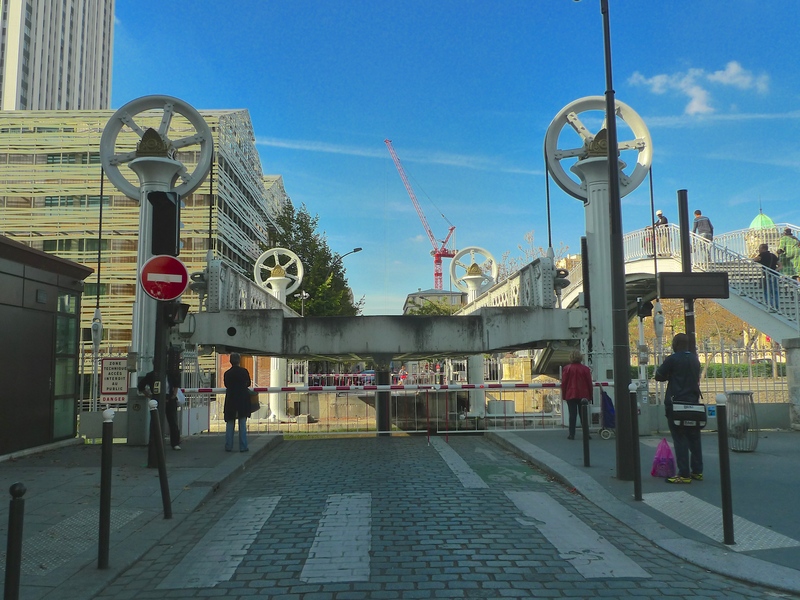 They are not simply passing sounds like the police frogmen that might be there one day and not the next; they are always there – at least until some major reconstruction takes place that removes them. 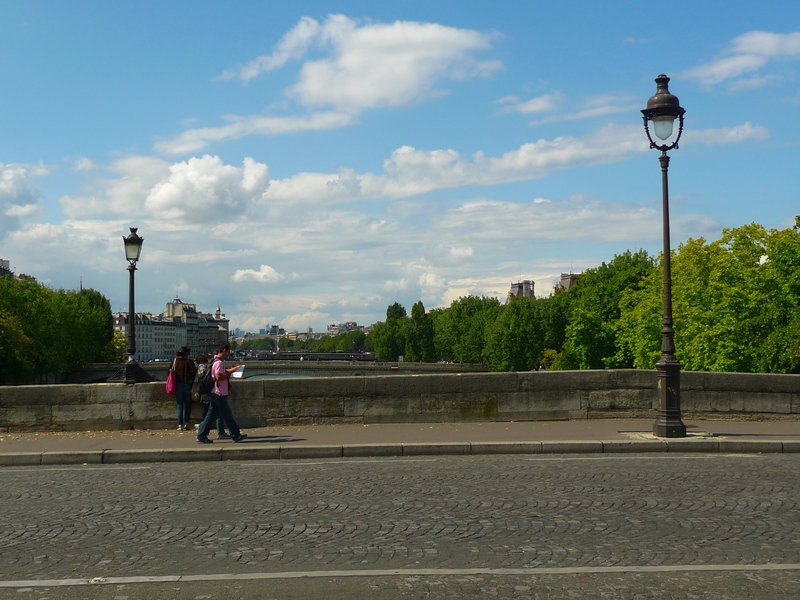 And so, back to the Pont au Change. 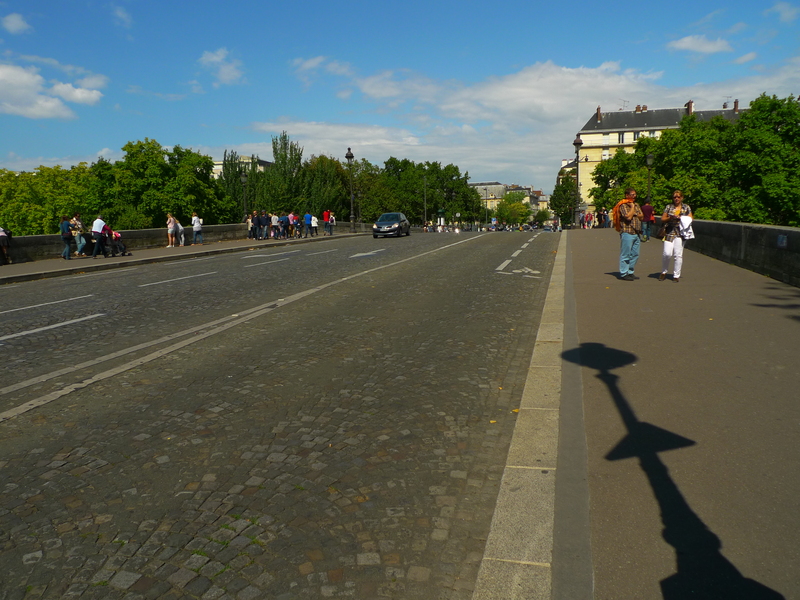 Between the pavements on either side of the Pont au Change is a roadway layered with pavé. 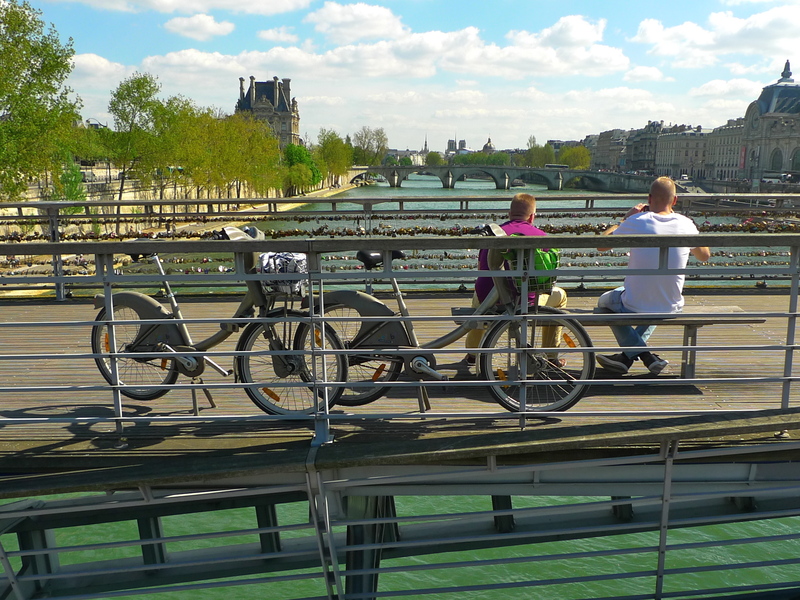 Clearly, the sound texture of the traffic passing over this pavé surface on the bridge is going to be different from the sound of the traffic passing over the tarmac road under the bridge. 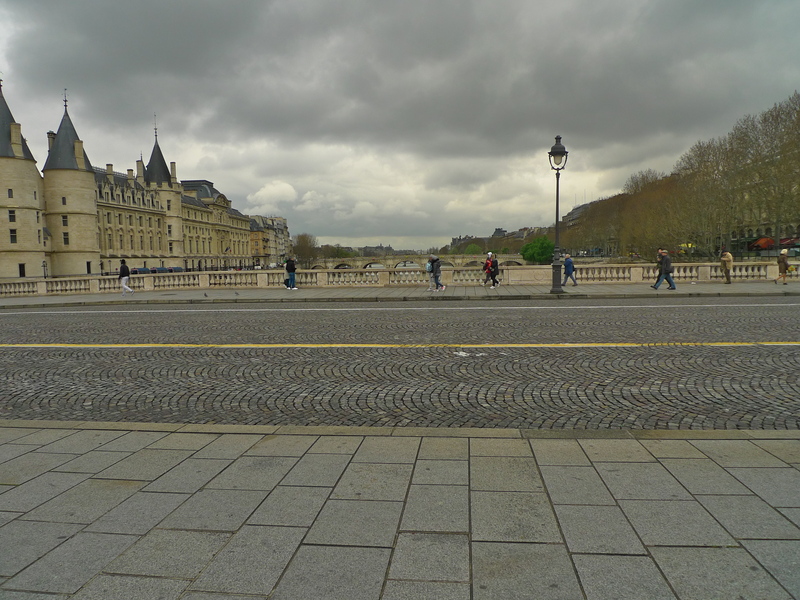 But as well as the rather subtle sounds of the traffic over the pavé, is there a more obvious sound at the Pont au Change, a sound that shouts out and demands to be heard? 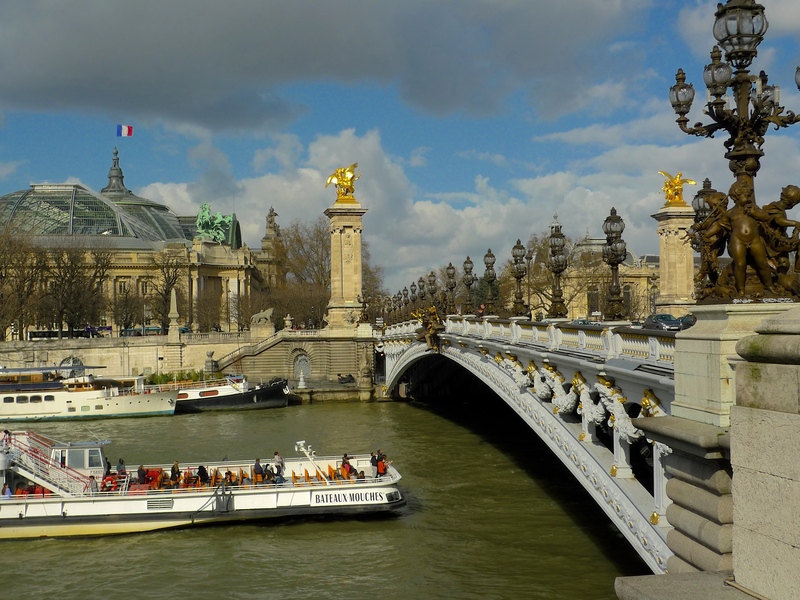 In my Paris Soundscapes Archive I have some sounds of Paris that last for over an hour and some that last only for seconds. 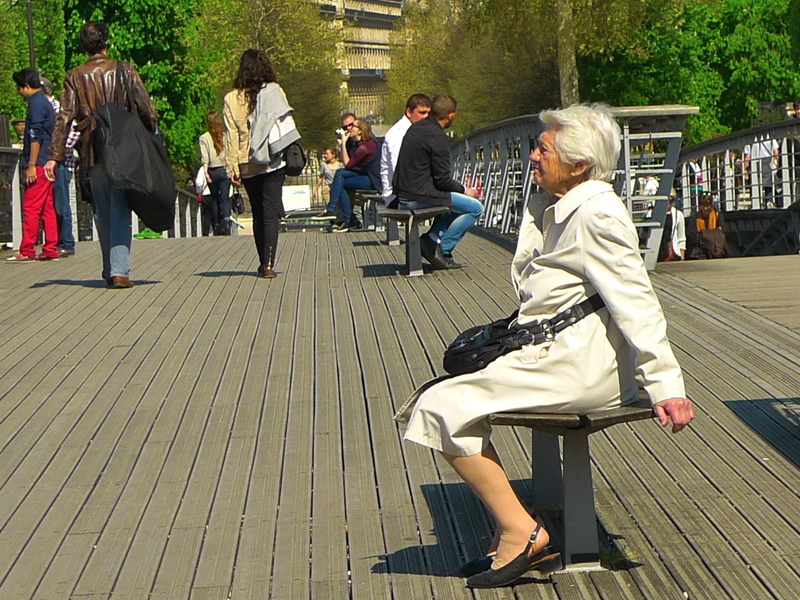 Often, the shorter sounds can say as much as the longer ones. 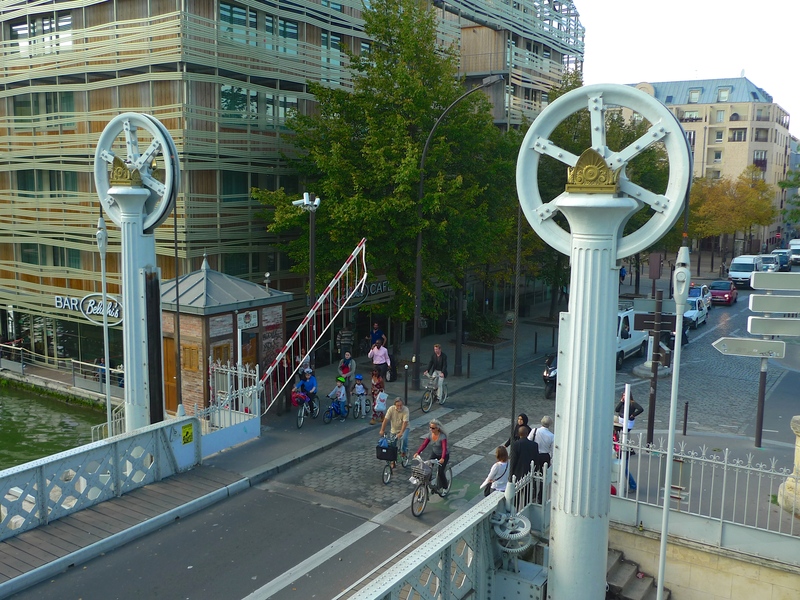 In the midst of all the sounds on the Pont au Change there is a sound that really defines this bridge. 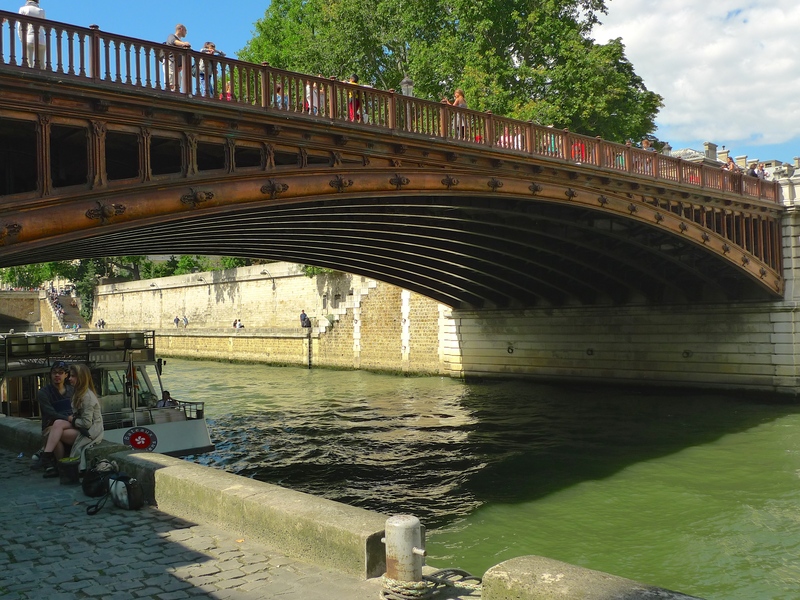 When I was at the bridge this sound only lasted for about three-seconds (sometimes it’s shorter and sometimes it’s longer) but while the sounds of the passing traffic and the people are transient, this sound is permanent and it has been heard here for hundreds of years. 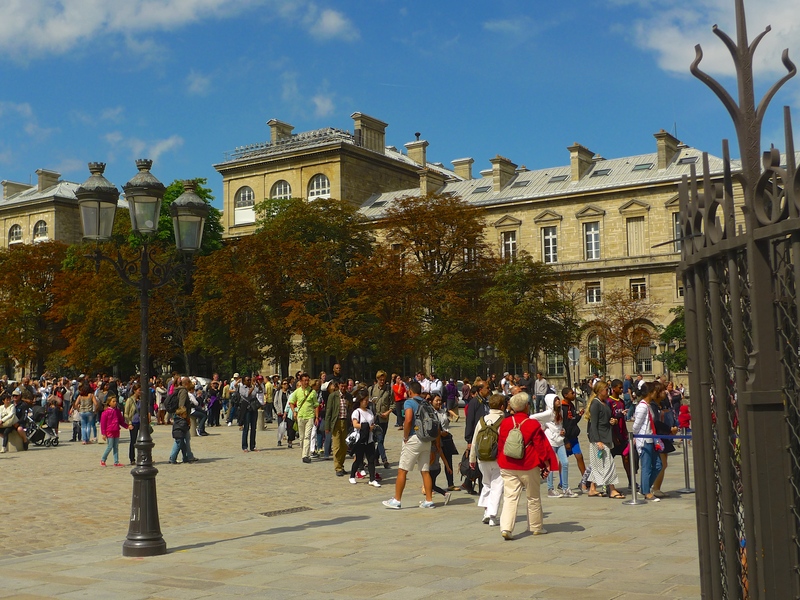 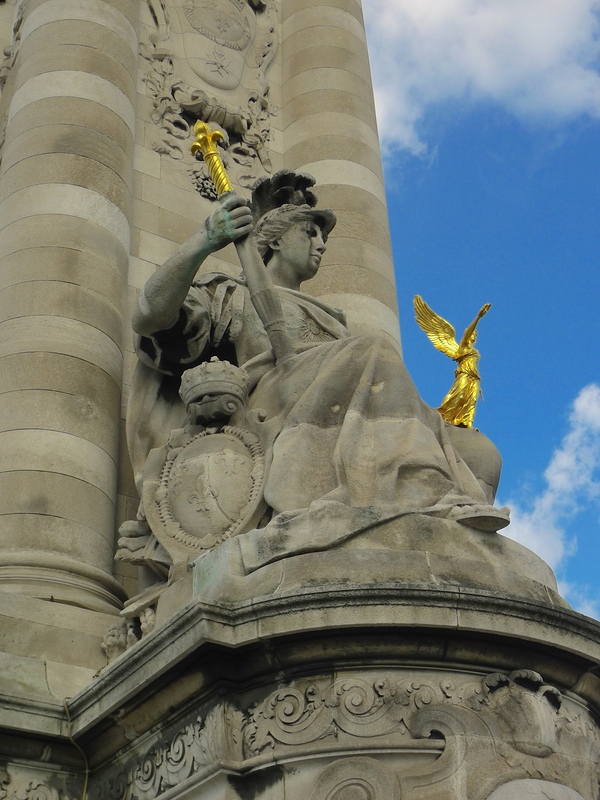 It’s the sound of l’Horloge du palais de la Cité, the oldest public clock in Paris. 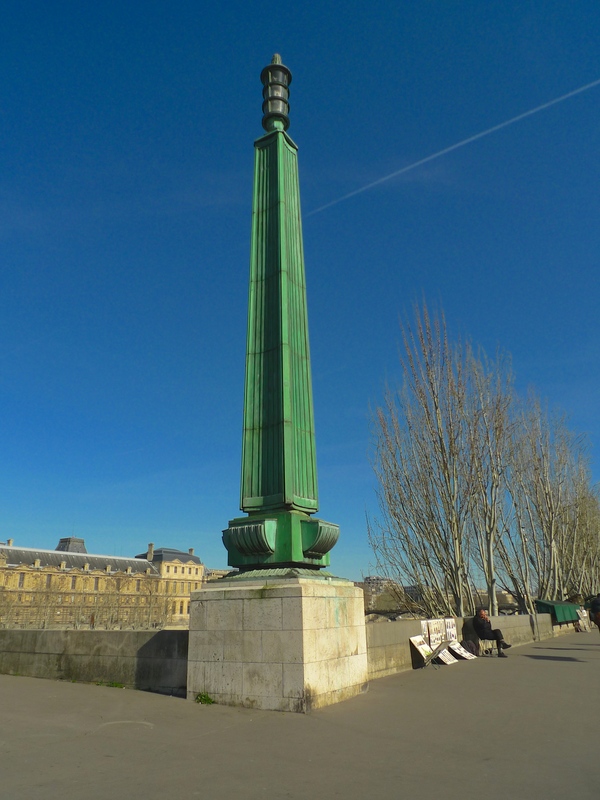 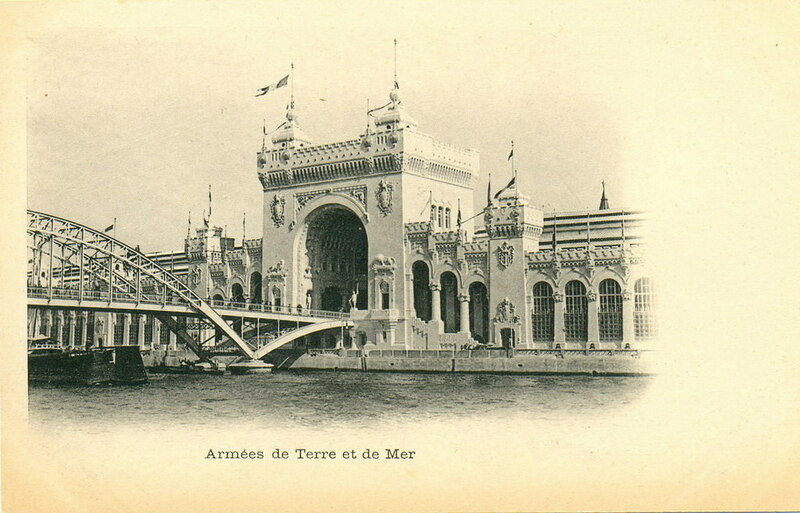 The clock is to be found in the Northeast corner of the Palais de Justice at the Left Bank end of the Pont au Change and its chimes can be heard across the bridge. 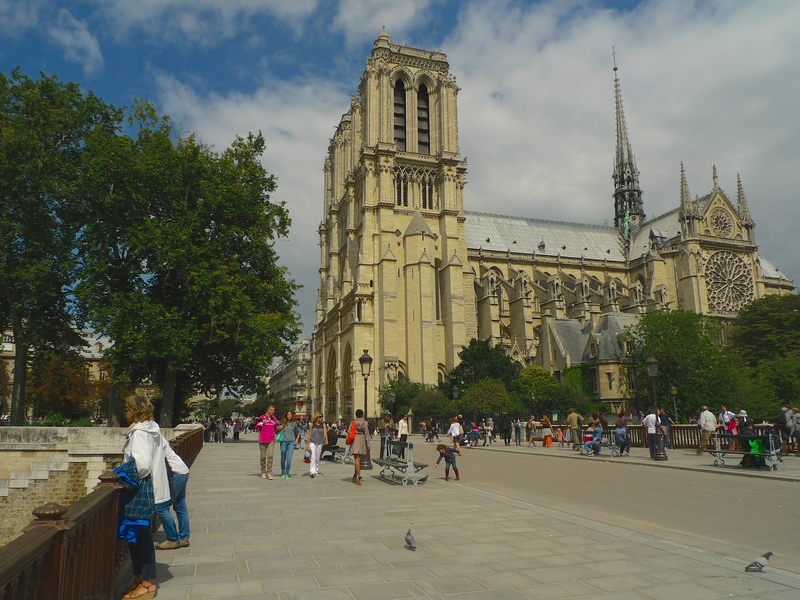 It dates from 1370 and it was built and installed by at the behest of Jean le Bon (John the Good), King of France from 1350 until his death in 1364. 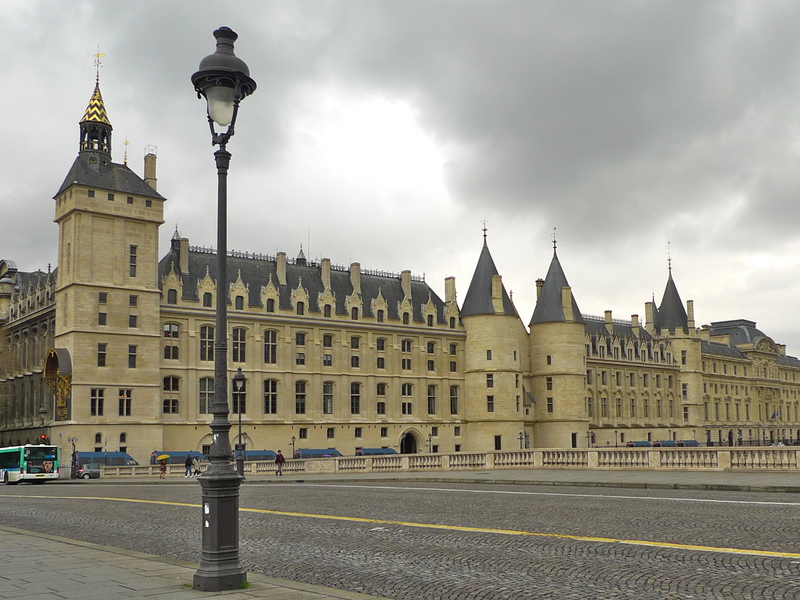 At this part of the Palais de Justice is la Conciergerie, both a former Royal Palace and later, a notorious prison. 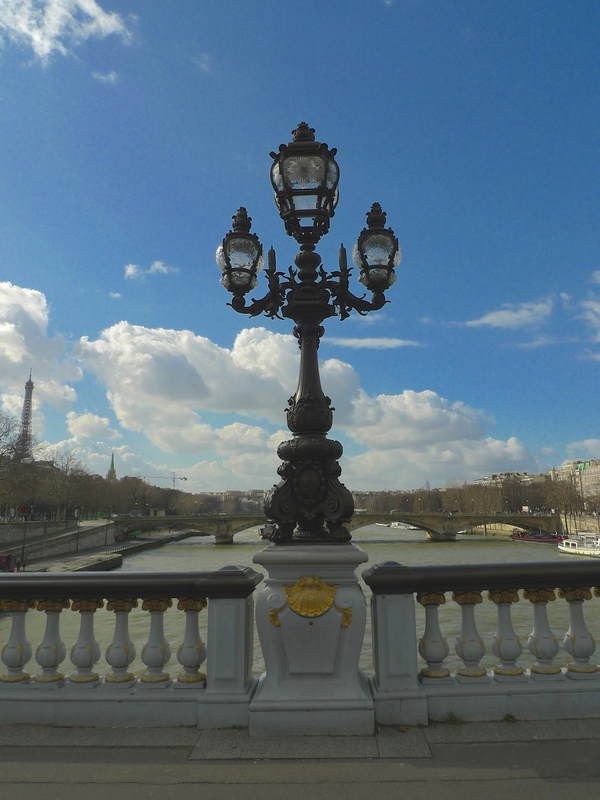 As chance would have it, I recorded the clock chiming at three o’clock in the afternoon. 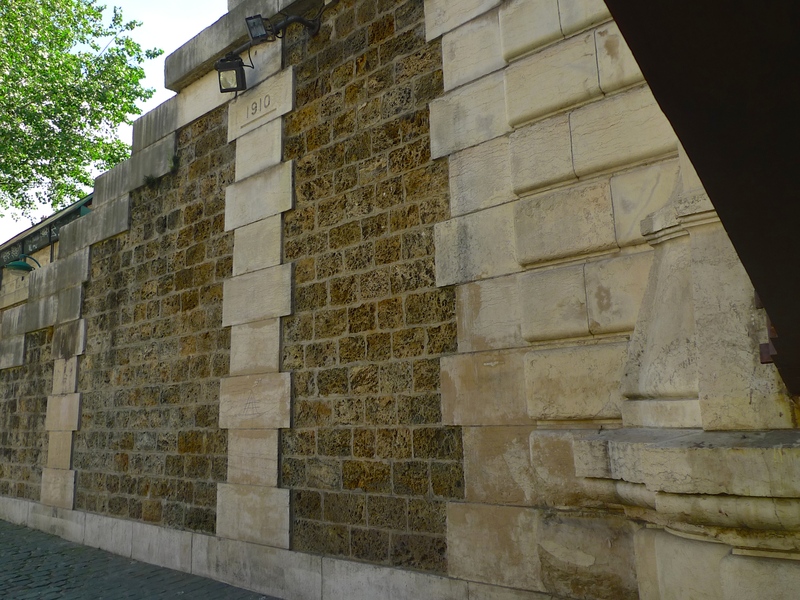 At exactly the same time on 17th July 1793 Charlotte Corday was sentenced inside the Conciergerie to be executed by guillotine for the assassination of the Jacobin leader Jean-Paul Marat during the French Revolution. 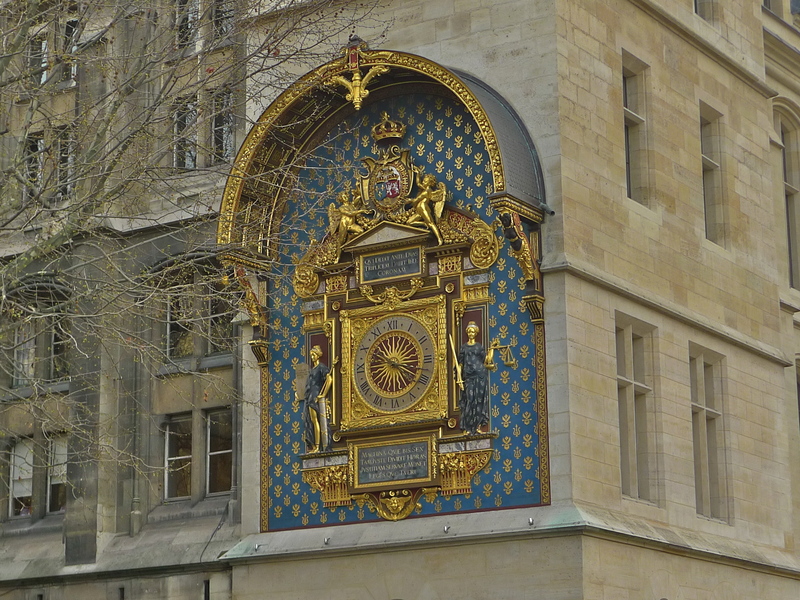 While she was being sentenced this same clock would have been chiming outside as it would at eight o’clock the same evening when she was beheaded. 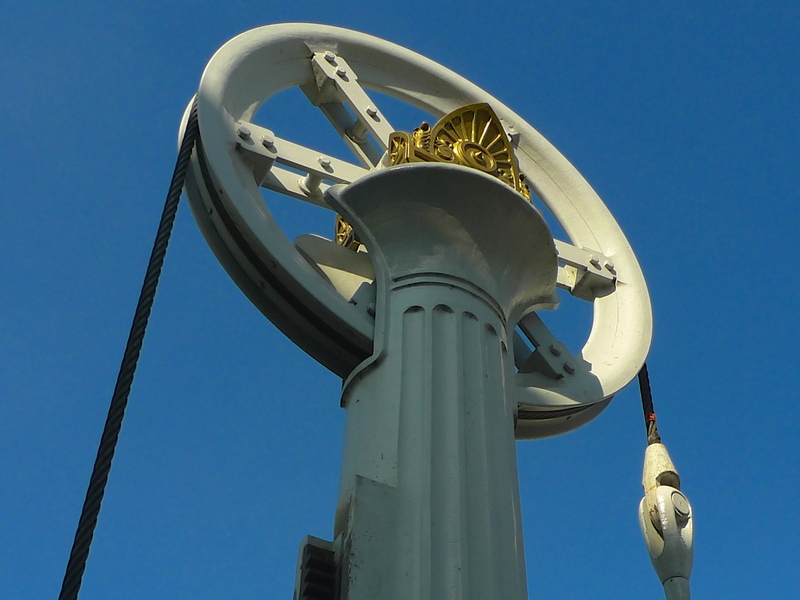 The clock has been restored several times throughout its lifetime, the latest restoration being in 2012, and today it looks and sounds probably better than it has ever done. 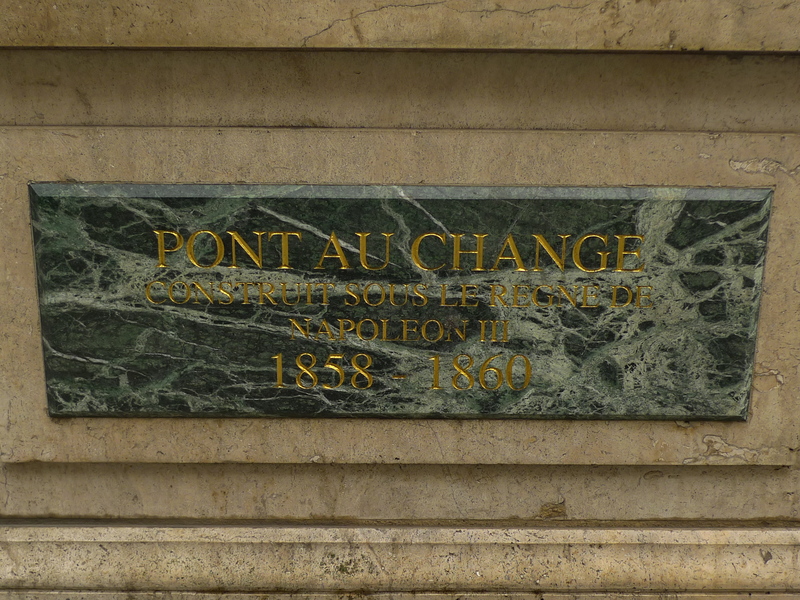 My exploration of the Pont au Change has taken me from the home of the ancient Parisii tribe on the swampland of an island in the middle of La Seine, to a Roman and then a Viking invasion, to the Lombardy money-changers, to Jean le Bon’s public clock, to the French Revolution and to Baron Haussmann’s urban development of Paris. 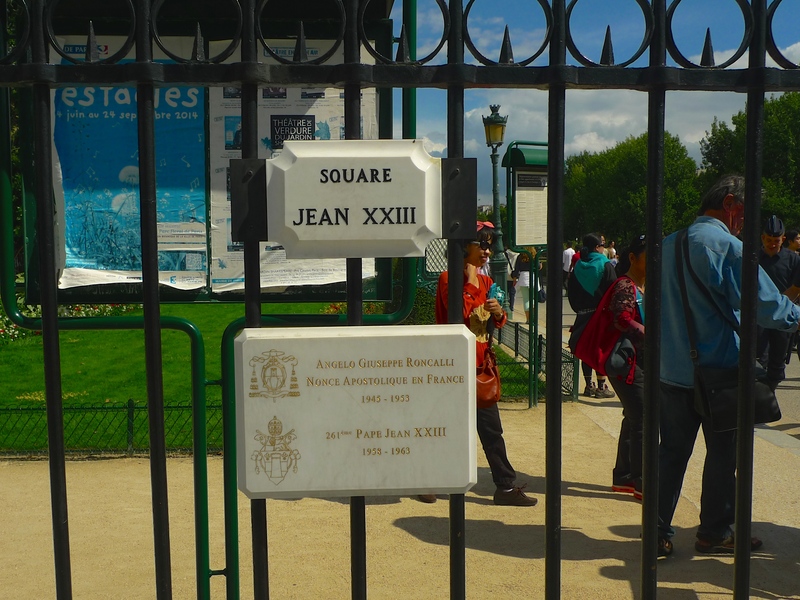 And let’s not forget police Inspector Javert from Victor Hugo’s Les Miserables … and three armed police frogmen. 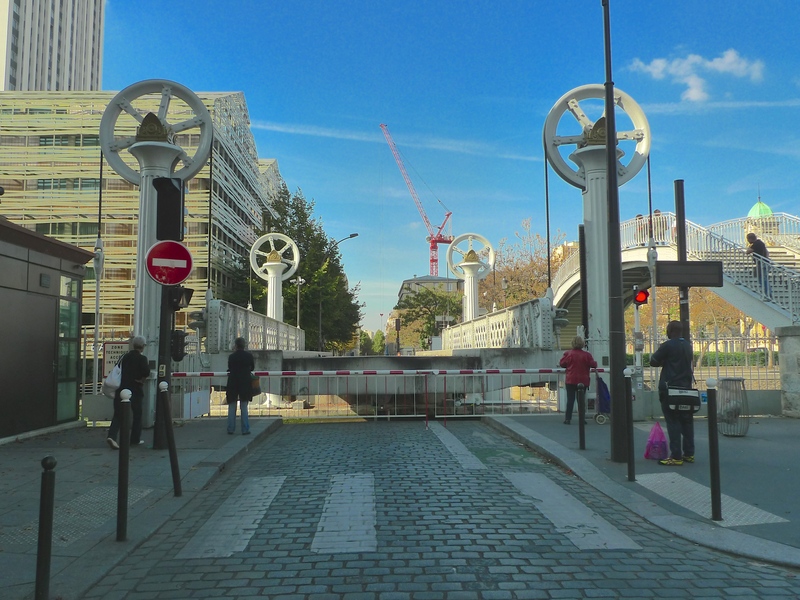 I’ve also tracked down and captured the contemporary sounds of the Pont au Change – the sounds that I believe are the characteristic sounds of this bridge. 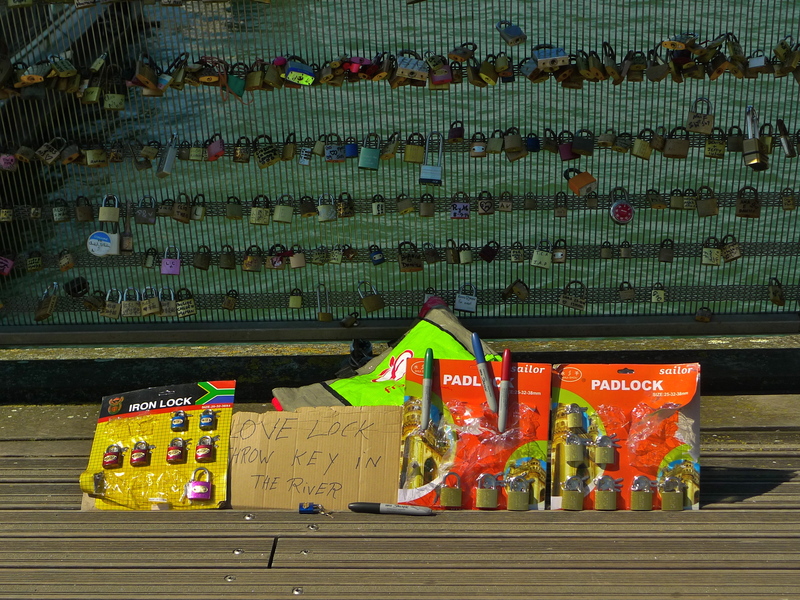 And yet, one mystery remains. 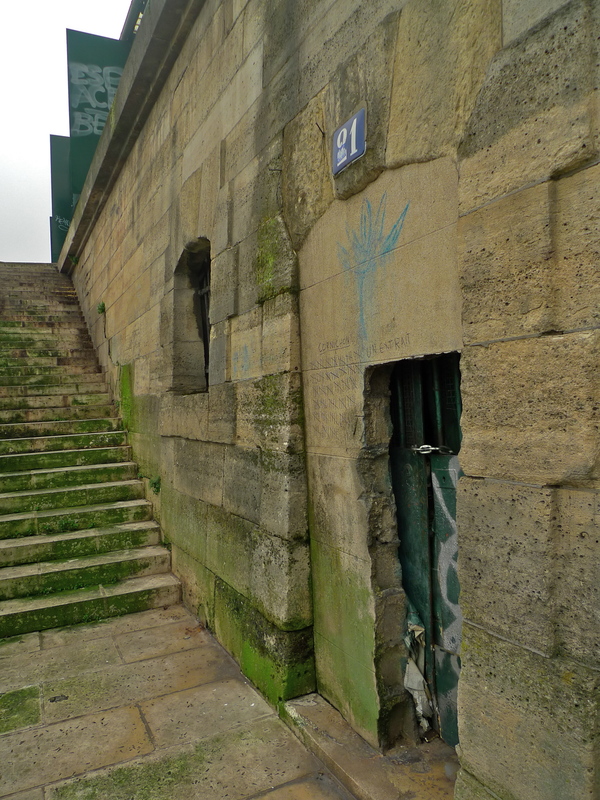 Halfway down the steps leading to the river from the Quai de la Corse are the remains of a window and a shuttered doorway in the wall. 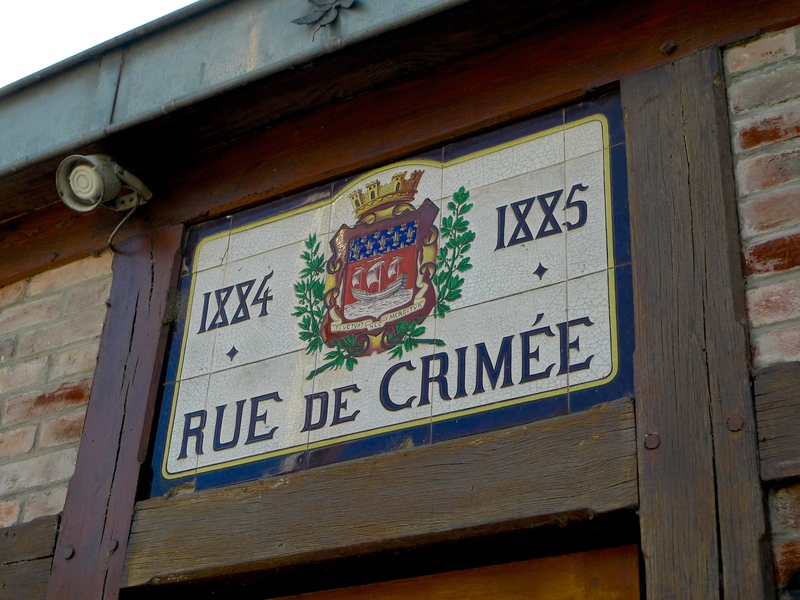 Even though there are no houses anywhere on this side of the Quai de la Corse the number 21 appears above the door. 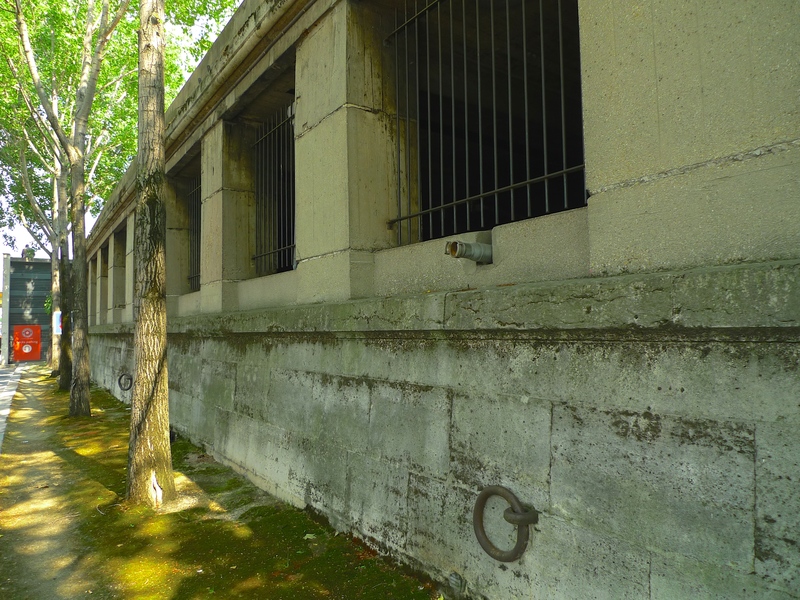 What is this place and what stories lie within? 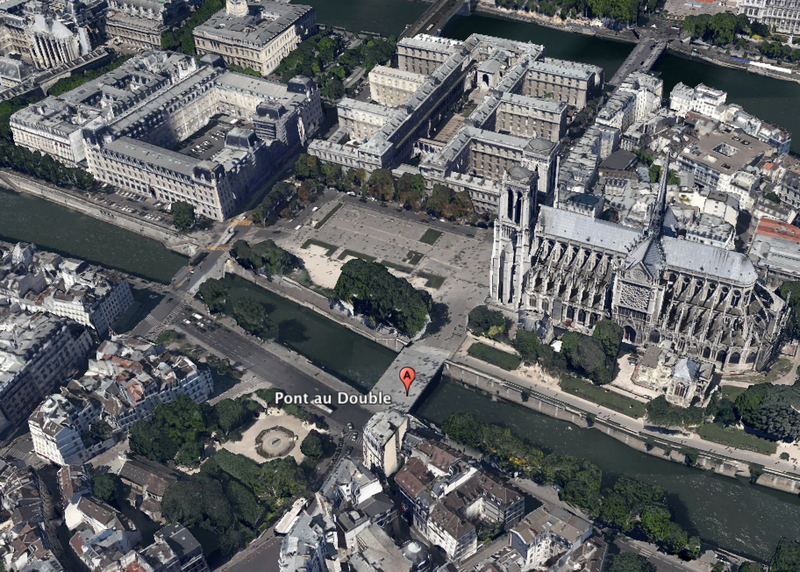 I can’t help feeling that police Inspector Javert is keeping a beady eye on it from his watery grave.